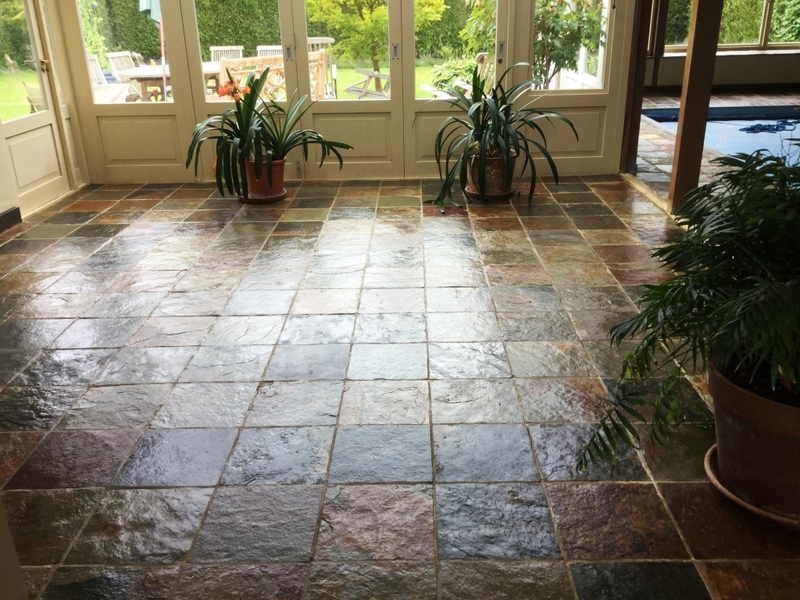 I recently visited a customer living in the village of Ravensthorpe, just outside Northampton to rejuvenate a 15-year-old multi coloured Chinese riven slate floor that needed a deep professional clean. Slate is a hard-wearing tile used for flooring high traffic areas but does need sealing to bring out its best features. In this case the sealer had long since worn off and dirt had become ingrained in the stone making it difficult to clean effectively. We discussed the client’s requirements and the cleaning process I planned to follow to rejuvenate the floor. I had to check on availability, so I e-mailed over a quote and some dates later that day. They were happy with my proposal and agreed for the work to be done whilst the customers were on holiday. My first task was to test a small area to determine which products would give the best results. In this case, I decided to start with a strong dilution of Tile Doctor Remove and Go which is a strong alkaline cleaner/coatings remover that’s safe to use on Tile and Stone. I spread this solution across a section of the floor and left it to seep into the pores of the stone and lift out the ingrained dirt. 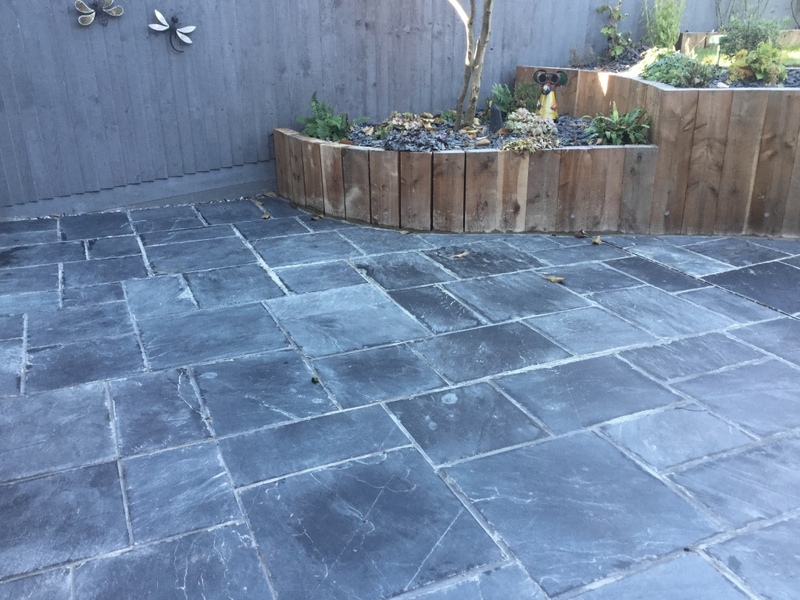 After allowing the solution adequate time to dwell, I scrubbed the slate with a carbon brush fitted to a rotary machine to gradually reveal the fantastic natural colours of the Slate hidden beneath the dirt. Happy with my choice of cleaning product I repeated this process in sections until it had been carried out throughout the entire area. Following this, I rinsed the entire floor several times with clean water, before soaking up the resulting soiled residue with a wet vacuum. The next part of the cleaning process entailed paying attention to the grout lines which were scrubbed using Tile Doctor Grout Clean-Up. The resulting residue was promptly extracted with the wet vacuum and I finished by giving the whole floor a rinse with Tile Doctor pH Neutral Tile Cleaner. This is a day to day tile cleaning product which is recommended for stone floors, many supermarket tile cleaning products are only suitable for ceramic tiles due to their acidic formula and can damage a floor over years of use so you should always read the label. However, I always leave my clients with a complimentary bottle of a suitable Tile Doctor product to maintain their floors. The floor was left to dry off overnight and I returned on the second day to seal the floor. 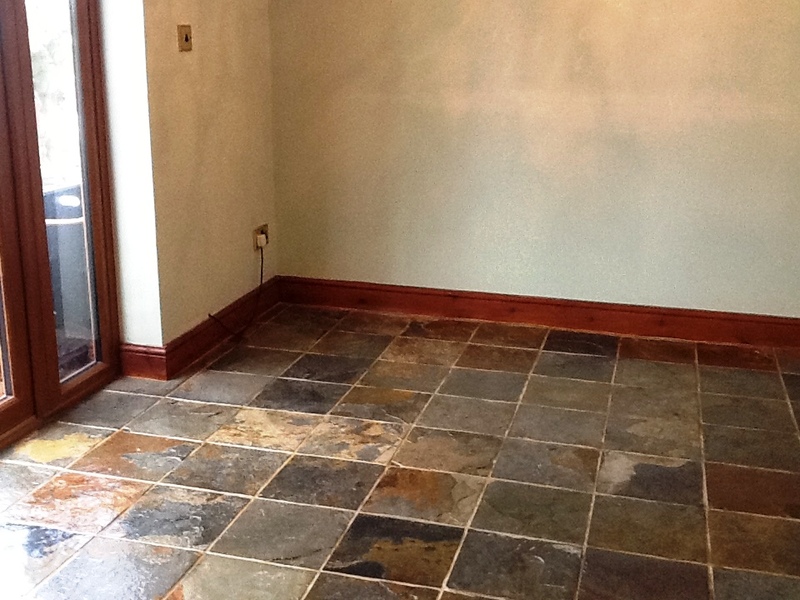 Before starting I checked the floor was dry using a damp meter which confirmed the Slate was dry and ready to seal. The floor must be completely dry before sealing as any excess moisture has the potential to the damage the performance of the sealer. Since my client had specifically requested a silk finish, I opted to use Tile Doctor Seal and Go which dries to leave a lovely subtle sheen that really enhances the look of the stone. Five coats were applied to ensure a good hard-wearing protection. My client was very pleased with the results, particularly as they hadn’t realised how much colour it had lost over the years and left the following feedback on our website. 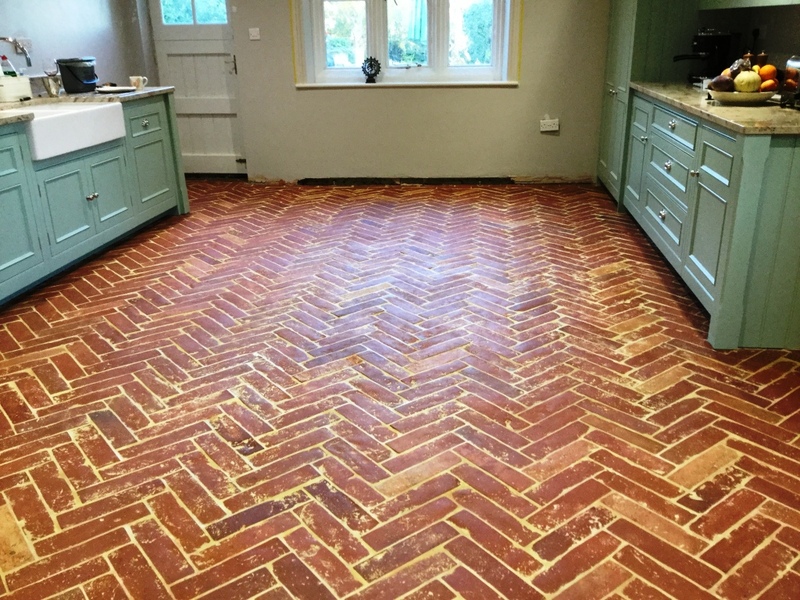 This Terracotta tiled floor was installed in the kitchen of a cottage in the small village of Maidford near Towcester. 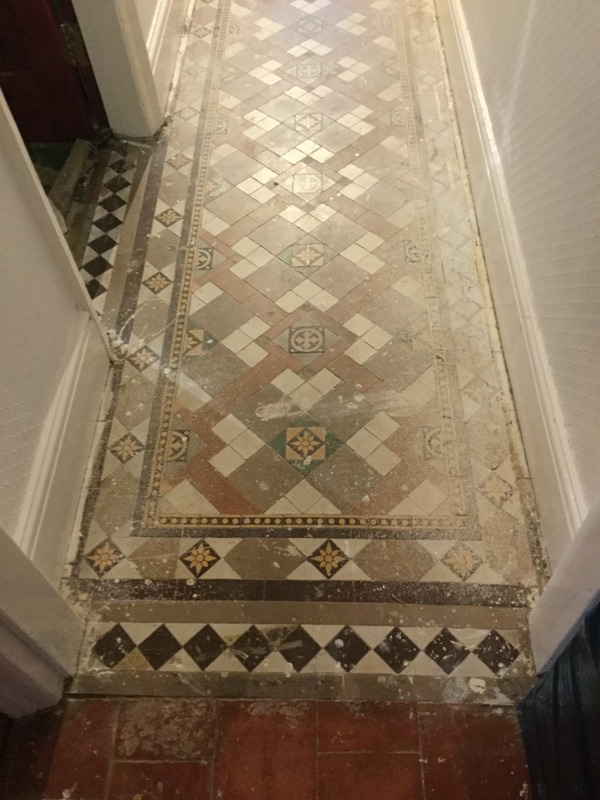 The tiles were not looking their best and the owner of the property realised it was time to do something about it and contacted Tile Doctor to have the floor stripped and resealed. Stripping and Sealing tile and stone floors is our bread and butter so I was more than happy to pop round and survey the floor which was approximately 9m2. 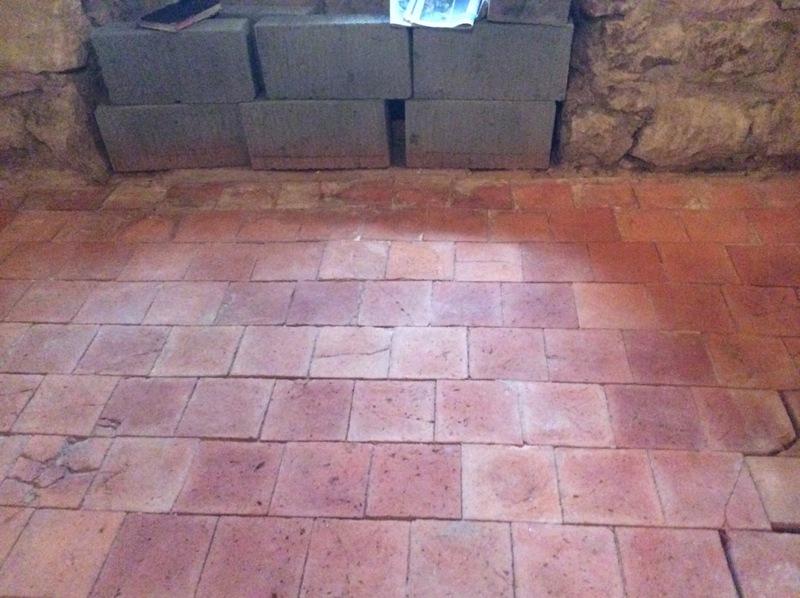 The grout had darkened with dirt and the previous tile sealer was failing so dirt was now getting ingrained in the Terracotta making it difficult to clean in places and leading to a patchy appearance. We discussed the work involved, my quote was accepted, and a date agreed for me to return and complete the work which would take two days, one to clean and one to seal. 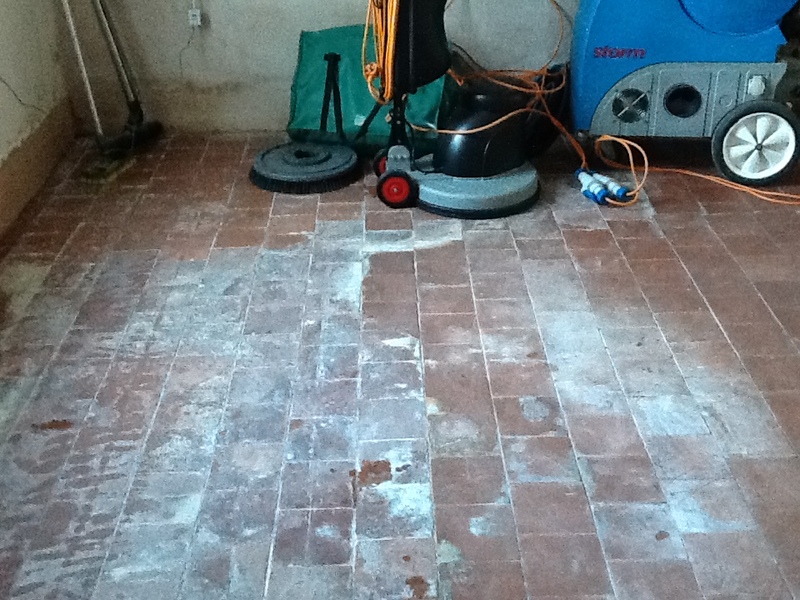 After tidying up the Kitchen and removing the kickboards from underneath the kitchen units I set about working on cleaning and stripping the Terracotta floor of old sealers. To start I tested a small area with a strong dilution of Tile Doctor Wax Away. Wax was quite often used on Terracotta so I figured this product would be a good place to start. My suspicions were proved correct, and I found this to be the best product for removing the many layers of sealant on the floor. Wax Away is a new alkaline product by Tile Doctor and ideal for cleaning clay-based tiles such as Terracotta. With my sights set on the rest of the floor Wax Away was scrubbed into the tile using a 17” rotary floor scrubbing machine and a black scrubbing pad running on a slow speed which helps to reduce splashing. This activity soon brought the dirt off the floor and the soiled cleaning solution was removed using a wet vacuum and the floor was rinsed down with clean water. The cleaning process was repeated a couple of times until I was happy with the floor, a stiff hand brush was then used along the grout lines with a dilution of Tile Doctor Pro-Clean to clean up the grout. After rinsing and extracting the floor again the floor was inspected, and I noticed there were a few stubborn paint splashes on the tiles. I managed to remove these and these by spot treating the affected area with Tile Doctor Remove and Go and a steamer to lift the stain out of the clay tile. Once happy the floor was clean it was given a thorough rinse to neutralise it and remove any trace of cleaning products and then left it to dry. 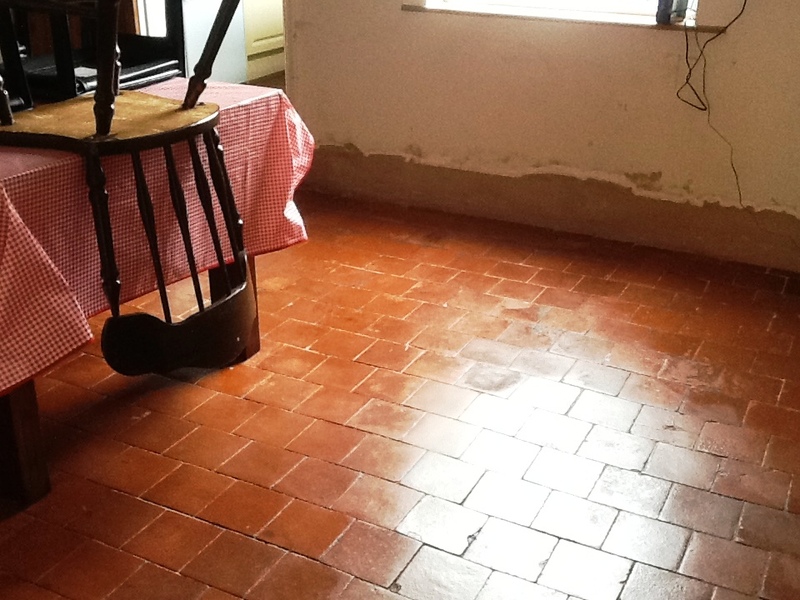 I allowed the floor to dry for several days before returning to seal the Terracotta using numerous coats of Tile Doctor Seal and Go which is an ideal sealer for Terracotta and provides durable stain protection together with a low sheen finish. Terracotta is by its nature very porous and so it’s not unknown for it to take up to nine coats of sealer, which can take some time to apply as like paint you have to wait until it’s dry before it will take the next coat. The customer was so impressed by the results I achieved in their kitchen they decided to go ahead and book me in to carry out this process throughout the whole of the ground floor which included lounge, study and hallway. 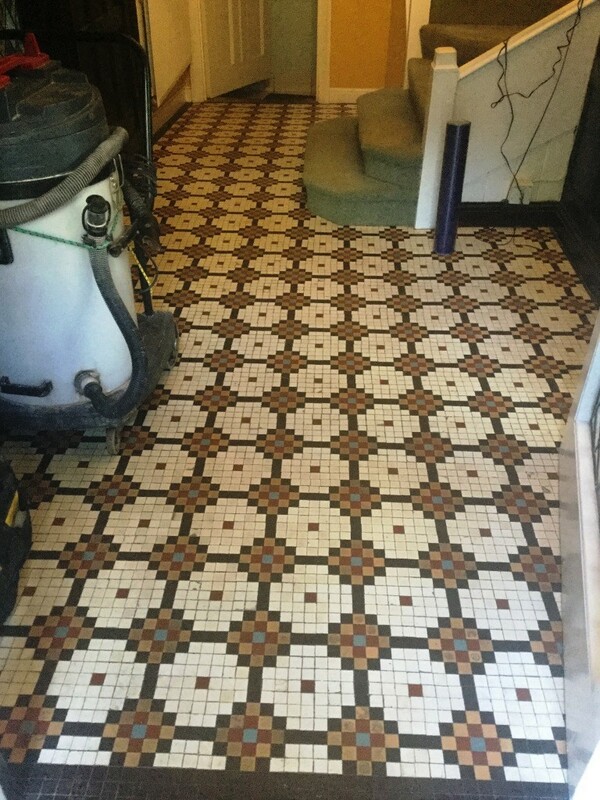 The customer called me after she had removed the lino in her hallway to discover a traditional Victorian tiled floor hidden underneath. Unfortunately, at some time in the past this floor hadn’t been protected whilst decoration was carried out and had been heavily stained with splashes of paint. Although the customer had tried her best to clean the paint off the floor, she had found it was impossible to remove. She was really keen to restore the floor back to its’ former glory and see the back of the nasty looking lino! I visited the property in Kettering which is a lovely town in Northamptonshire, approx. 15 miles from Northampton itself. The area is now very popular with commuters with regular trains heading to London St Pancras taking just one hour. As the pictures she had sent me showed the floor needed professional cleaning as no amount of household products would be able to remove the problem areas. I discussed with the customer what we could do to get the floor restored and we agreed a price for the work, scheduling it in for a few weeks later. To clean the floor, it was first sprayed with a solution of Tile Doctor Remove & Go which was left to dwell for fifteen minutes to help soften the paint. 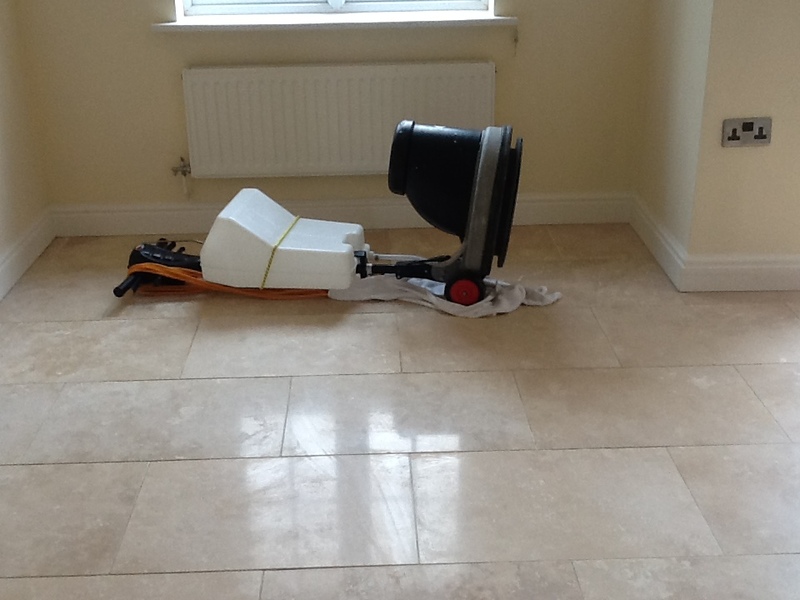 We then used our heavy-duty scrubbing machine with the appropriate attachments to scrub the floor. A little warm water was added to the solution on the floor to help remove the paint as the scrubbing was underway. Once done a wet vacuum was used to remove the slurry generated by the scrubbing process. This process was repeated several times in the most stubborn areas to ensure the floor was as clean as possible. This action removed around 90% of the paint which was a huge improvement, but more work was required before it would meet my standards. 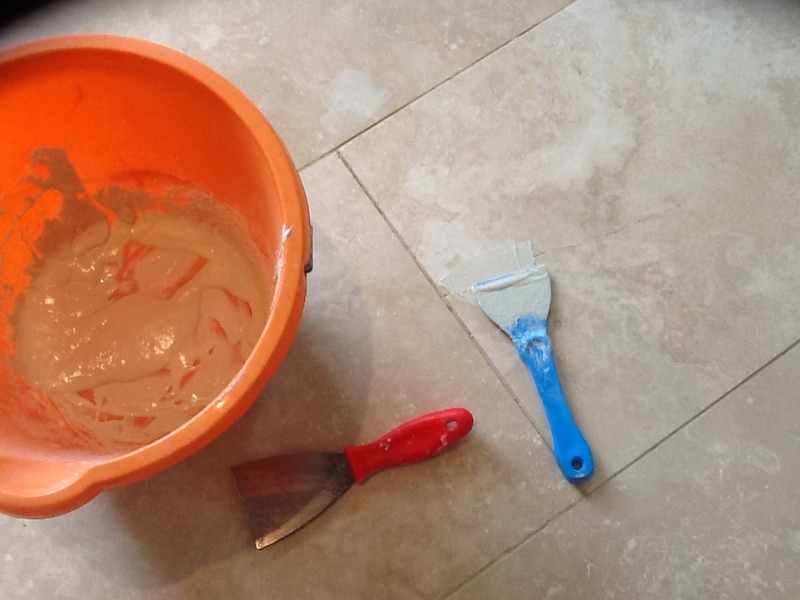 To further improve the condition of the tiles my next course of action was to apply Tile Doctors 100 and 200-grit burnishing pads to the floor with water to help lubricate. After each pad the find slurry that was generated was extracted off the floor using the wet vacuum. 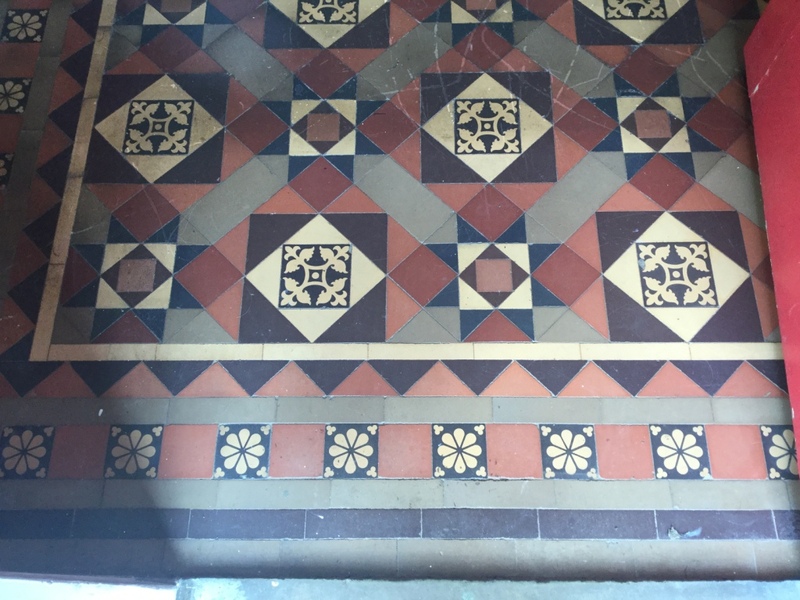 This process reconditions the surface of the Victorian tile and removed the remainder of the paint, it also cleaned the remaining areas that needed further attention leaving the floor spotless. I left the floor to dry overnight and arranged to return the following morning to complete the restoration with the application of a sealer. The customer wanted the floor to look natural so requested a matt finish sealer, also being an old floor without a damp proof membrane I specified the sealer should be fully breathable so moisture can pass up from the sub floor and not become trapped under the tile where it could cause problems. With these factors in mind we agreed on Tile Doctor Ultra Seal which ticks all these boxes. As you can see from the after pictures, the restorative cleaning process really did the trick. The colours in the floor were now nice and clear and the floor looked as it should. The customer was over the moon with the outcome, she had not expected the finish achieved to be as good. 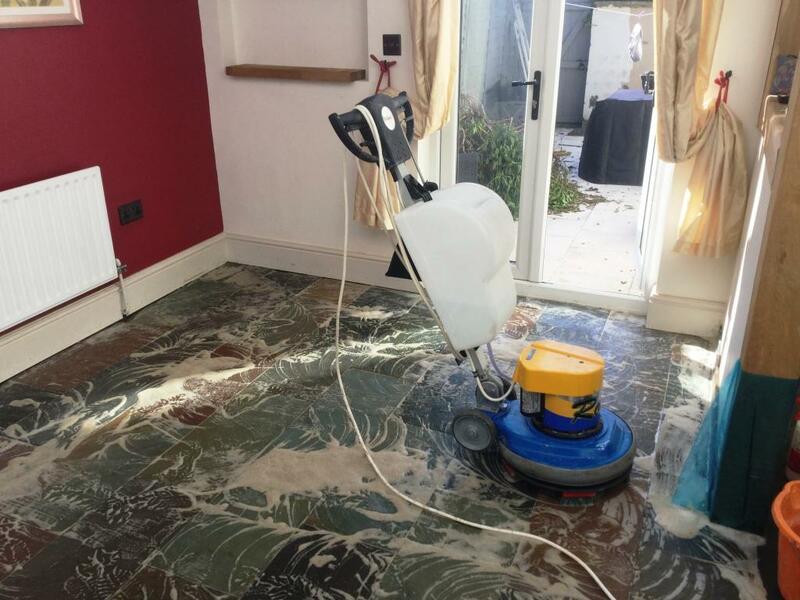 No matter how bad you think the floor is with the use of professional machinery and Tile Doctor products we can restore most floors to a high standard, which certainly in this case exceeded the customers’ expectations. 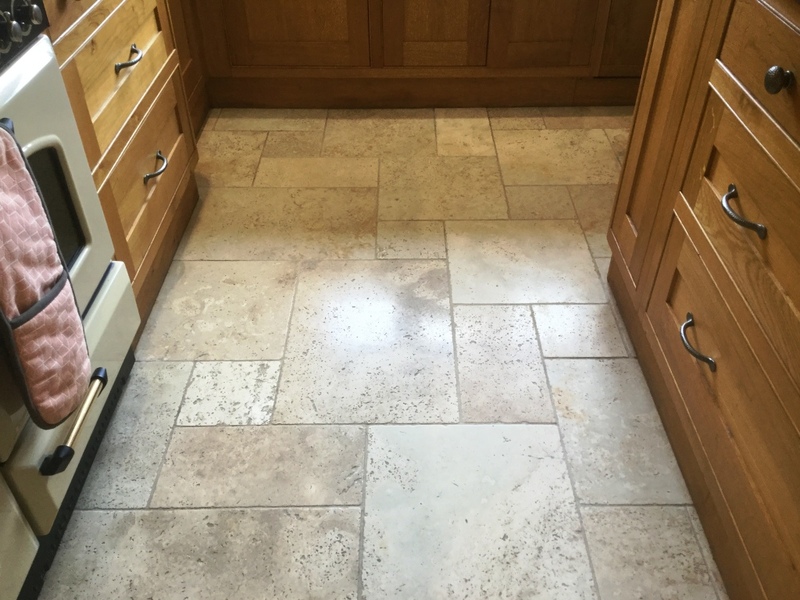 I was called by the owner of a property in Braybrooke who was keen to have their Tumbled Travertine tiled kitchen floor renovated. 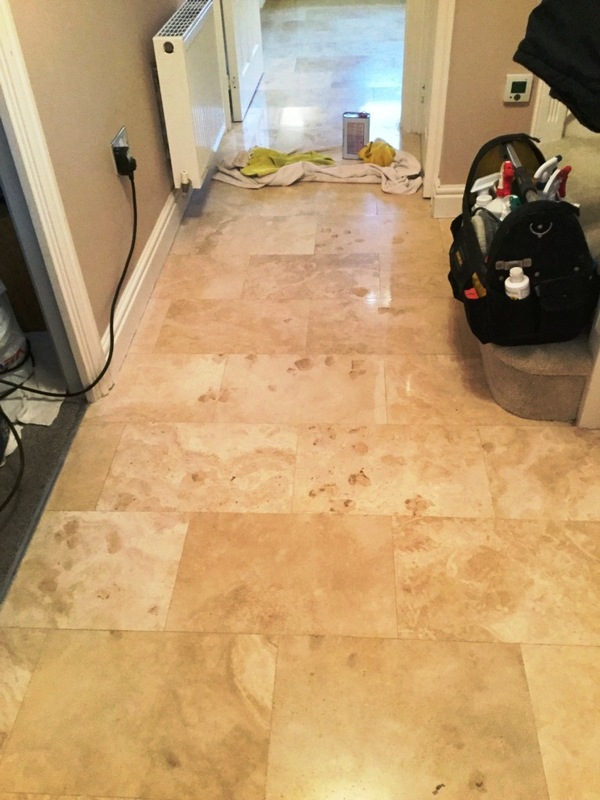 The floor hadn’t been cleaned professionally for over eight years and the owner was concerned that dirt was getting trapped in the natural holes and crevices (pits) which are a natural feature of Travertine. I went over to survey the floor at the property in Braybrooke which is a lovely small village in north west Northamptonshire halfway between Market Harborough and Desborough. 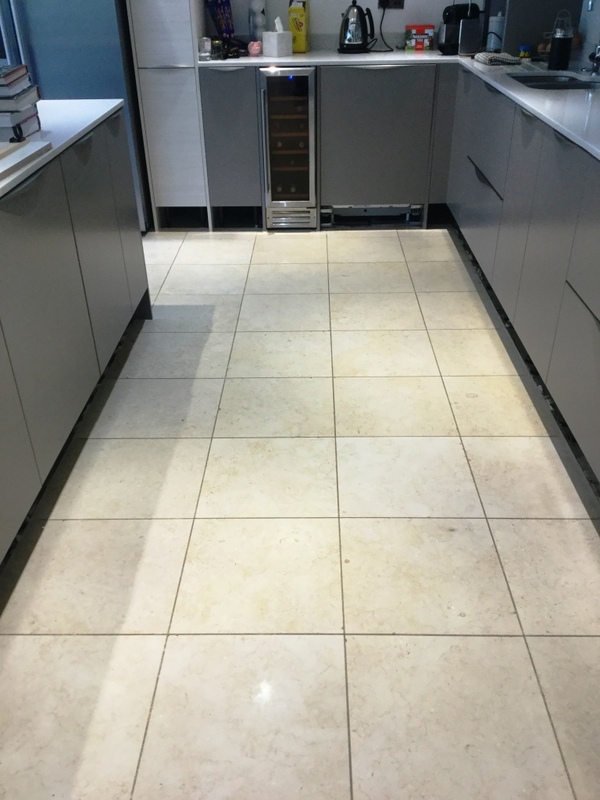 We carried out a test clean on two separate tiles in the kitchen, the customer was thrilled at how clean they came up and especially with the grout. She said it reminded her how they used to look when they were first installed. 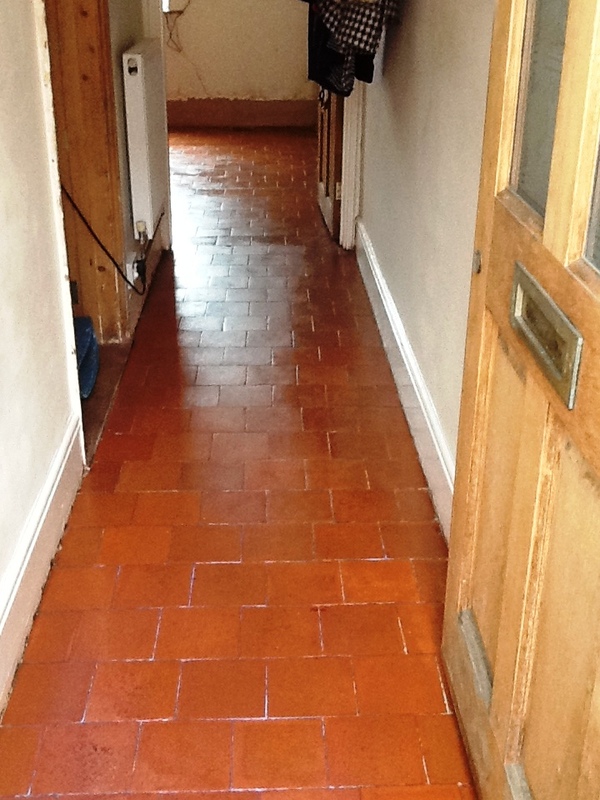 A quote to restore the floor was sent and was quickly accepted; a date was then agreed for the work to be completed. The job would take just two days to complete, one day to clean and then a return visit to seal the floor. On our return the first thing we did was to protect the kitchen units by removing plinths and covering base units and appliances with a protective film. This ensures nothing is accidentally damaged during the process. 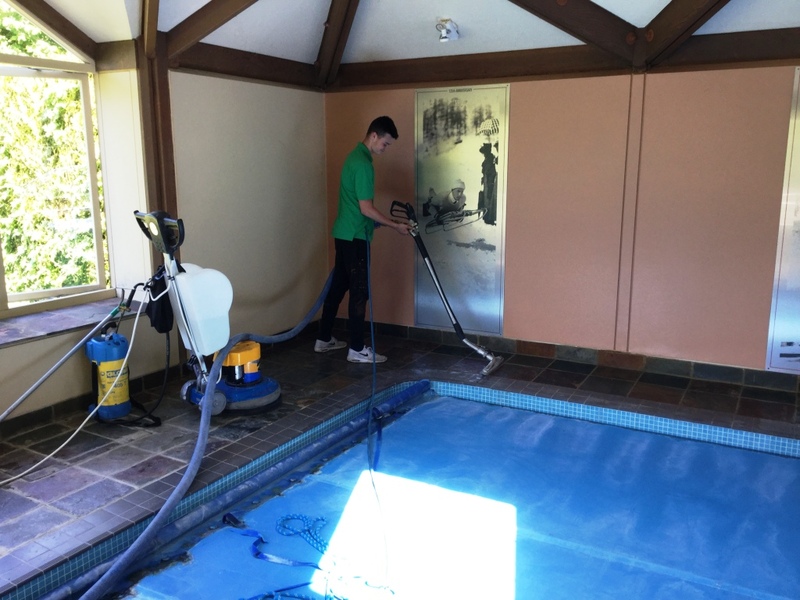 We then commenced work with a rotary scrubbing machine fitted with a tile brush attachment. This was used to scrub in a hot water dilution of Tile Doctor Pro Clean mixed 3:1. The slurry was then removed with a wet pick up, followed by cleaning the grout with hand brushes using more Pro-Clean. The strong alkaline product makes quick work of removing the ingrained dirt and grime and removing what was left of the original sealer. 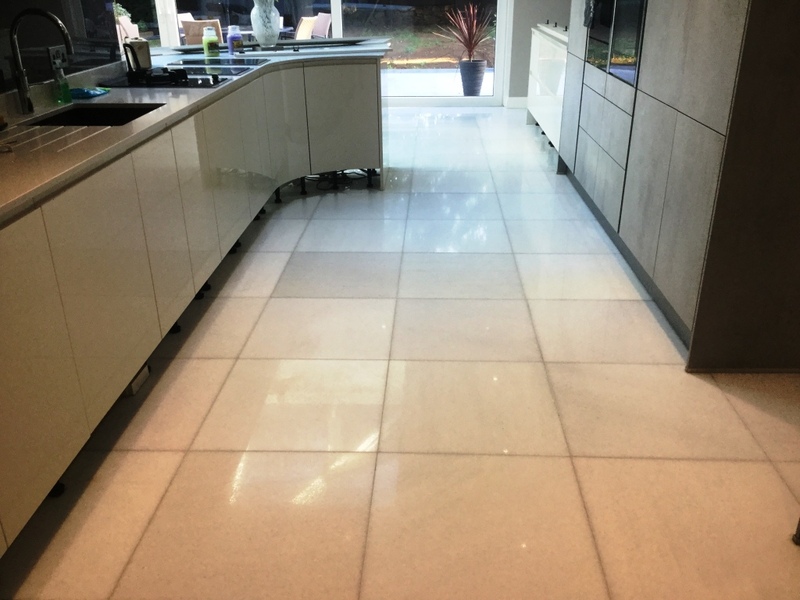 The next step was to burnish the stone with a set of Tile Doctor Diamond Encrusted Burnishing pads which polish the floor to achieve an as new look. The pads are run over the Travertine tiles with water in sequence from coarse to very smooth. After each pad is applied the floor is rinsed with water and the slurry removed with the wet pickup machine. Fans were left in place to assist drying the floor whilst I spent time filling the larger holes with filler in a colour chosen to match the existing floor as closely as possible. The floors were left to dry off fully overnight and I returned the next day to carry out the final polish with a very fine 3000 grit burnishing pad and to apply two coats of Tile Doctor Ultra-Seal which will protect the stone going forward. Ultra-Seal is a no-sheen, natural-look, penetrating sealer which is formulated to provide maximum stain protection and is especially recommended for food preparation areas like a kitchen. 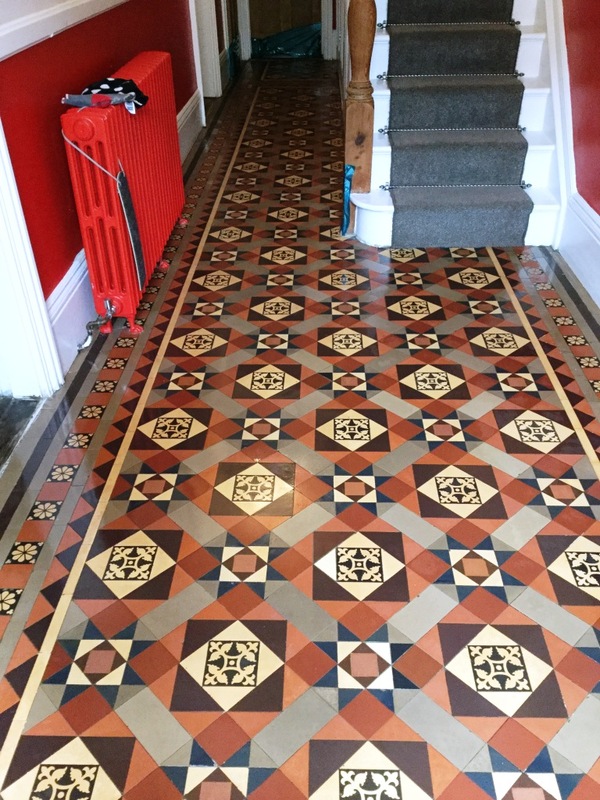 The floor looked so much better and the customer was very happy that it had been restored to its’ former glory as requested. She really thought the floor was beyond saving. We suggested that she used the Tile Doctor Stone Soap for ongoing cleaning. 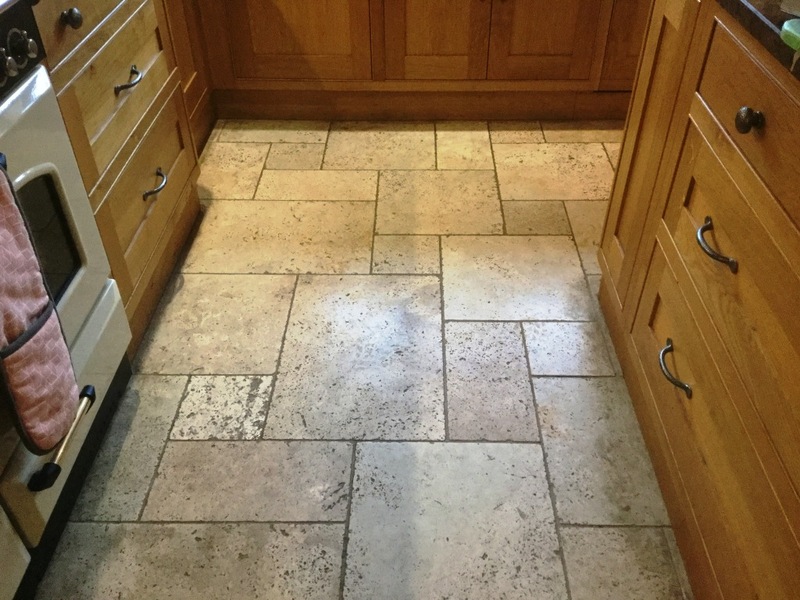 Most floor cleaning products sold in the supermarket are not recommended for the cleaning of natural stone as they can erode the sealer prematurely so always read the label. 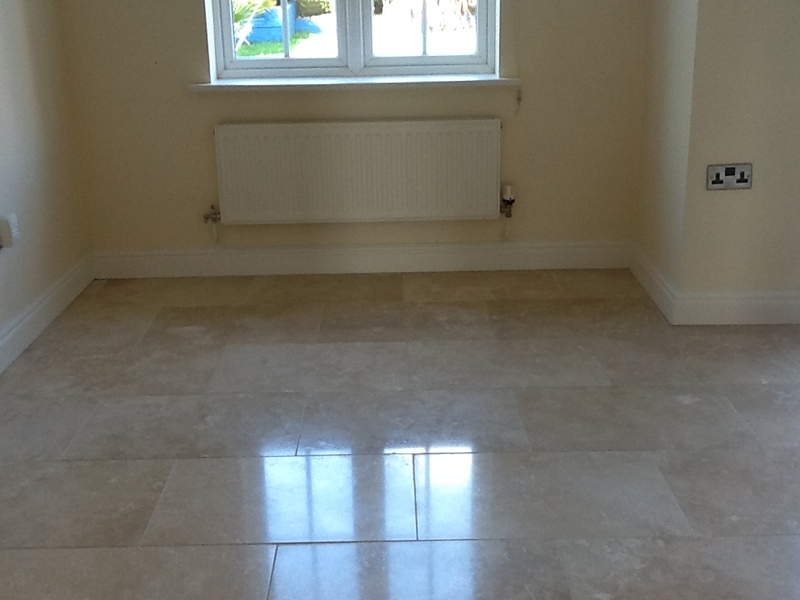 The Marble floor tiles in the pictures below covered a large kitchen, family room and utility area at a property in New Duston near Northampton. 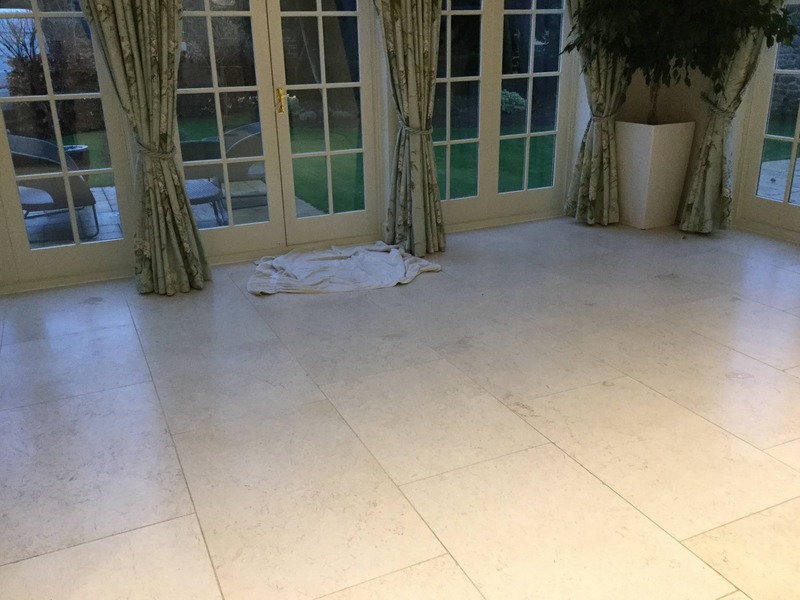 The client who was a builder had been recommended our services by one of his own clients, so he contacted us for advice on how to renovate the Marble flooring. I went to the property to survey the floor and could see straight away that the tiles were dull, lifeless with some staining and hardly recognisable as Marble. 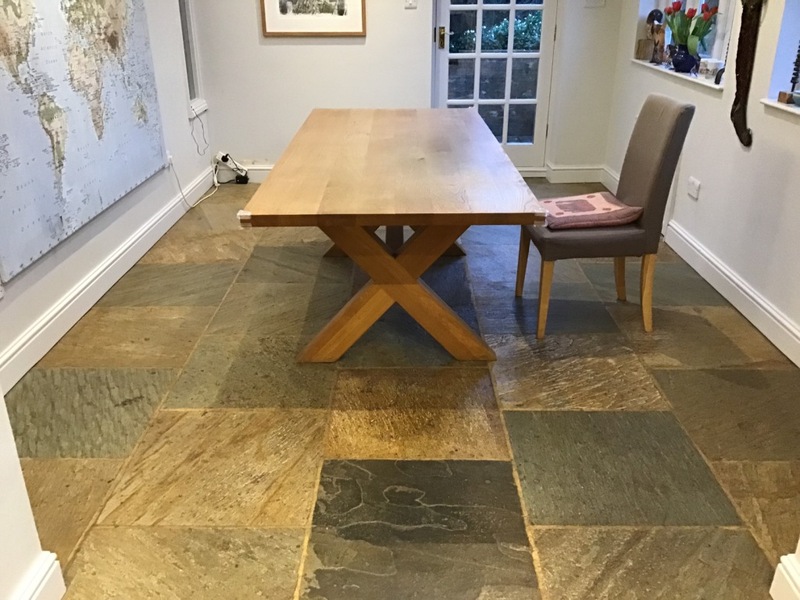 I recommended the floor was honed through a polished process known as burnishing, followed by the application of a sealer to provide durable protection for the stone. I organised a quote which was accepted, and we arranged a date for the work to start. Apologies in advance for the quality of the photographs, it’s tricky this time of year when the light is failing to capture a good photo. I began the burnishing process, which involves the application of a set of Tile Doctor diamond encrusted burnishing pads attached to a 17” rotary machine. 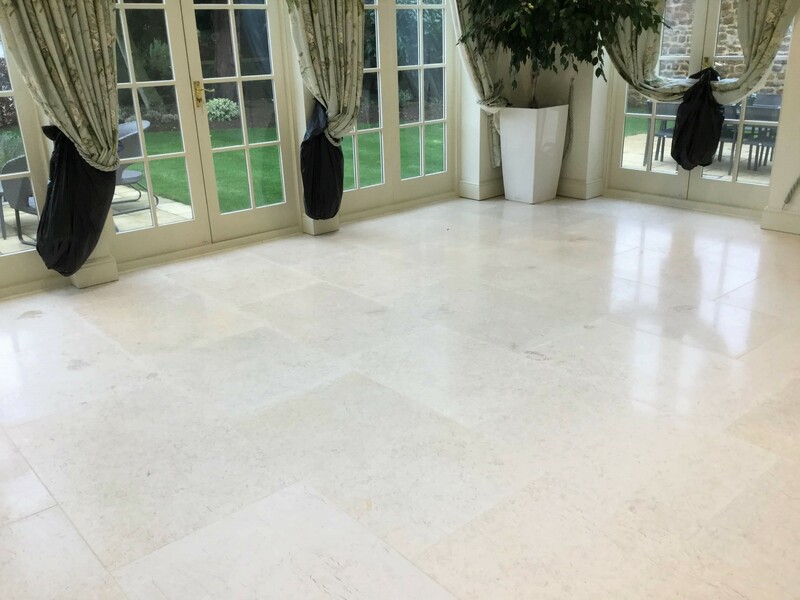 At Tile Doctor we work with a four-pad system that allows us to gradually refine the polish on suitable stone floors which generally including Marble, Travertine and Limestone. I started the process by applying a 400-grit coarse burnishing pad lubricated with a little water, working in small sections. Following this, I worked my way through the burnishing system, repeating the process with 800-grit medium and 1500-grit fine grit burnishing pads. I also used some small hand-held burnishing blocks in the difficult to reach corners and edges. The floor is given a quick rinse using a wet pick up machine between pads in order to remove the resulting slurry before starting with the next pad. I left the floor to dry off overnight to give the Marble tile and grout time to dry and returned the next day to finish the polishing and seal the floor. The last 3000-grit pad builds up a high polish on the floor and is applied dry with only a little water squirted on the tiles in a process we call a Spray Burnish. One of the advantages of this method is it leaves the floor dry so is ready for sealing. 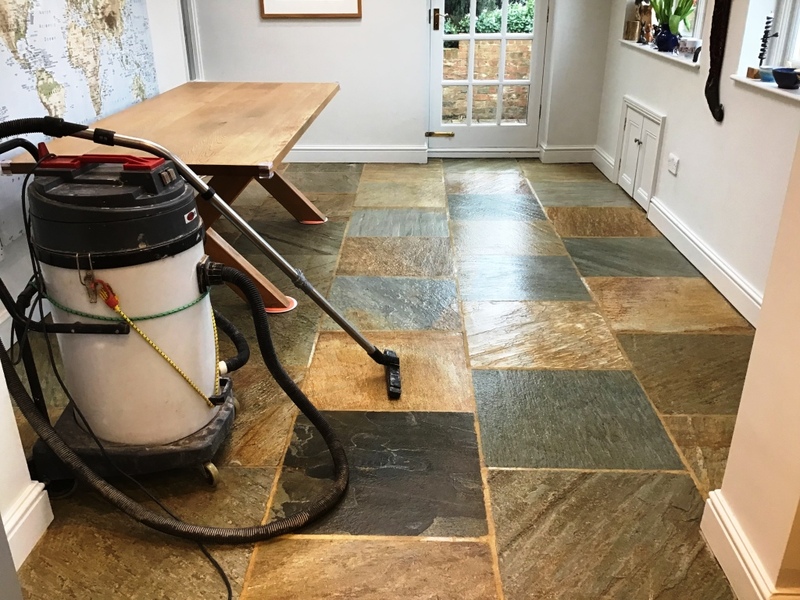 Now that I had achieved a good level of shine, I then proceeded to seal the floor to protect the stone against future dirt, stains and damage, which is more common in busy areas of a house like the kitchen. I applied two coats of Tile Doctor Ultra Seal allowing drying time between each coat. This is a no-sheen, natural-look, penetrating sealer which is formulated to provide maximum stain protection, especially in food areas such as the kitchen. Once the sealant had hardened, I ran over the floor with a white buffing pad to further enhance the look of the Marble floor. The customers were extremely happy with the results and as with all customers I advised on the best maintenance for their floor and provided a complimentary bottle of Tile Doctor Stone Soap to help them maintain the beauty of their floor. 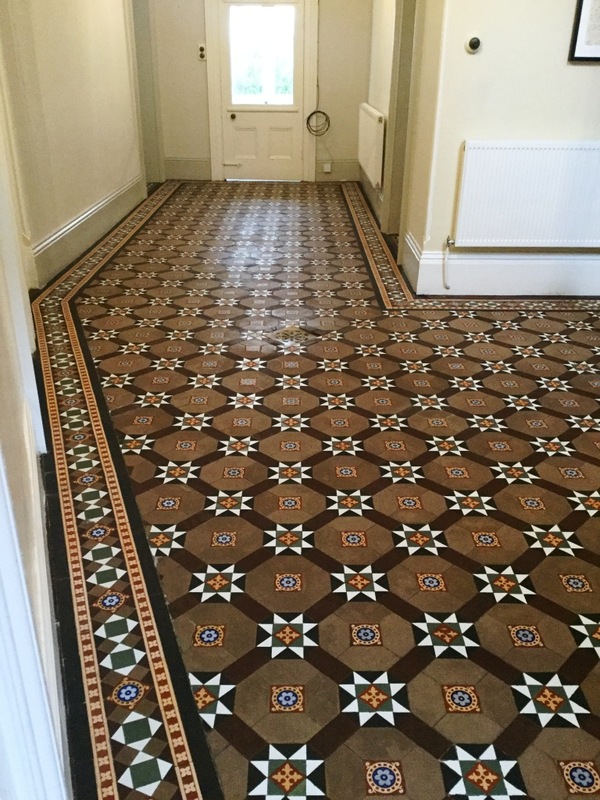 My customer recently got in touch and requested a site visit to look at her hallway floor. The Edwardian property was situated in the Abington Park part of Northampton which is an area is steeped in history, with the nearby Manor House said to have been the home of William Shakespeare’s daughter Elizabeth Bernard. The house has since been turned into a museum. 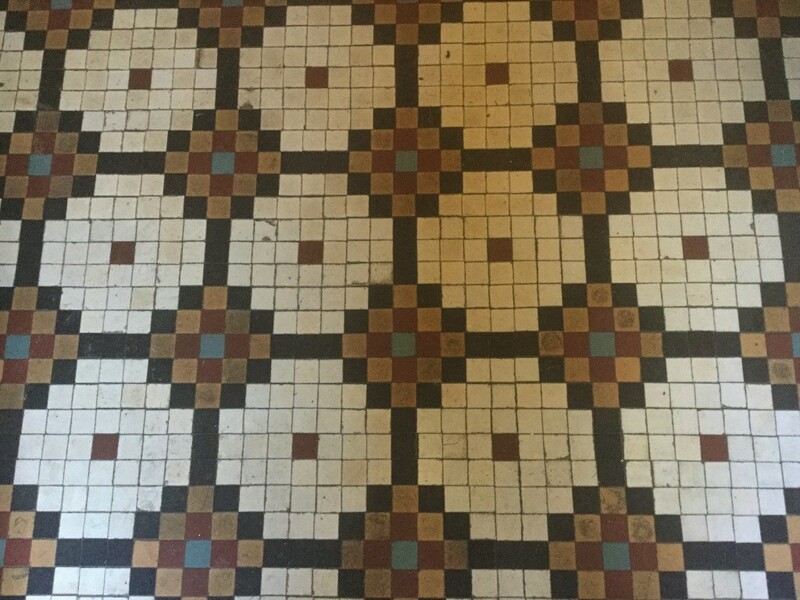 As you can see from the photos, the floor which was laid when the house was built over 100 years ago using small square brown and beige mosaic tiles in a repeating. Although in good physical condition for its age the floor was looking a little tired and had lost its lustre and vibrant colour. The hallway also had stained wood panelling on one side which was another original feature and the owner of the property was keen to maintain the period feel. I discussed with the customer what we could do to restore the floor, explaining the process, timescale and of course the cost. She was happy to go ahead so we scheduled the work in without delay. In order to protect the wall panels and keep the moisture in the floor to a minimum I decided to keep the use of cleaning products to a minimum. This is always a concern with these old floors which have no damp proof membrane as the use of too much water can lead to efflorescence salts appearing later. 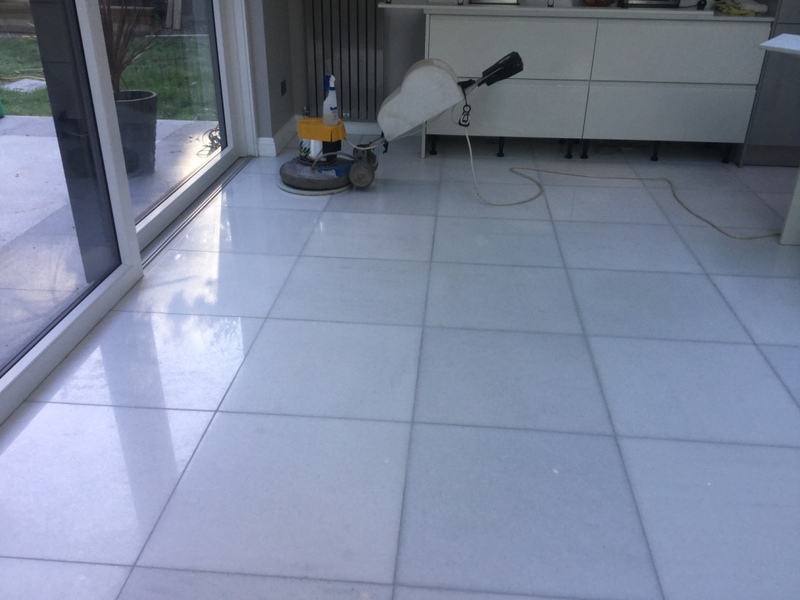 With this in mid I decided to clean the floor using Tile Doctor burnishing pads as these pads only require a small amount of water and no products, this would also have the benefit of slightly levelling out the surface of the tiles. My first course of action was to vacuum the floor to ensure there was no loose debris followed by masking up the bottom of the stairs carpet to protect it. I then started the restoration process by using a coarse 100-grit Tile Doctor burnishing pad attached to a 17” industrial rotary machine and a small amount of water to lubricate the process. The 100-grit pad is quite an aggressive pad which removes deeply imbedded stains and as mentioned before a small amount of unevenness. To remove the resultant slurry the floor was rinsed with a small amount of water which was then extracted using a wet pick up machine. This process was then repeated with a 200-grit burnishing pad to smooth out any scratches and polish the tile ready for sealing. Although it was a relatively small area, 12 square metres this process took the whole day as we work in small sections at a time. Moving the machine slowly with multiple passes over each area. I returned the following day and assessed the floor to ensure we were happy with the result from the previous days cleaning. I also took damp meter readings and was pleased to see they were within normal expectations for a floor of this age. Next, I applied Tile Doctor Colour Grow Sealant which is a breathable sealant that will allow any moisture in the sub floor to rise though the tile. 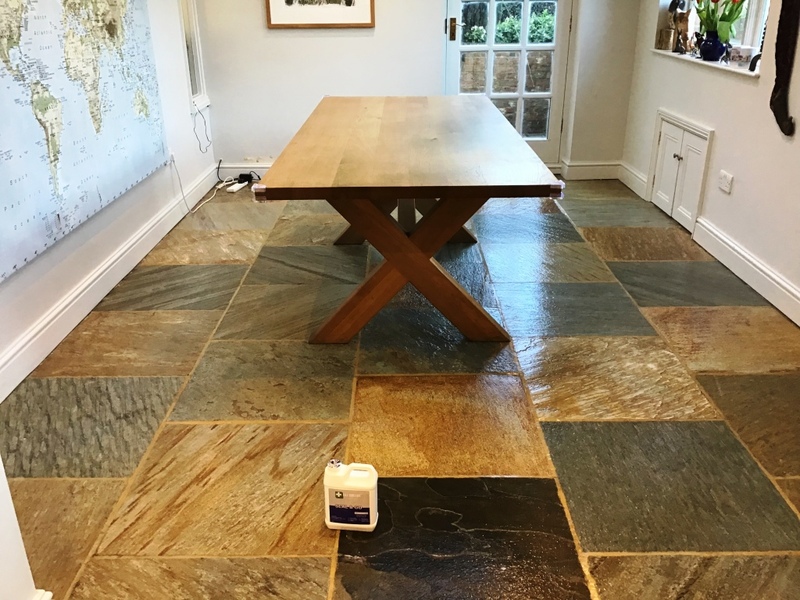 This particular sealer is a colour enhancing sealer that protects and improves the natural colours in the tile and leaves a lovely natural finish. The floor now has a much more even finish and will be much easier for the client to maintain in the future. The customer was very happy with the results and left the following feedback on the Tile Doctor feedback system. 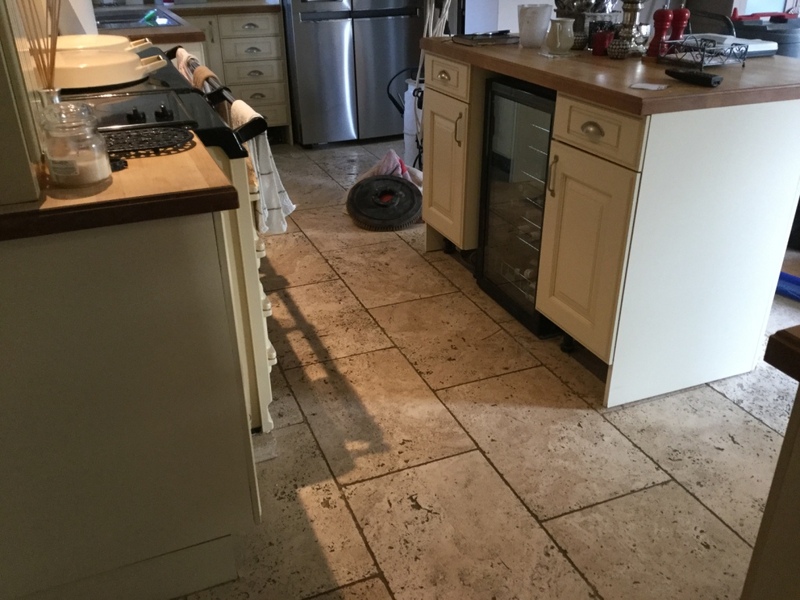 These photos are of a Limestone tiled floor which was installed in the Kitchen of a property in the small parish of Clipston, which is close to the towns of Market Harborough and Daventry, approximately three years ago. The customer was never very happy with it since it was laid as it never seemed to look clean asked me to cover over and work out what could be done. On my initial visit I soon realised that the installer had not cleaned off all the grout from the tiles before applying the sealer. This effectively trapped the grout under the sealer and gave the whole floor a dirty appearance, this explained the problem the customer was frustrated with as she could never ever seem to get the floor looking clean. 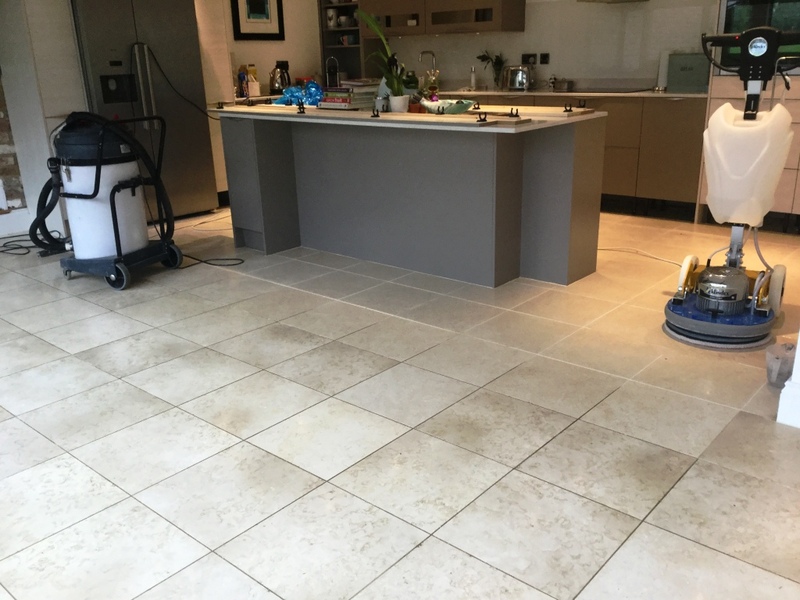 This issue is known as Grout Haze or Grout Smears and is a problem we often come across where the floor has been laid without the excess grout residue being completely polished off the tiles after the grouting. Some manufacturers recommend the tiles are sealed before grouting to make it easier to polish the grout off later. After discussing how we could remedy this I issued a quote which the customer accepted, and we scheduled the work to be done. I arrived on site on the arranged date, as it was a painted kitchen it was not possible to mask up the units, so I used a small hand-held polishing machine fitted with a six inch 400-grit burnishing pad to carefully clean around the edges and break through the sealant. 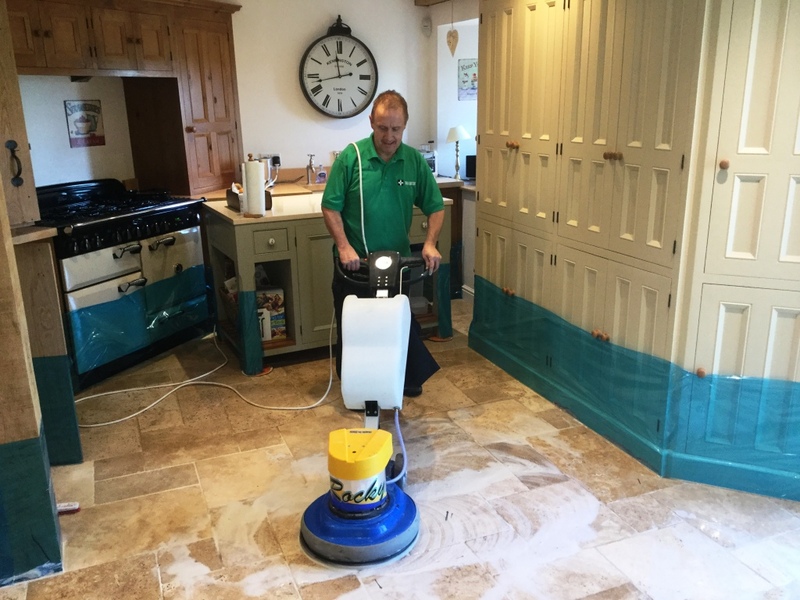 This process was then repeated with a larger seventeen inch 400-grit burnishing pad fitted to a floor polishing machine throughout the rest of the area. Once the original sealant had been removed using the burnishing pad the next step was to remove the Grout Haze by given the floor an acid wash with Tile Doctor Acid Gel. Being a gel, this product is easier to control than a liquid and sits on the surface where it’s needed to break down the unsightly Grout Haze. It’s left to dwell for a short period before being worked in with a special brush that is designed for this purpose. The resulting slurry is then removed with a professional wet pick up machine and the floor given a rinse with water to remove any trace of the product. 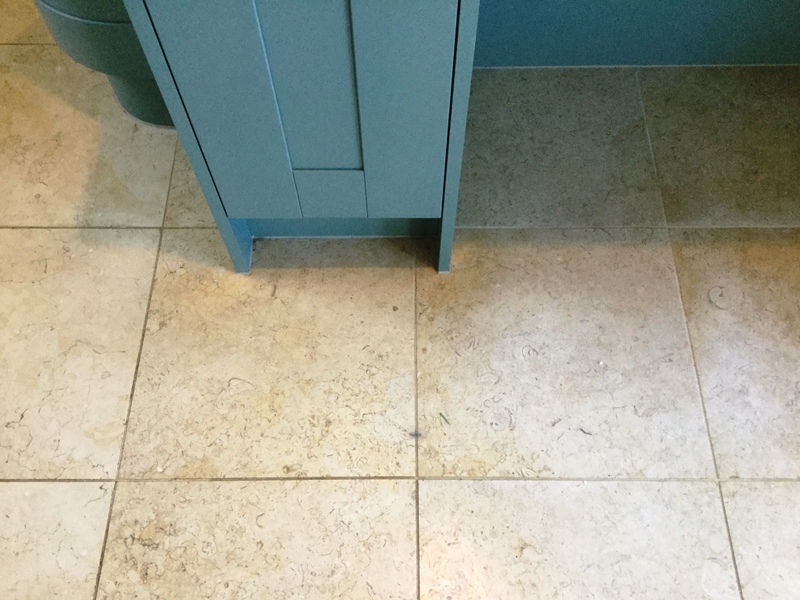 After treating the Grout Haze my next step was to refine the surface of the Limestone using a medium 800-grit and fine 1500-grit diamond encrusted burnishing pad which are applied with water and restore the polished appearance of the stone. The floor is rinsed with more water between the application of each pad to remove the slurry that is generated and then dried with the wet pickup machine. I returned the following day to buff the tiles with a white polishing pad as the customer didn’t want a high shine finish which is normally achieved with the 3000-grit diamond burnishing pad, this gave a low sheen honed look as the customer had requested. The floor was then sealed with two coats of Tile Doctor Ultra-Seal which is a natural look sealer that and will protect the newly restored and polished tiles going forward. The customer was very happy with the results and has left the following positive feedback on our website. 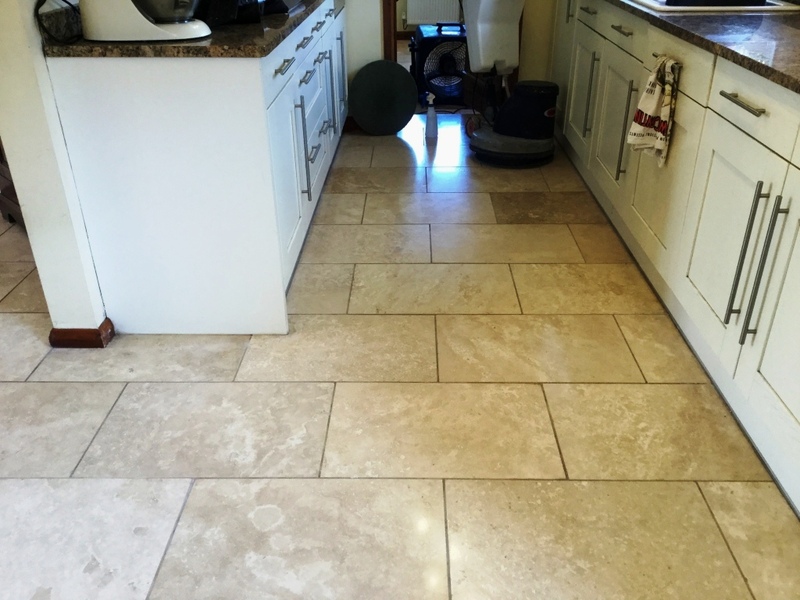 I gave the customer some tips on maintenance and a complimentary bottle of Tile Doctor Stone Soap to enable her to keep the floor looking its best, this product is designed for the regular cleaning of polished stone floors and is pH neutral, so it won’t prematurely degrade the sealer. This customer called me as she was concerned about the scratches on her hallway tiles, they were not only unsightly but were also starting to trap dirt. The Victorian property in Rushden which lies between Bedford and Kettering on the east side of Northamptonshire. We always offer a site visit to take a look at the job before doing any work, that way we can discuss what the cleaning options are, and it also demonstrates to the customer that we know what we’re talking about. 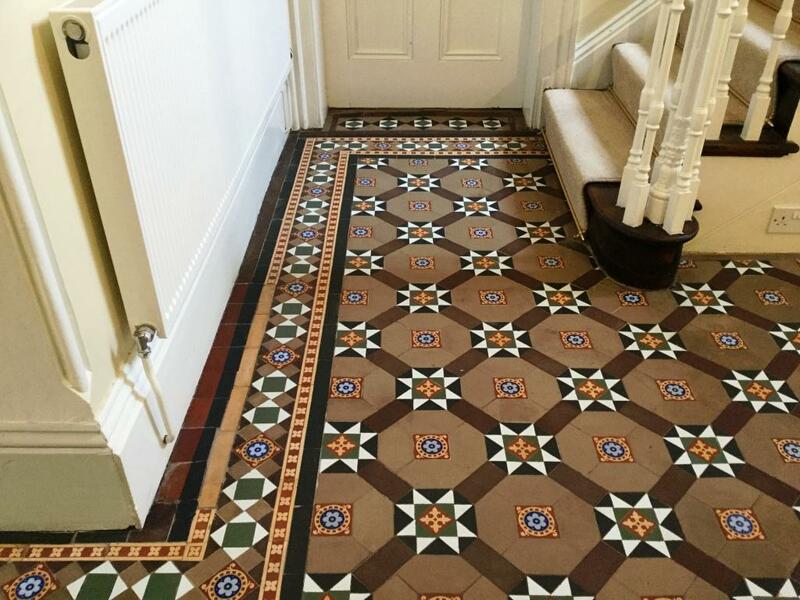 The hallway floor was a lovely and intricate example of Victorian tile installation and I could see that overall it was in good condition for its age. On closer inspection the customer was relieved to find out that it was the old wax sealant breaking down and not actually scratches on the tiles. I carried out a test on a small area to ascertain how difficult it would be to remove this wax. I realised I would be able to use Tile Doctors new product for the removal of the wax sealant, Tile Doctor Wax Away which is a fast and effective formula that is designed just for this type of job, it offers safe removal of wax and polish from tile and natural stone. We agreed the quote and the work was booked in for the following month. On our return we started to remove the wax coating using the Tile Doctor Wax Away product. It was applied neat and left to dwell for ten to fifteen minutes before working it into the floor with a small amount of water and a black stripping pad attached to a rotary machine. The resulting slurry was then removed using a wet vacuum. The floor was then inspected, and I decided to repeat this process with a hand brush in a couple of small areas and around the edges to ensure the old wax sealant was fully removed in these stubborn areas. The floor was then rinsed with water to remove any remaining slurry and trace of cleaning product and the wet vacuum was used to dry the floor again. My next course of action was to run over the floor with a 400-grit burnishing pad to remove imbedded dirt and stains from the tiles, this was followed by a second rinse with water. After removing the water with wet vacuum, the floor was then left to dry out fully for a few days aided by a large fan that I left on site. 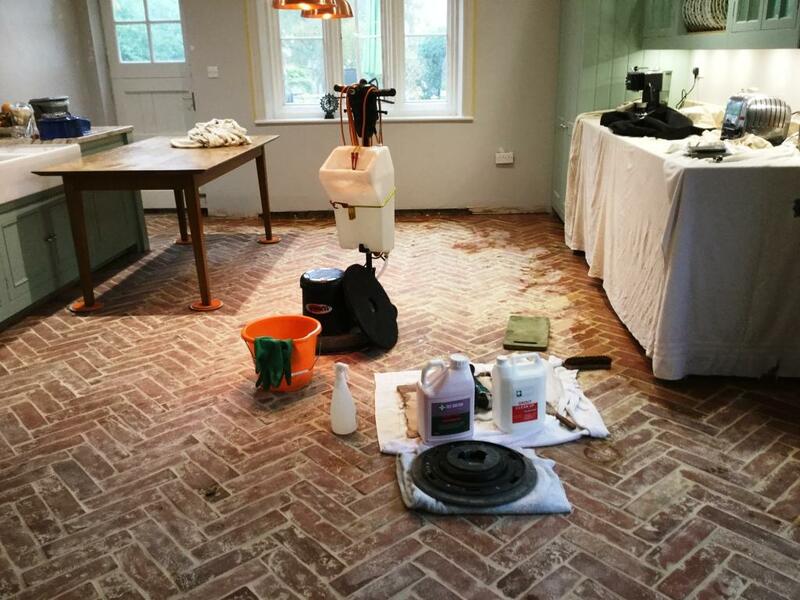 It’s important that the tiles are fully dry before applying a sealer and this is even more important on older floors where no damp proof membrane has been installed. I returned three days later and started by giving the floor a light vacuum and clean. I also took damp meter readings to check the floor was fully dry. Once I was satisfied I started to apply 2 coats of Tile Doctor Colour Grow Sealant, this is a breathable sealant which will allow the tiles to breath and allow moisture vapour from the sub floor to rise through the tiles which is important in these old houses where no damp proof membrane exists. Colour Grow is an impregnating sealer that works by occupying the pores in the tile thus preventing dirt from becoming ingrained there, the sealant enhances the natural colours in the tile and dries to a lovely natural matt finish. 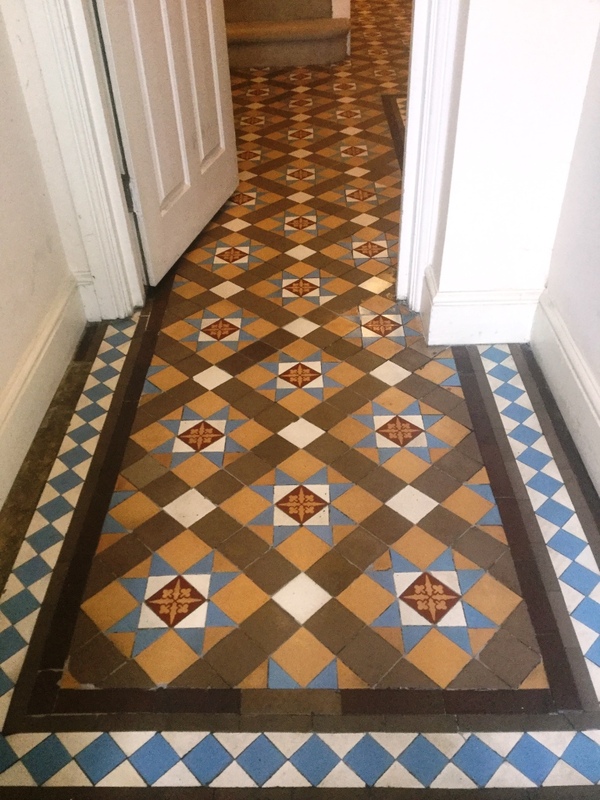 Once finished the floor looked great and the customer was hugely relieved that the tiles could be restored easily and cost effectively, she had thought the damage may have been irreversible. Moving forward it will now be easier for her to maintain and keep clean. The floor is now back to its’ true self and properly in keeping with the rest of the period features in the house. The scorching hot summer has meant we are all in the garden and making much more use of our outside spaces. 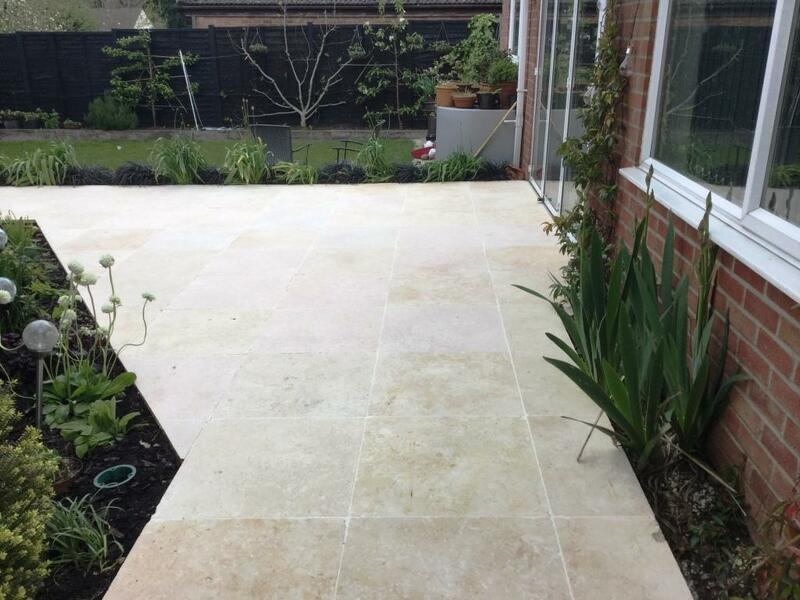 Our client got in touch because her Indian Sandstone patio was looking a little unloved. Looking forward to entertaining outside it was time to bring it back up to scratch so it wouldn’t be an embarrassment. This house in Northampton which is the county town of Northamptonshire, lying on the River Nene it is one of the largest towns in the UK, had a lovely large patio. 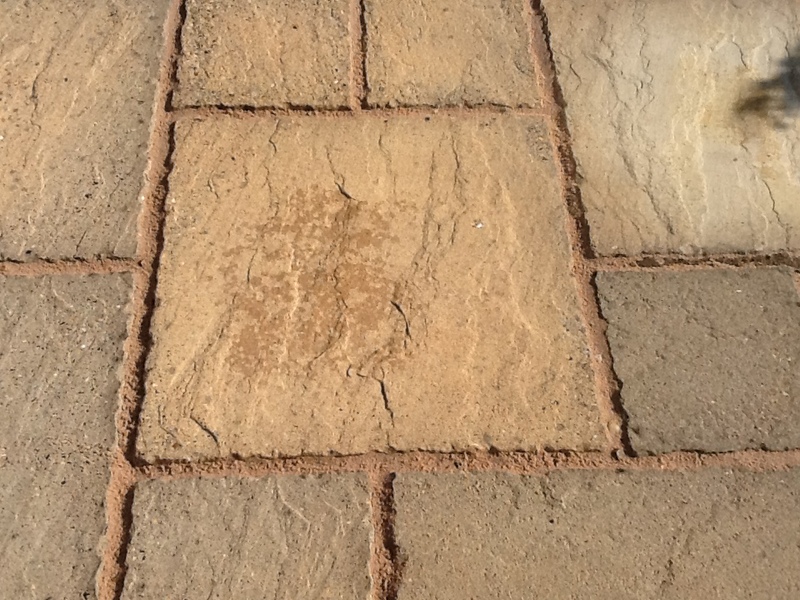 The Sandstone paving was looking tired and dirty, it was covered in lichen, embedded soil and was missing grout. 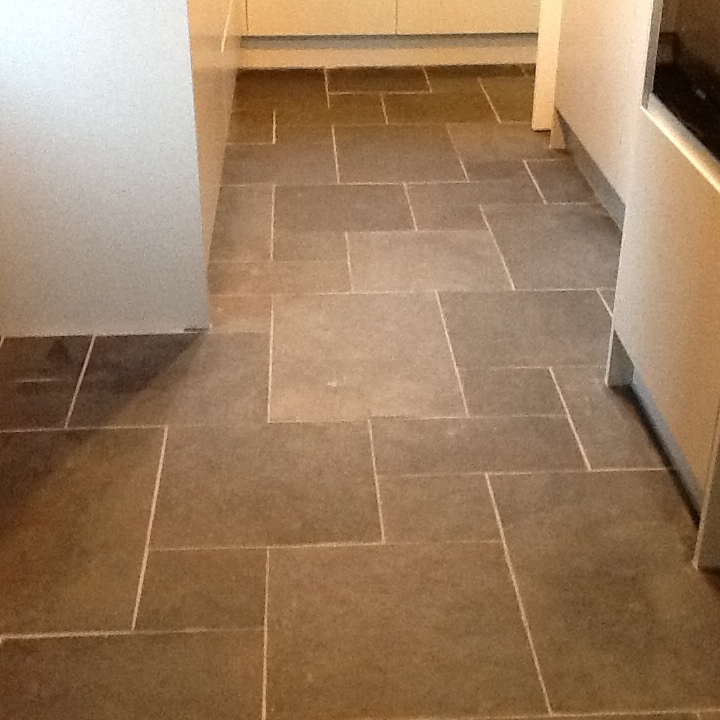 I discussed with the client how Tile Doctor could help, and she agreed to go ahead so I returned a few days later. 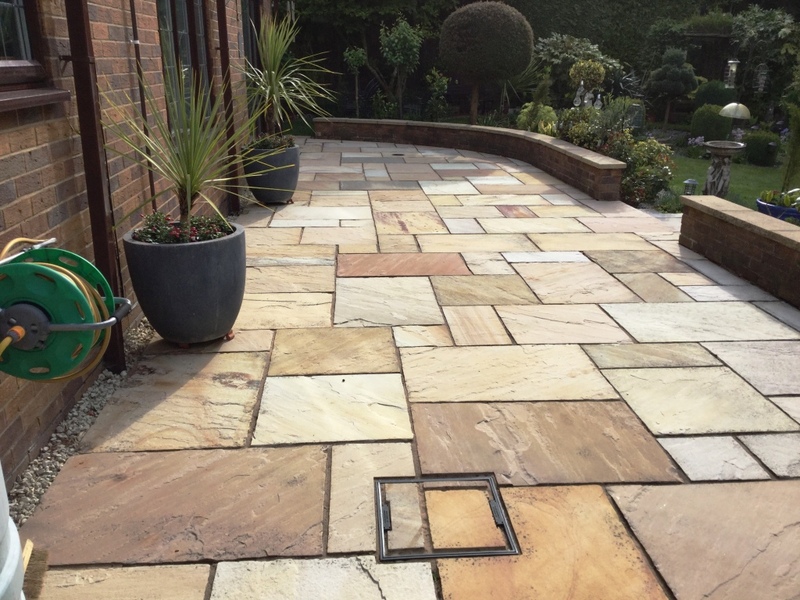 Indian Sandstone is a very hardwearing material, but one of the biggest problems we find with stone flooring outside is it soon becomes stained by the elements, especially with our great British weather, sun, (acid) rain, and ice. Without its’ protective sealer porous stone quickly becomes ingrained with dirt making it increasingly difficult to clean effectively. I pre-treated the entire are with a medium dilution Tile Doctor Pro-Clean and left it to dwell for about 15 minutes, so it started breaking down the soil. This is a highly concentrated multi-purpose high-alkaline cleaner which is great on heavily soiled areas, breaking down the dirt and the lichen. This was then scrubbed in using a rotary machine and stiff buffing brush. This was followed by pressure washing and rinsing the entire area with water, removing the soiled waste with a wet vacuum. It is always a little easier carrying out this type of messy job as we are outside. This process took much of the day to complete and got the Indian Sandstone tiles really clean. They were already looking good and had changed from a dull grey colour to a lovely warm beige. I allowed a few days for the area to dry and then returned to finish renovating the patio, thankfully the weather remained dry! 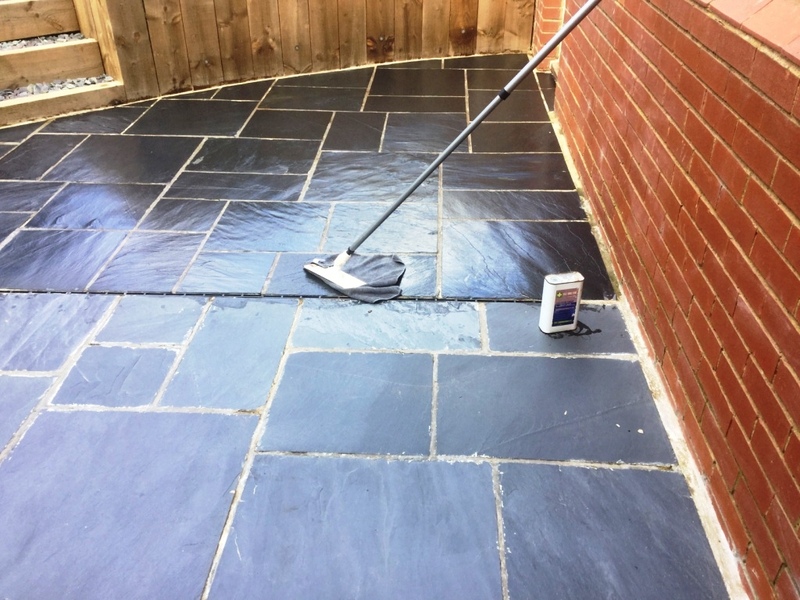 My first task was to re-grout areas where the grout had become loose, this made an instant difference defining the tiles as they should be, also this will prevent the problem with weeds growing between the paving slabs. Finally, I applied Tile Doctor Colour Grow Sealant to enhance the natural colours of the stone. Colour Grow is an impregnating sealer that soaks into the pores of the stone protecting it from within. It is also a breathable sealer which is ideal for external areas where moisture is an issue. As you can see from the pictures this process made a huge impact and the colours appear much brighter, the customer was delighted with the results and she is looking forward to being able to enjoy her garden. The hot weather is thankfully continuing so she will be able to enjoy the space for many weeks to come. 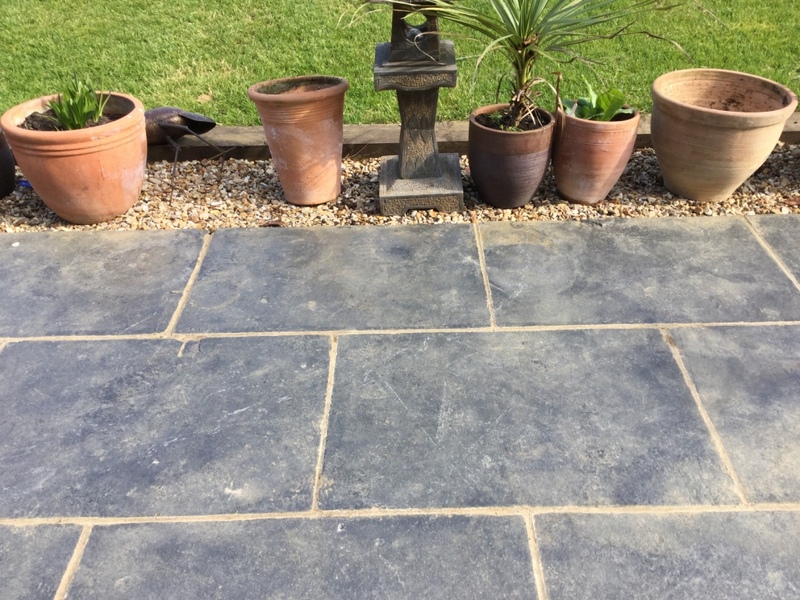 The following photos show a large black limestone patio that had been installed at a house in the village of Walgrave by a local builder who had sealed the stone before cleaning it first. Doing so trapped the dirt and grout smears (ka grout haze) underneath the sealer which resulted in a hazy appearance that could never be cleaned off. 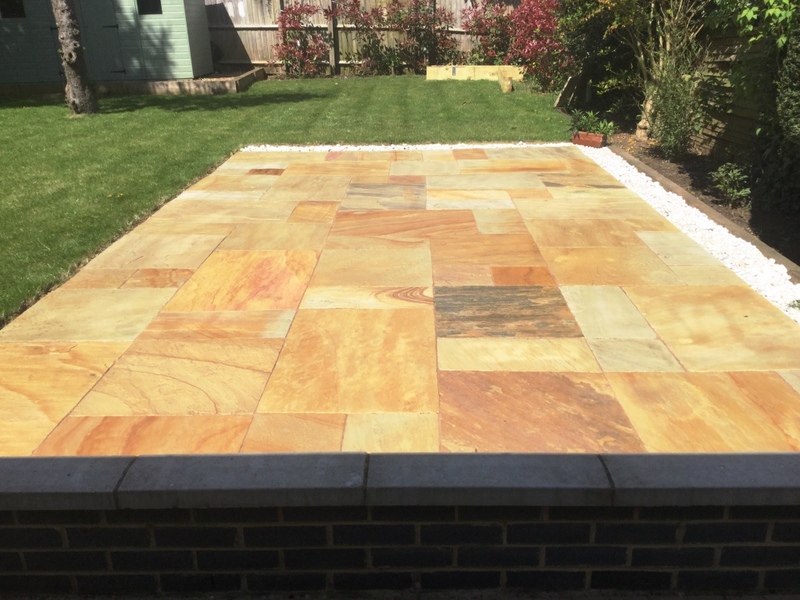 Spring is an ideal time to work on patios which tend to get stained most from leaves and other detritus during the windy autumn and then ravaged by the winter frosts. If you want to seal the stone though its best to wait until a spell of continuous hot weather for the best results. 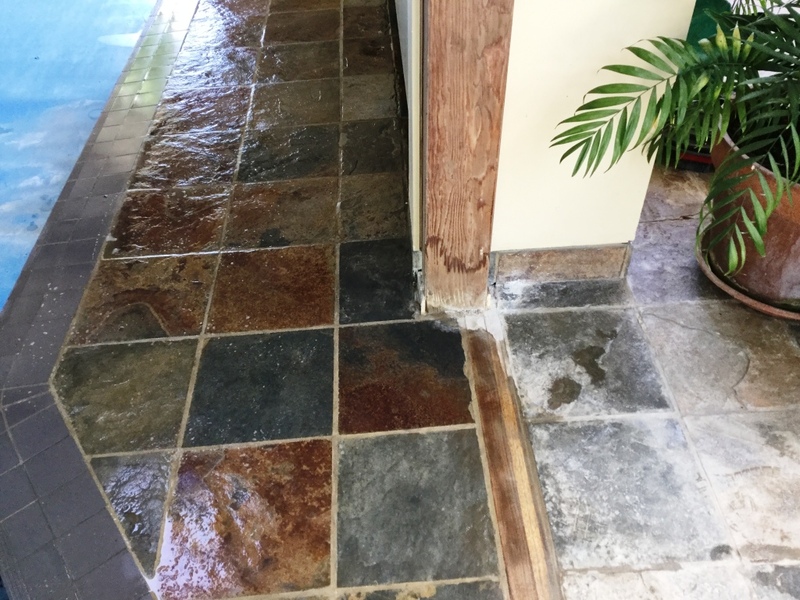 To clean the stone, I would first need to remove the builder’s sealer, so I started by applying Tile Doctor Remove & Go which is a strong product designed to safely remove coatings such as sealers and paint from stone and tile. 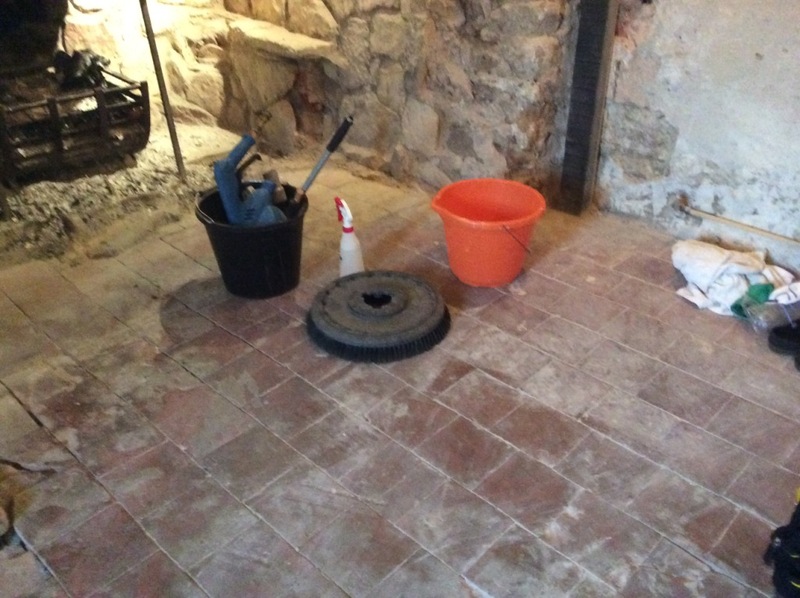 A strong dilution of Remove and Go was applied to the floor and left to soak in for about ten minutes before being worked into the Limestone using a black scrubbing pad fitted to a rotary floor scrubbing machine. The soiled cleaning solution was then rinsed off the patio with water and extracted using a wet vacuum. With the sealer removed along with the dirt then next task was to tackle the smears of grout that had been left on the surface of the stone. 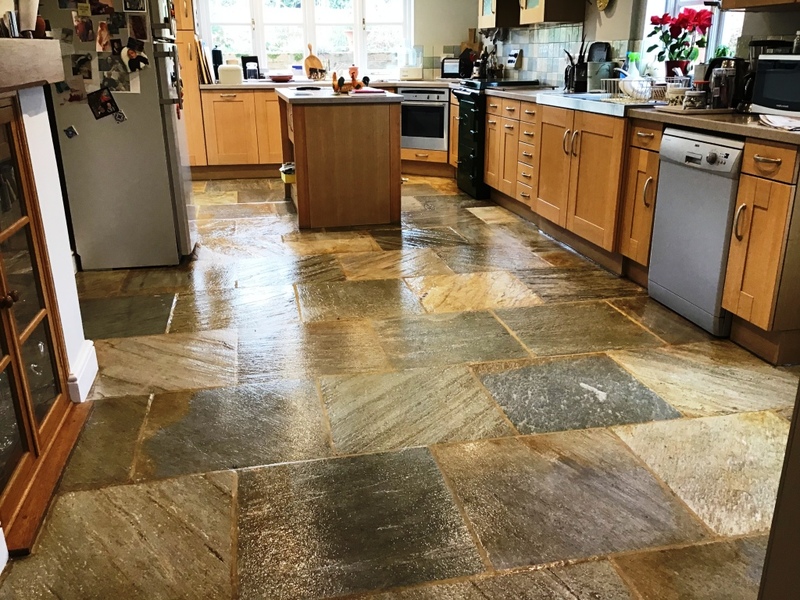 To do this I applied a specially developed product called Tile Doctor Acid Gel which is left to dwell on the surface of the stone just long enough to weaken the unwanted grout which can be then scrubbed off. The solution is then rinsed off the patio and extracted as before. This process was done in sections worked across the length of the patio and then when finished it was given a through rinse. I would need the limestone patio to be dry before sealing so I left it fully dry out over the course of a few days before coming back to finish off, fortunately the weather was good, and it wasn’t long before I returned. My sealer of choice for Black Limestone is Tile Doctor Colour Grow, it’s an impregnating sealer the penetrates the pores of the stone protecting it from within and simultaneously enhancing the natural colours in the stone. This product is also fully breathable which makes it ideal for external use or damp areas where moisture needs to rise through the stone and evaporate. Two coats of Colour Grow were all that was required to fully seal the stone. 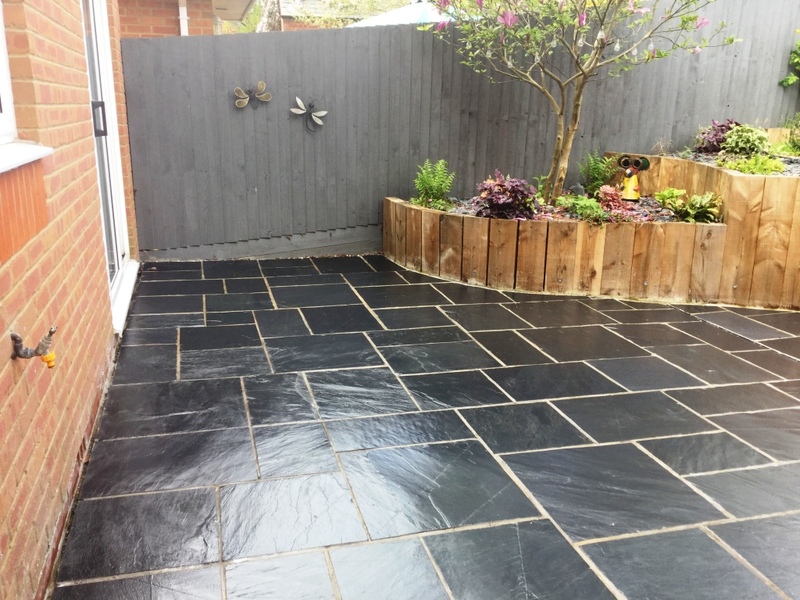 The work was a huge improvement to the look of the patio which is now vibrant, inviting and fully transformed by the process. 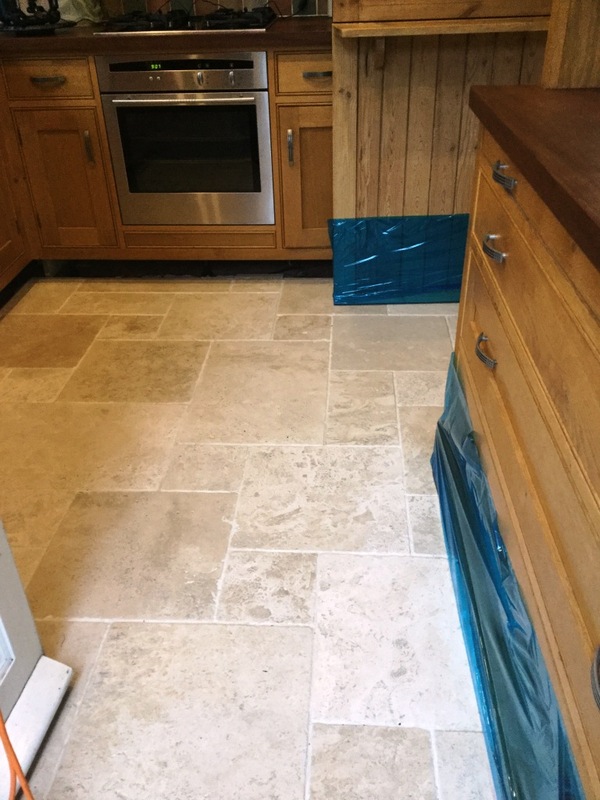 The following pictures show a polished Travertine kitchen and dining room floor at a house in the small village of Abthorpe near Towcester. The stone floor had lost its shine and had become dull and difficult to clean which was mainly due to the holes that had appeared in the surface of the Travertine where dirt had become ground in and trapped. 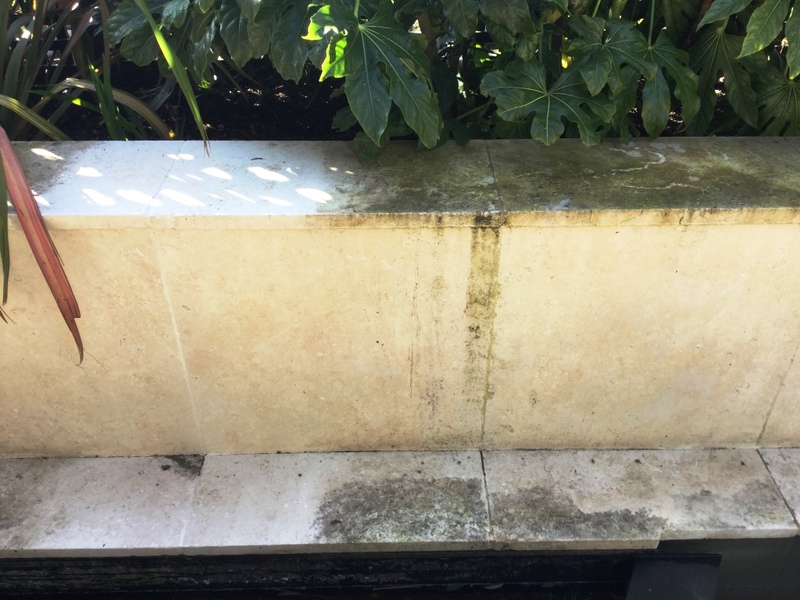 This is a common problem with all Travertine stone, the holes are natural and usually filled at the factory but due to wear and tear over time and the use of acidic cleaning products the filler can become dislodged. The small holes gave the floor an unsightly appearance and become magnets to dirt. We find the best way to restore the shine is to apply a set of diamond encrusted burnishing pads, they take off the layer of dirt and then slowly build a resilient polish on the surface; however, to get the best results we would need to fill the holes in the Travertine. I gave the floor a sweep to remove any loose dirt and grit and started with the application of the first pad which is a coarse 400-grit and designed to remove minor scratches, old sealers and ingrained dirt. 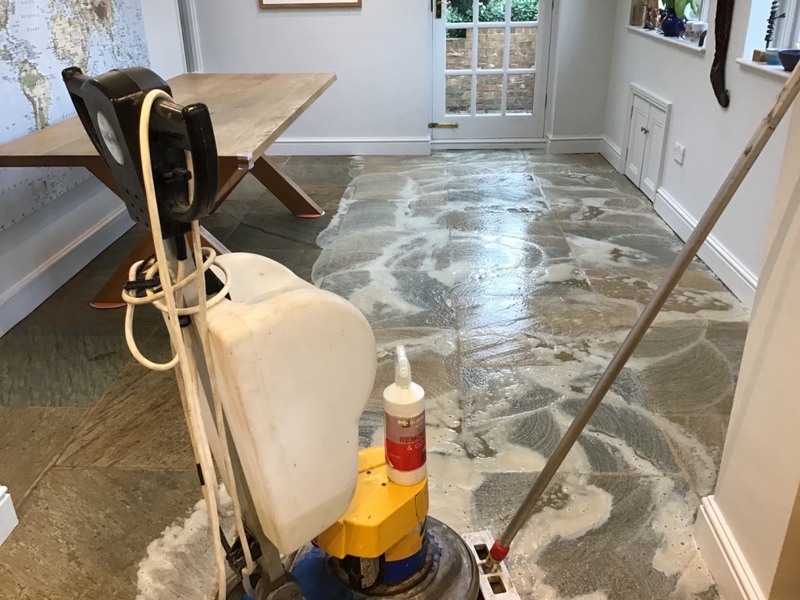 The pads fit a 17” buffer machine and is applied with water to lubricate the process, then once the pad has been applied to each tile the floor is rinsed with water and the resultant slurry is extracted using a wet vacuum. Before moving onto the second pad in the set I gave the grout lines a clean with Tile Doctor Pro-Clean which was scrubbed into the grout using a stiff narrow brush. The pads can struggle to reach into the recessed grout lines, so I usually find this is the best way to get the grout clean. The floor was given another rinse with water and then I continued to work through the medium 800-grit and then fine 1500-grit pads rinsing with water and then extracting the slurry with a wet vacuum after each pad. 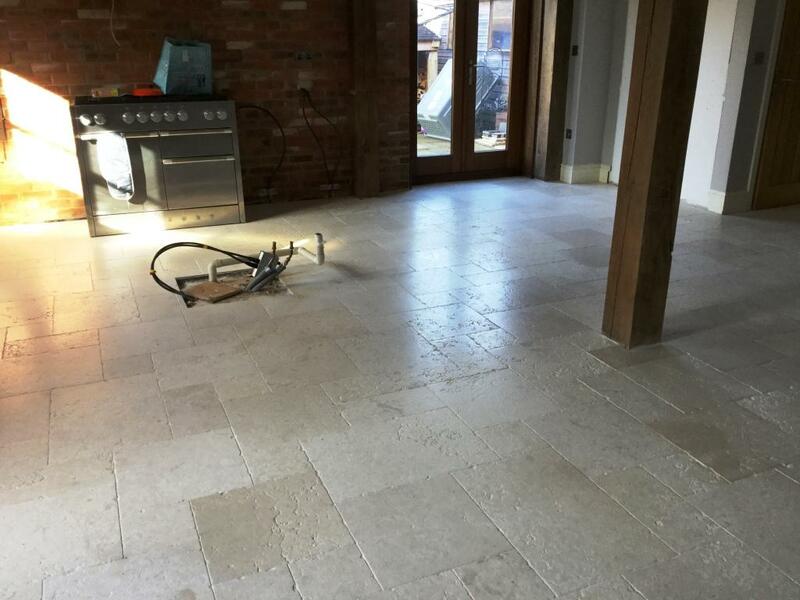 The Travertine was now clean and after drying with fans I commenced the task of filling the holes with stone filler that matched the natural colour of the stone as close as possible, in this case the colour we opted for to achieve the best match was Straw. These activities took up most of the day so once I was done filling I left for the day, so the filler and floor could dry out thoroughly overnight. I returned the following day and started by completing the polishing process by applying the last 3000-grit very fine burnishing pad with the 17” rotary machine, the pad is applied dry with a small amount of water sprayed on the floor as you go along. With the floor now fully dry and the filled holes polished flat the last step was to apply the sealer which will protect the floor going forwards. With Travertine floors I usually recommend Tile Doctor Colour Grow which is a colour enhancing sealer or Ultra-Seal which is a natural look sealer. 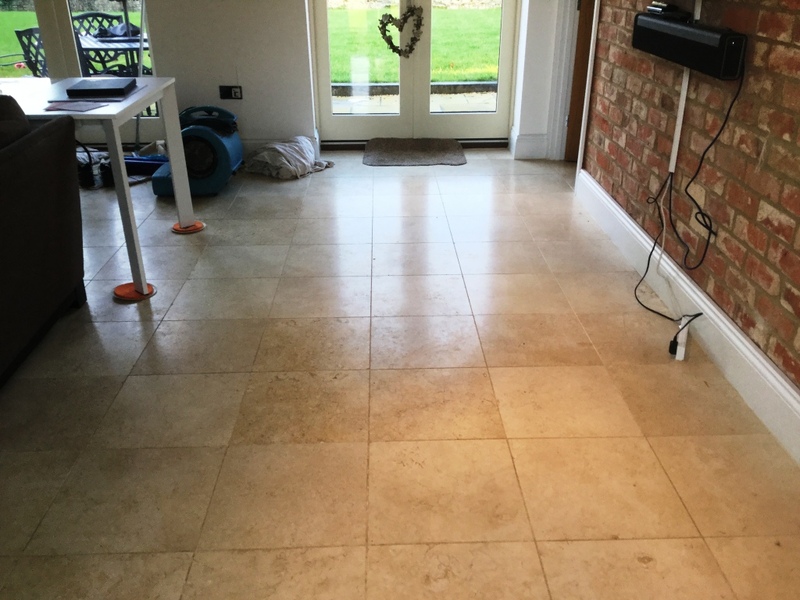 On this occasion the client preferred the natural look, so I applied two coats of Tile Doctor Ultra Seal and along with the previous polishing the floor now look transformed. The following photos show a recent job we undertook at a timber framed house in the village of Upper Boddington, just south of Daventry. 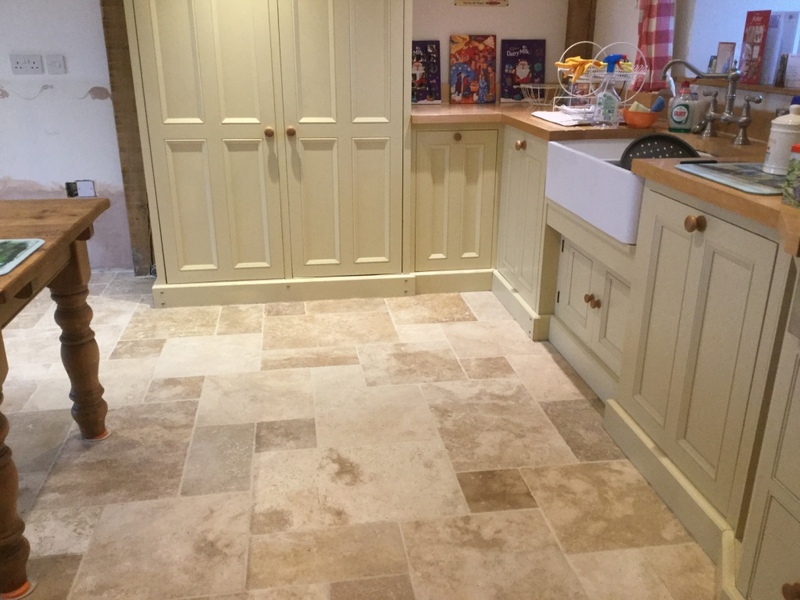 The client was having a new kitchen installed but didn’t want to replace the floor as it was generally in good condition, just dull with some staining and general wear and tear. As the photos show the kitchen units had already been removed and as the tiles were wall to wall this was an ideal time to have this work carried out as the kitchen was being reconfigured and the customer wanted the floor to look uniform throughout, we also included the hallway in the cleaning process. 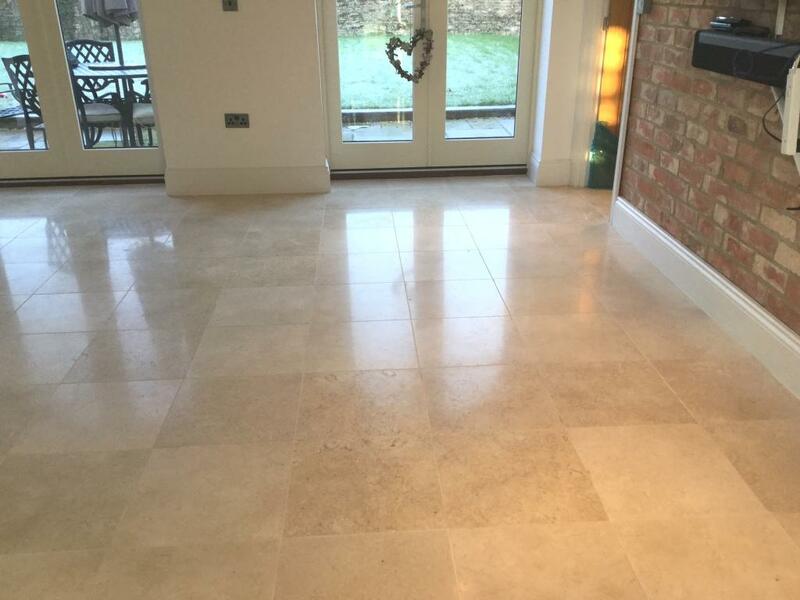 With tiles made of Limestone, Travertine, Marble and other high quality polished stone, we find that the best way to restore appearance is through a process known as burnishing and in the before photo you will see the specialised grinding and polishing equipment we use to achieve brilliant results and a professional finish. 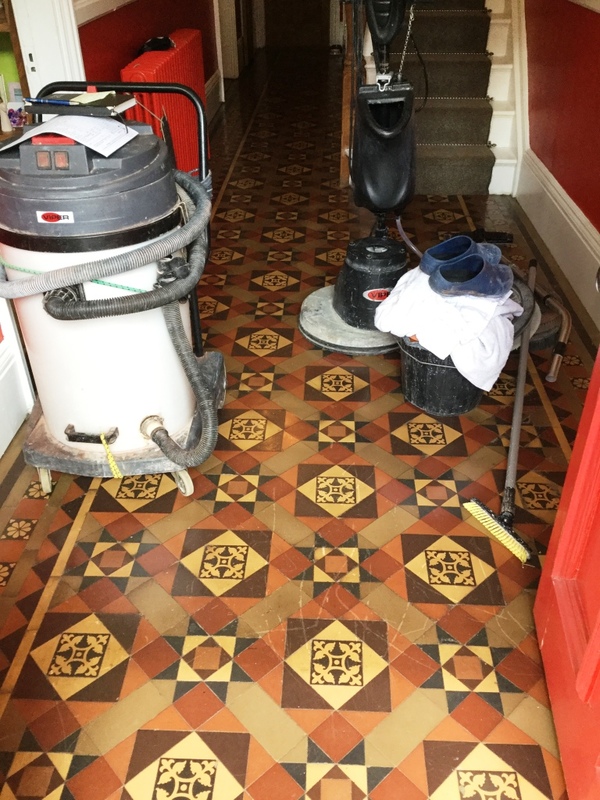 As the tiles were worn and stained in the high traffic areas we applied Tile Doctor Pro-Clean which had been diluted and decanted into a pump-up sprayer. After leaving it to soak in for ten minutes it was scrubbed into the tile and grout using a rotary floor machine and a stiff brush. This was followed by washing and rinsing of floors with water and extracting the soil with a wet vacuum. The next step was to apply a full set of Tile Doctor Stone Burnishing pads from 200 grit, 400 grit, 800 grit and finishing with 1500 grit for a honed look. We worked through the pads in 10 metre sections at a time lubricating with water and rinsing with water between each pad. The kitchen and hallway floors were then allowed to dry out fully overnight. The next day I returned to the property and completed the polishing process by applying the very fine 3000 grit burnishing pad with a little water and leaves a high shine finish. 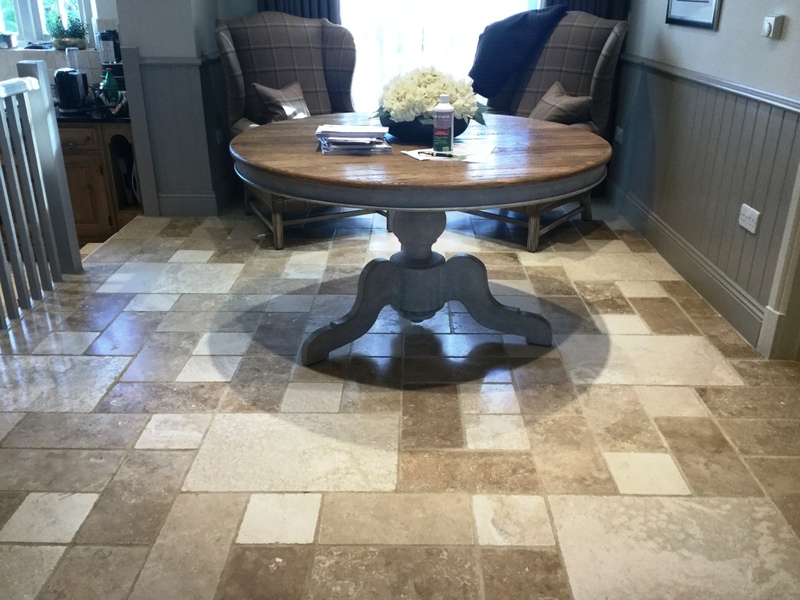 The floor was then sealed with three coats of Tile Doctor Ultra Seal, which is a premium, natural look, impregnating sealer designed to provide maximum stain protection without altering the colour of the stone. The sealer takes an hour to dry and with three coats to apply it took most of the day to finish. The customer was happy with the results and left the following 5-star review on our site. 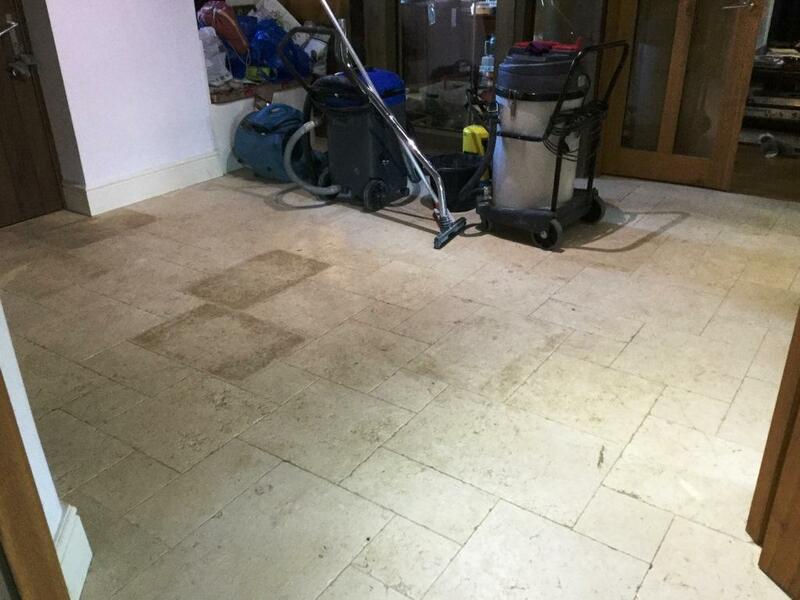 Not only do we carry out the deep cleaning and restoration of all types of natural stone, we can also carry out repairs such as the filling of holes in stone, whether it be limestone, marble or as in this case Travertine. 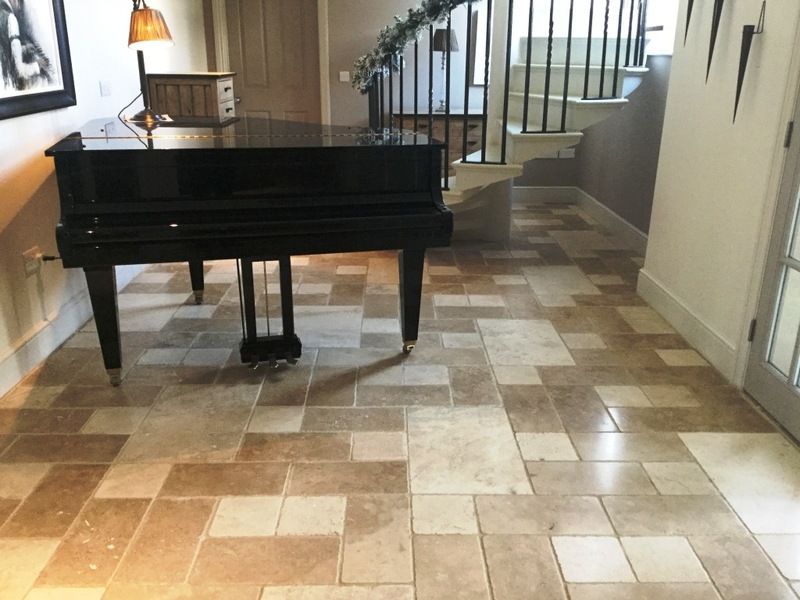 Travertine in particular is prone to a natural process of erosion know as pitting, this results in holes developing that easily fill up with dirt and muck over time and can be a real problem to maintain. 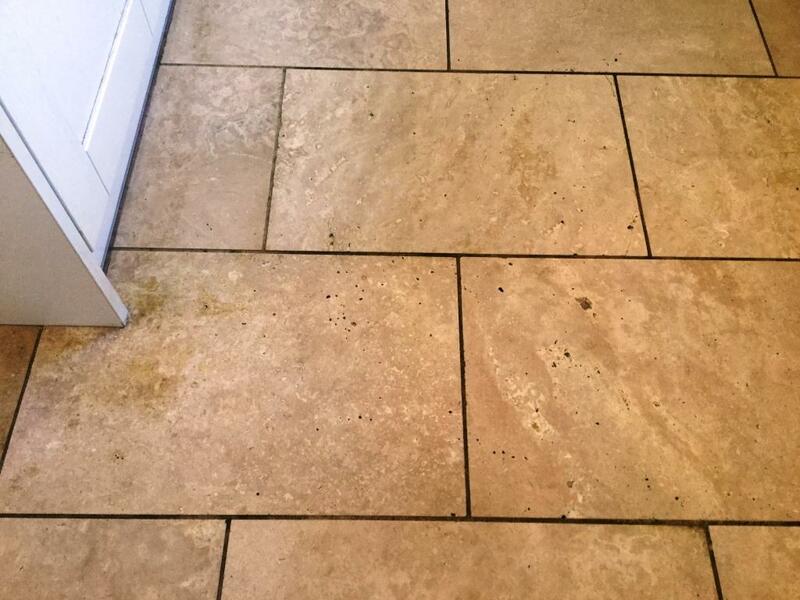 This customer in Rushden called me in, as he felt the floor hadn’t been properly maintained since it had been installed twelve years prior and he was becoming concerned about the number of holes and pits that were appearing in the high traffic areas. 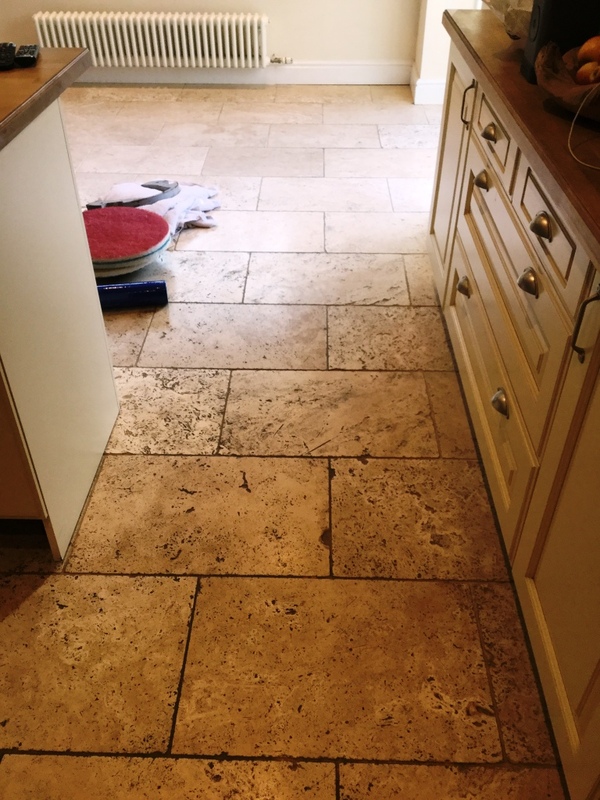 The Travertine tiles had been laid in the hallway, kitchen and upstairs bathroom of the property but the problem was most apparent in the Kitchen. 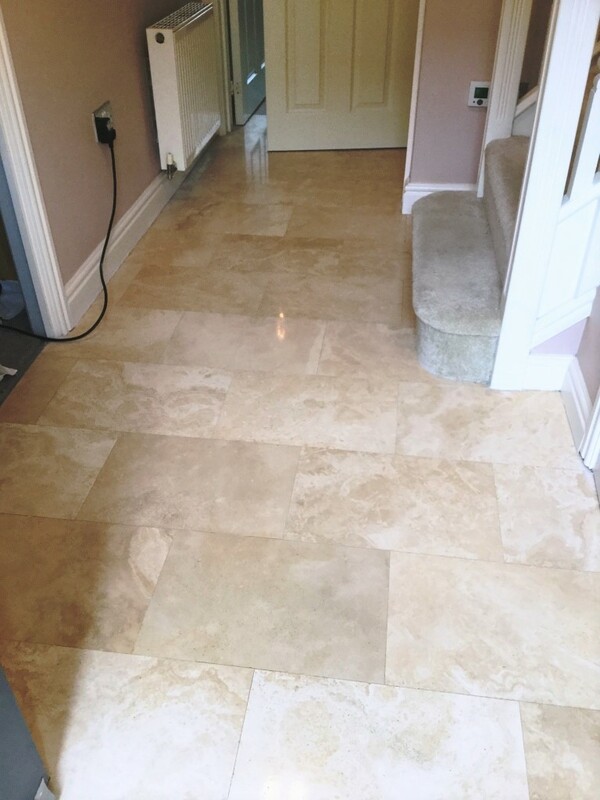 To get the floors clean and restore the polished appearance of the Travertine I decided to apply a set of Tile Doctor diamond encrusted burnishing pads. The process involves the application of four different pads applied in sequence from coarse to very fine, rinsing in-between each pad to remove dirt. As the floor had been installed in the Kitchen and the Hallway it made sense to split the work into two parts and work on each area separately. The first pad is a coarse 400 grit pad that is attached to a rotary machine running at slow speed and with only water for lubrication. The pad is applied to the stone to removes minor scratches, sealers and dirt. It’s run over the entire floor and afterwards the floor is rinsed with water which is then extracted with the soil using a wet-vacuum. I then repeated this same procedure with the second pad, which is a Medium 800 grit pad used to remove dirt from minor scratches and holes in the stone. After rinsing again, I went onto the third burnishing pad in the sequence which is a Fine 1500 grit pad that starts to rebuild the polish on the Travertine. I gave the floor another rinse and used the wet vacuum again to extract the water and soil from the floor. The last 3,000 grit super fine pad was then applied with a small amount of water sprayed onto the floor, this last pad really builds a nice shine on the stone. Once the burnishing process was completed the floor was left to dry off fully overnight and I came back the next day to continue with the work. I took a few moisture readings to confirm the floor was dry and then applied a single coat of Tile Doctor Colour Grow to seal the tiles. Colour Grow is a colour enhancing sealer that impregnates into the pores of the stone protecting it from within and improving the natural colours of the stone in the process. I particularly like to use it on Travertine as it really does bring out the brown shades in the stone. Once the first coat of sealant had dried I started the work to fill the holes throughout the installation using appropriate colours of stone filler resin. I purposely delayed doing this until the first coat of sealer was in place in order to prevent excess resin from being absorbed into the tile and causing unwanted staining. There were quite a few holes to fill so it took a while to complete, the filler also needs several hours to dry and harden even when assisted with a fan. Excess filler is then polished off using a 17” rotary scrubbing machine fitted with a white polishing pad and any dust is carefully vacuumed up before applying a second coat of sealer. The floor was then allowed to dry before a final polish with a new 3000 grit pad to achieve a high sine finish. Once the cleaning process was complete and the first coat of sealant had dried I then commenced the repair work by filling all holes throughout using appropriate colours of stone filler resin, the first coat of sealant is to stop the excess resin from being absorbed into the tile and causing staining, the filler is allowed to dry and harden for several hours assisted with a fan on site. Excess filler is then polished off using a 17” rotary scrubbing machine and a white buffing pad. Any dust is carefully vacuumed up before applying a second coat of sealant. This is then allowed to dry before a final polish with a new 3000 grit burnishing pad to achieve a deep sine finish. I’m not sure the photographs really show off the transformation that I had managed to achieve, however my customer was certainly happy and left me the following glowing review via the Tile Doctor feedback system. My hall and kitchen floor has been down for 12 years and has been a high traffic area. The Tile Doctor has literally made it look like new again. Holes filled, smooth, shiny and new again! My fully tiled bathroom has also been rejuvenated, wall tiles, shower tiles and floor tiles. The water now beads on the tiles like a freshly waxed car, and the walk-in shower has been perfectly resealed. Money very well spent. It’s always nice to get feedback like that, it really does make your efforts feel appreciated. At Tile Doctor, we have a long history of bringing tiles back to life – typically after they have experienced many, many years’ worth of neglect. If fact you can see photos on our many websites, that show the dramatic difference we can make. Keeping a floor looking good once it’s been restored is the job of the sealer which will protect the tile from dirt becoming ingrained in its pores. However, sealers do wear off with use so in most cases we generally recommend you ask us to pop back every six to twelve months to give the floor a quick clean and top-up the sealer. We call this a Tile Doctor Maintenance Plan and it’s designed to ensure your tiles always look their best. 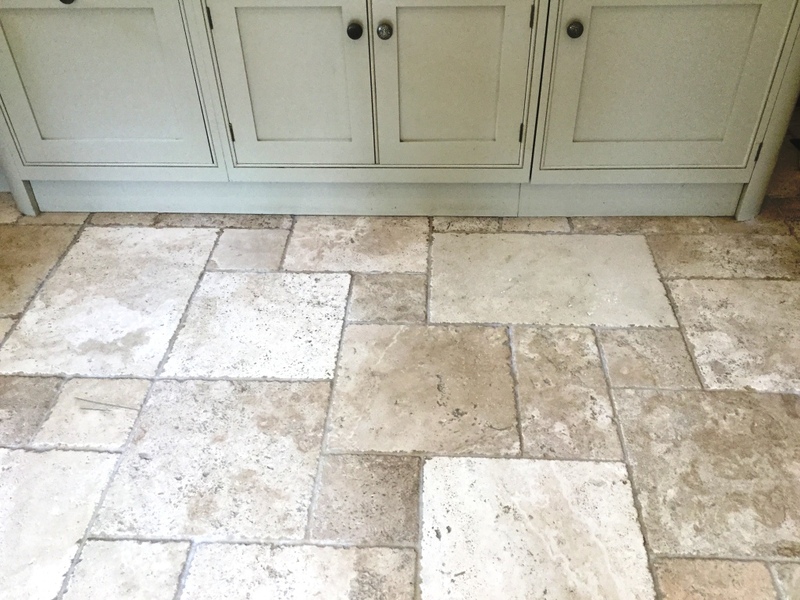 By way of example the photographs on this page are of a beautiful Travertine tiled floor, at a property in the Northamptonshire town of Orlingbury. The floor was originally laid around ten years ago and we were called in three years ago to perform a full restorative clean which took a couple of days to complete. The customer was amazed with the results achieved by the initial work and wanted to ensure it remained that way, so we worked out a maintenance plan for the customer and we pop back every year to do a maintenance clean and top-up the sealer. One of the advantages of the maintenance plan is that it can be paid for over the course of the year with monthly instalments, or as a one-off payment once the work is completed. The customer can choose either option. 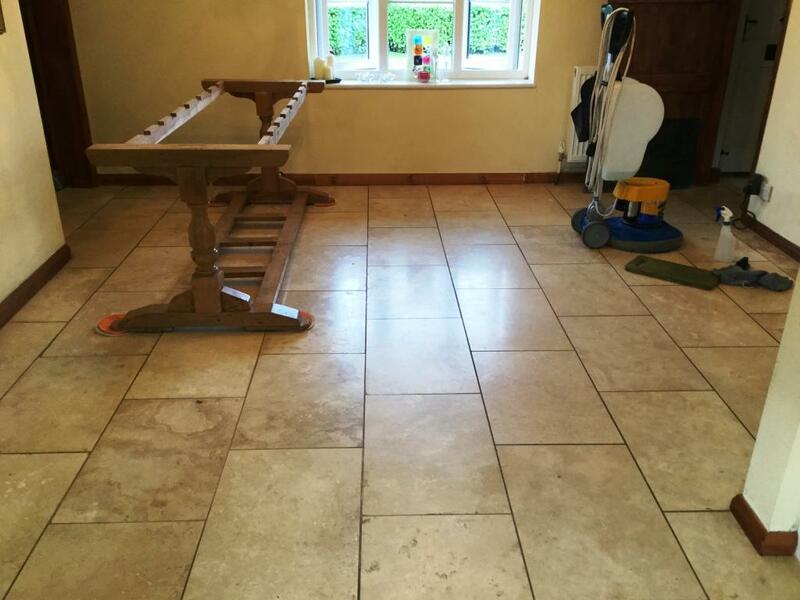 The photos below show the same Travertine tiled floor after we had performed a maintenance clean for the third time. 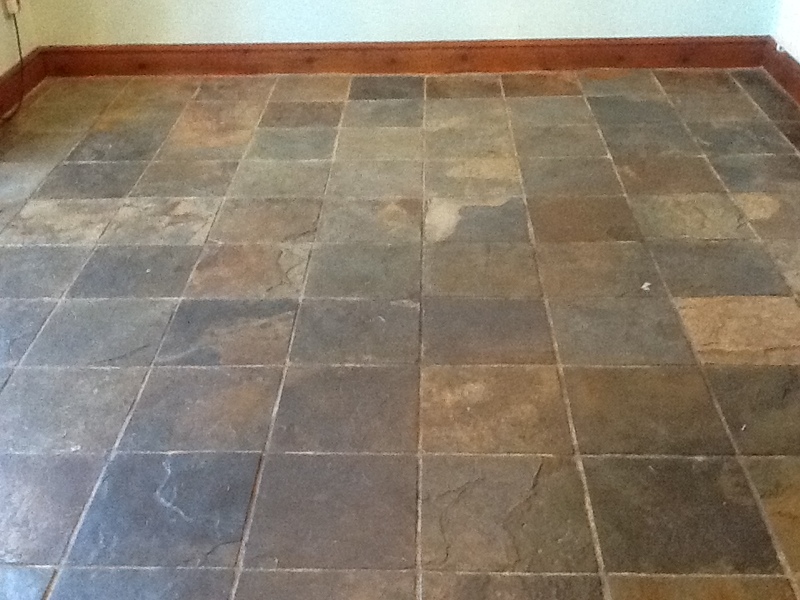 You won’t see a dramatic difference, just a floor that has retained its natural beauty all year round. This annual clean is far less disruptive than the original full restoration service and can normally be carried out over the course of a single day. The products and methods involved in the maintenance clean vary depending on the type of stone. To begin with, we vacuum the floor to remove any debris and then perform a light clean with a Tile Doctor product. This product is usually either Tile Doctor Neutral Tile Cleaner or Stone Soap depending on if the floor is polished stone. Neutral Tile Cleaner is a pH neutral cleaner that is specially formulated for regular cleaning and ensures your sealed surface remains undamaged. Stone Soap is a similar product for light duty cleaning but with an additive that help build patina. 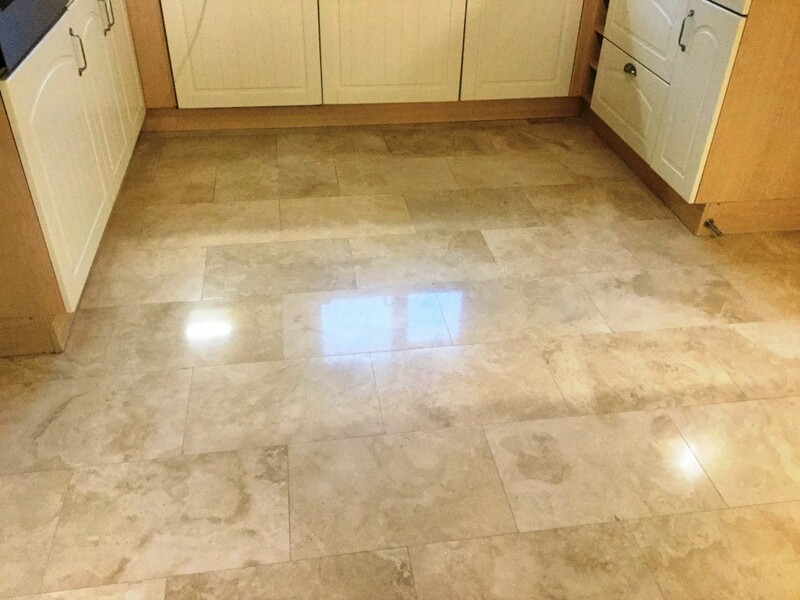 If we are restoring polished stone, such as Travertine, Marble or Limestone, we proceed to perform a light polish of the tiles using a very fine 3,000 grit Tile Doctor diamond encrusted burnishing pad fitted to a floor polishing machine. 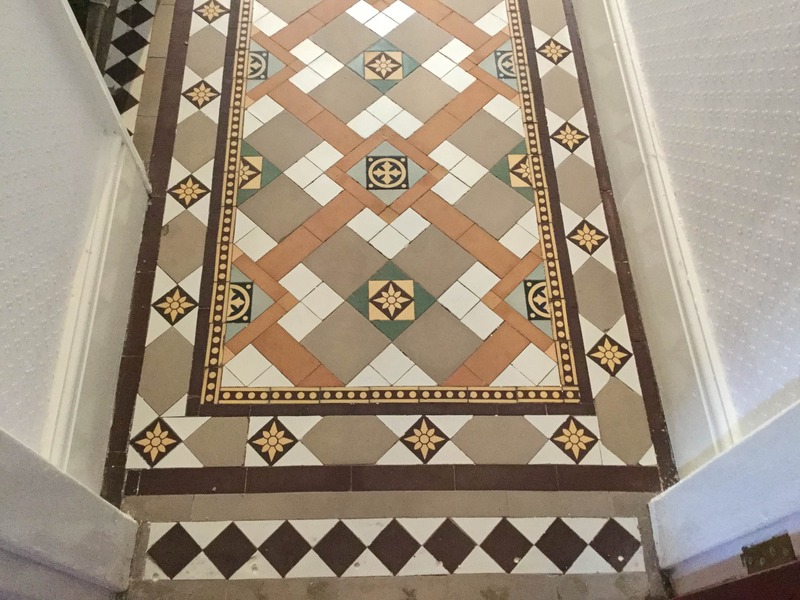 To finish, the floor is dried quickly using a series of fans and one coat of a Tile Doctor sealant is applied to top up the sealant that was originally applied during the restoration clean. In this situation, we applied Tile Doctor Colour Grow, which is an impregnating, colour-intensifying sealant that dries with a matte finish. Again, you won’t see a dramatic difference in the pictures above, the idea is to maintain the original finish which given time will degrade as the sealer wears off. It’s always nice when one of our former customers refers their family and friends to Tile Doctor as it’s a testament to the great work we do. 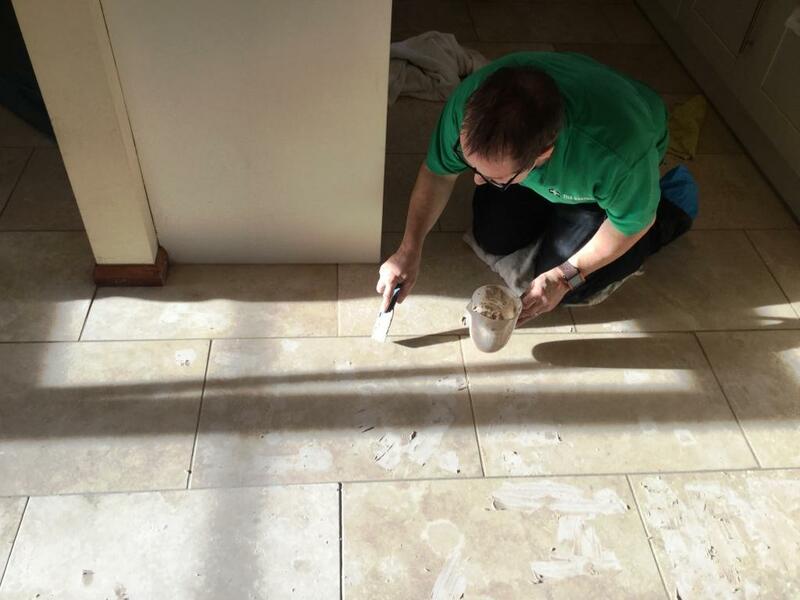 As the Tile Doctor for Northamptonshire, I often carry out tile cleaning and restoration jobs in the Oundle area. Recently, a customer from the nearby village of Ashton was referred to me by a friend. 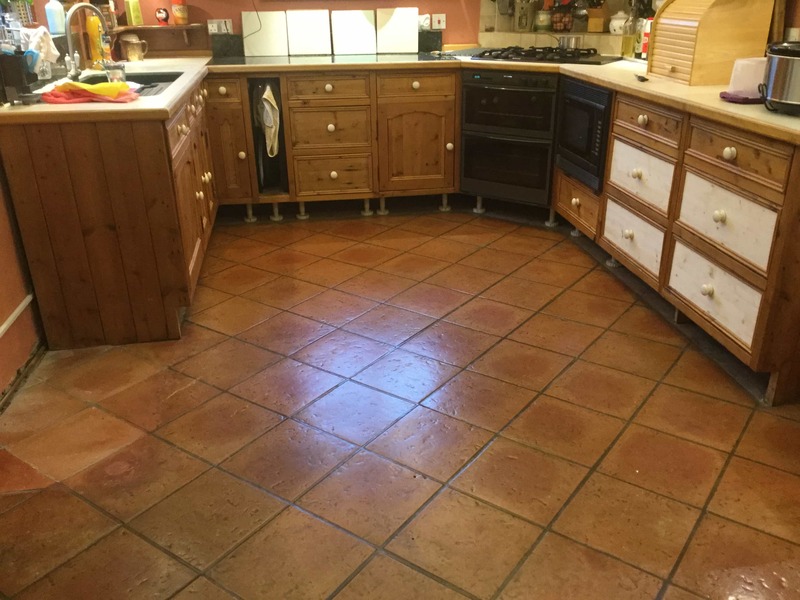 Her friend has the same type of floor in the same type of barn conversion in the area, and had chosen to use our services both last year and this year for their annual maintenance clean. 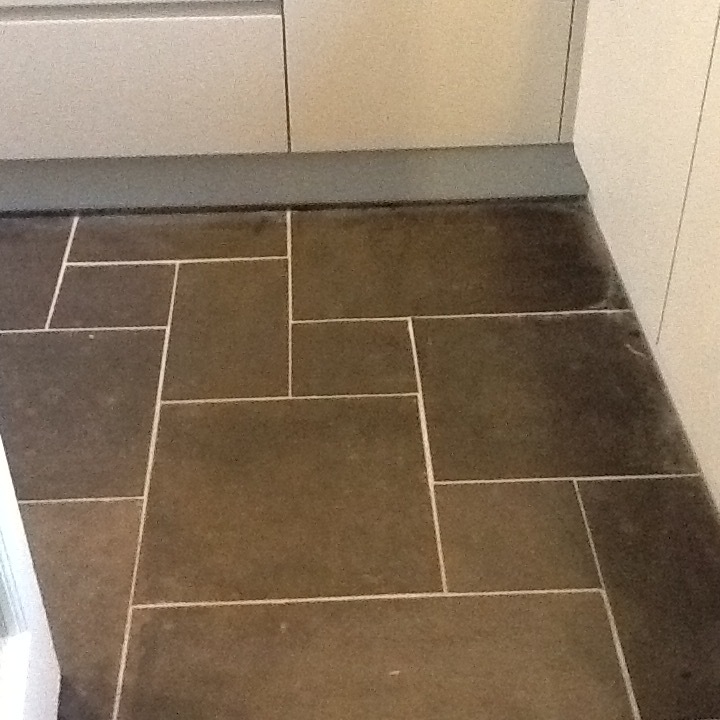 This new customer had a polished Limestone kitchen floor that was proving difficult to keep clean. 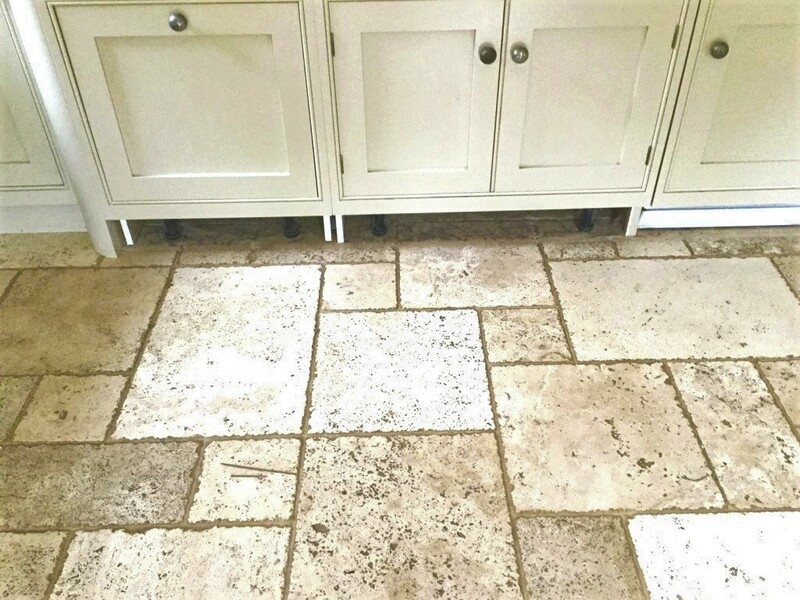 The grout had become extremely dirty and – in the absence of an effective sealer – dirt and general muck had easily penetrated the pores of the Limestone itself. The result was a very dull appearance – not one that any property owner wants to suffer! On our initial inspection visit, we always carry out a test clean within a small area of the floor to give the customer an idea of the final results they can expect. 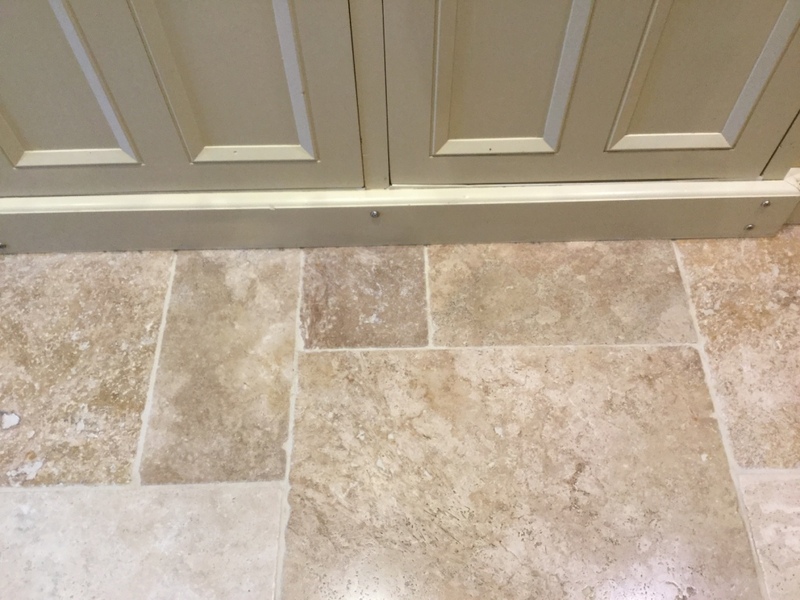 Upon my first visit to this property, I carried out the test clean and the customer couldn’t believe the difference made to the appearance of the grout lines. In fact, she had even forgotten their original colour! When I next visited the property, it was time to carry out the full restoration. 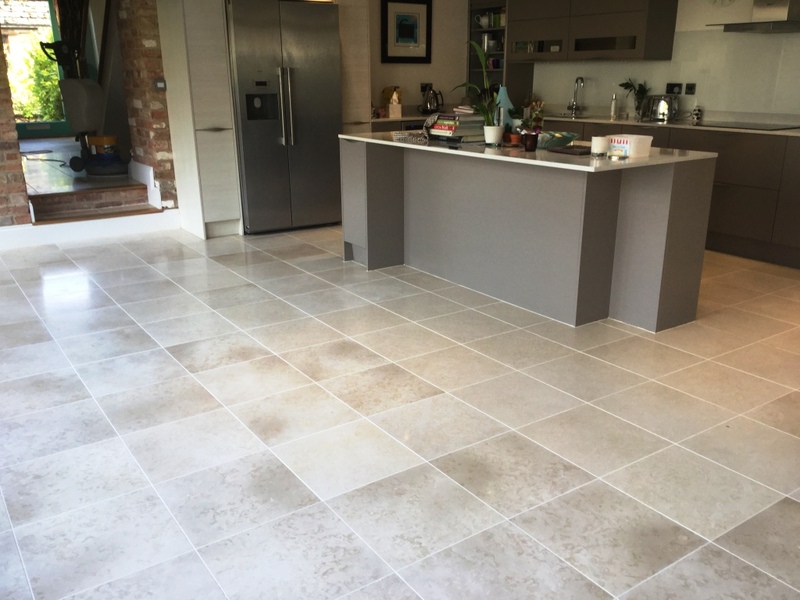 The work was carried out in sections of around 10m2 each, with two Tile Doctor technicians on site using the latest Tile Doctor products and machinery. The issue of the extremely dirty grout lines was tackled first. We cleaned them with Tile Doctor Pro-Clean, which is a high alkaline tile and grout cleaner. We will use Tile Doctor Pro-Clean on all types of natural stone – it’s just that reliable for cutting through the grime. The product was applied using specialised grout brushes and the resulting chemical slurry was rinsed away using fresh water and extracted with a wet vacuum. Satisfied with the cleanliness of the grout lines, we moved onto improving the appearance of the polished Limestone tiles. When it comes to restoring polished stone, including Limestone, Travertine and Marble, we typically use a process we have developed known as ‘burnishing’. Burnishing involves both cleaning the tile and gradually polishing it to achieve a high-quality, long-lasting sheen finish. We use a set of four diamond-encrusted burnishing pads fitted to a rotary machine to do this. The first to be applied is a pad with a Coarse grit, which breaks down any old sealer and shaves off the very top layer of the dirty stone, leaving a fresh surface beneath. Next, burnishing pads with Medium, Fine and Very Fine grits are applied to slowly but surely polish the stone, achieving a very pleasant and shiny appearance. In most cases, the tiles come out looking better than they did when they were originally installed! Once burnished, the floor was left overnight. The following day, we returned to seal the tiles. We did this using two coats of Tile Doctor Ultra-Seal, a sealant which is formulated to protect the floor and grout lines against dirt build-up and staining. 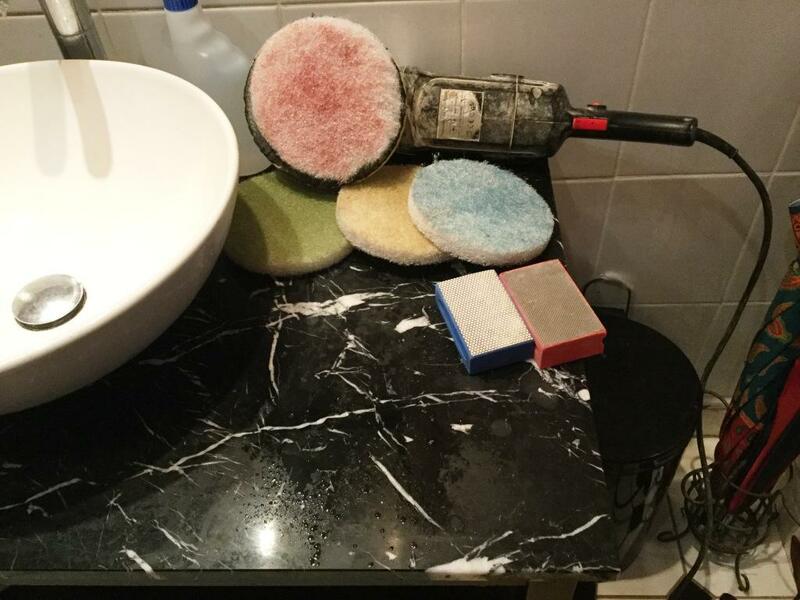 The very happy customer was given a complimentary bottle of Tile Doctor Stone Soap, which is a highly concentrated neutral stone cleaner that helps to maintain the patina on polished stone. This will help her keep the appearance of the floor maintained until her next maintenance clean with Tile Doctor. Some of the world’s best-known Travertine quarries are found in Italy. In fact, the curved columns of the Vatican City are made from Travertine. But the stone is popularly used for flooring in many other countries, including the UK. It’s a form of Limestone which is quite soft and porous, but has unique aesthetic characteristics, including natural pits and voids. 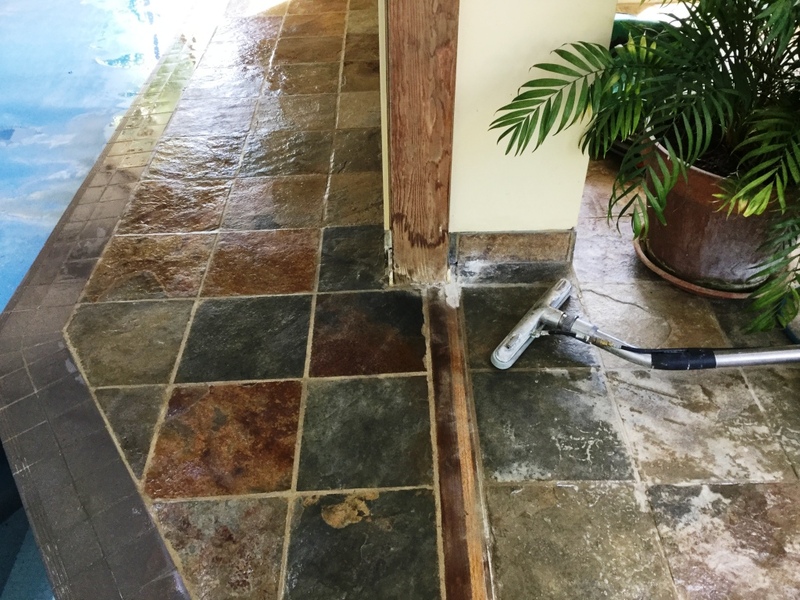 The natural process of corrosion, known as pitting, makes it so that without the right maintenance and adequate sealer, Travertine is very difficult to clean. The small holes that form in the stone can quickly become ingrained with dirt and other muck. 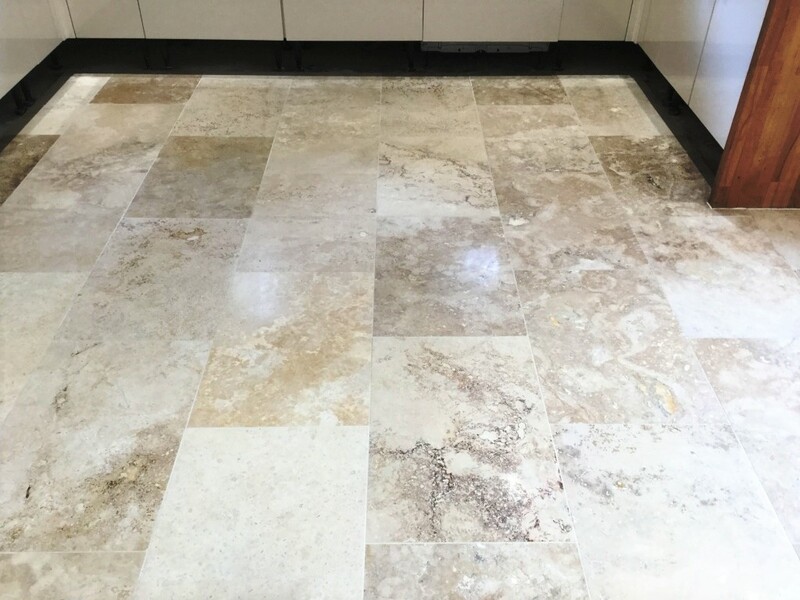 Making things worse, many modern cleaning products are not suitable for use on Travertine: they are acidic and over time will cause further corrosion to occur. 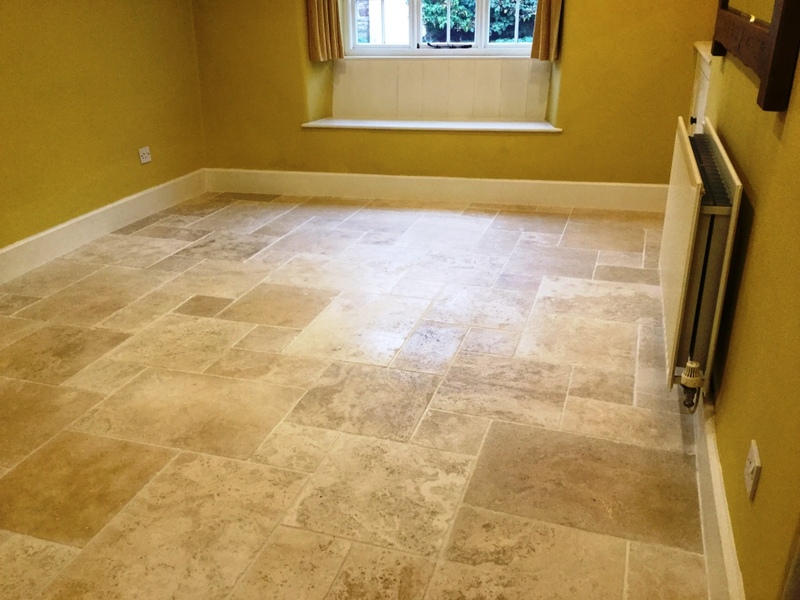 Recently, I was called to a property in the quaint Northamptonshire village of Lower Boddington to rejuvenate a tumbled Travertine tiled kitchen floor. The house was a very busy one, with children and dogs running around. 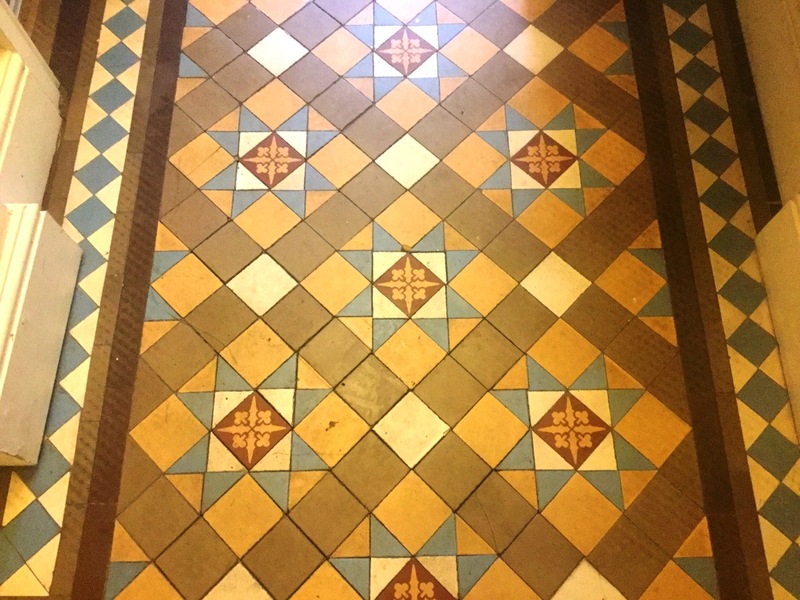 Needless to the say the tiles were looking worse for well and were in desperate of restoration, including cleaning, polishing and sealing to brighten the appearance of the floor and protect it from everyday stains and foot traffic. The first thing I needed to do was to remove the plinths from the kitchen units and cover the base units and appliances with a protective film to prevent them from encountering the cleaning products. Next, I began the process we know as burnishing, which involves the application of diamond encrusted burnishing pads to the tiles to resurface and polish them. In the Tile Doctor system, there are four such pads, each possessing a different level of grit. These pads are fitted to a rotary scrubbing machine and then applied sequentially, starting with the Coarse pad, before moving through to the Medium, Fine, and Very Fine. A small amount of water is used as lubrication with each pad and I stopped in this case between the application of each pad to soak up any excess moisture using a wet vacuum. The result after completing the burnishing process is a very refined and high-quality polished finish. After burnishing the tiles, I followed by cleaning the grout lines carefully using a combination of handheld brushes and Tile Doctor Pro Clean, which is an alkaline-based tile and grout cleaner. I left to the floor to dry out completely overnight and would return the following day to carry out a final polish of the tiles and to seal the stone. I did this using two coats of Tile Doctor Ultra-Seal, which is a natural-look, impregnating sealer designed to provide maximum protection. You can see the fantastic results in the photos below. 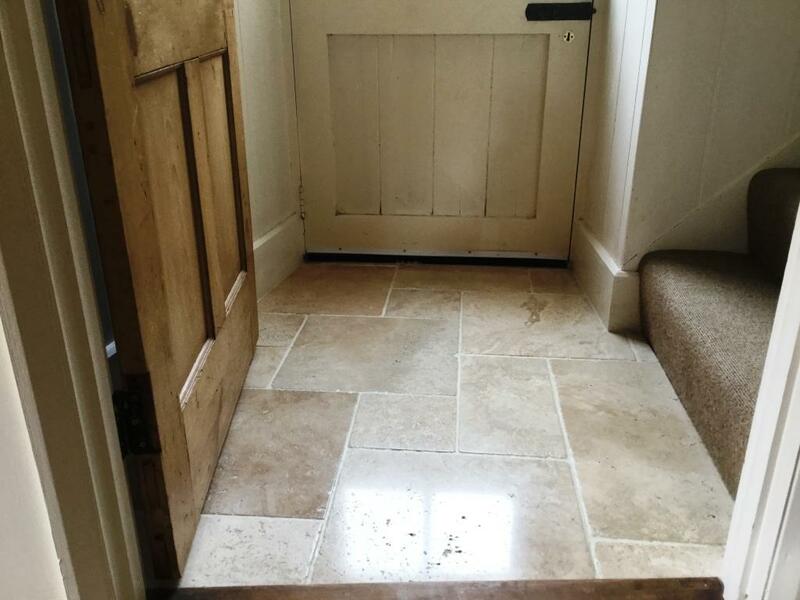 Before leaving my very happy customer to the enjoy, I left her with customer with a complimentary bottle of Tile Doctor Stone Soap, a neutral and highly reliable cleaner for natural stone floors such as Travertine. This will assist her in maintaining the appearance and condition of the tiles going forward. Another satisfied customer! 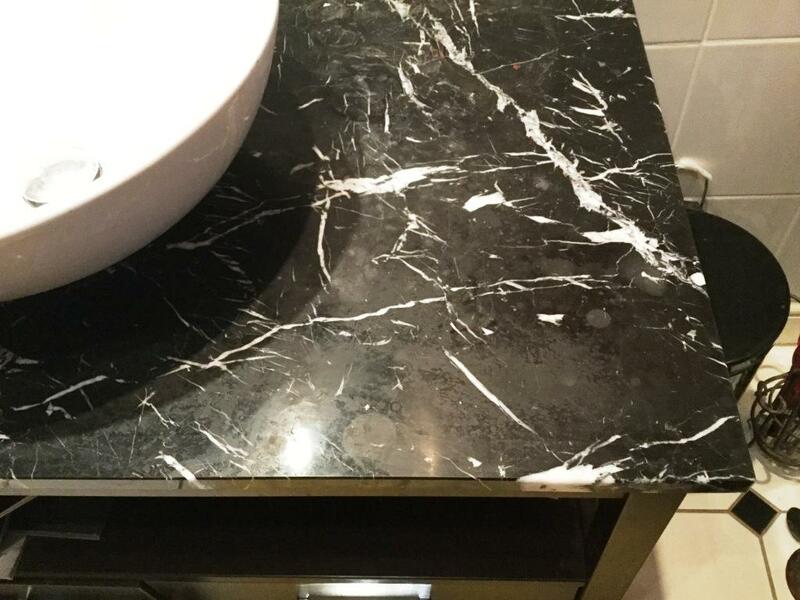 Marble is known for its premium quality, toughness and aesthetic, making it a very popular choice for bathroom countertops, such as this one at a house in Northampton. However just because it’s tough doesn’t mean that Marble can be cleaned with the usual household cleaners. 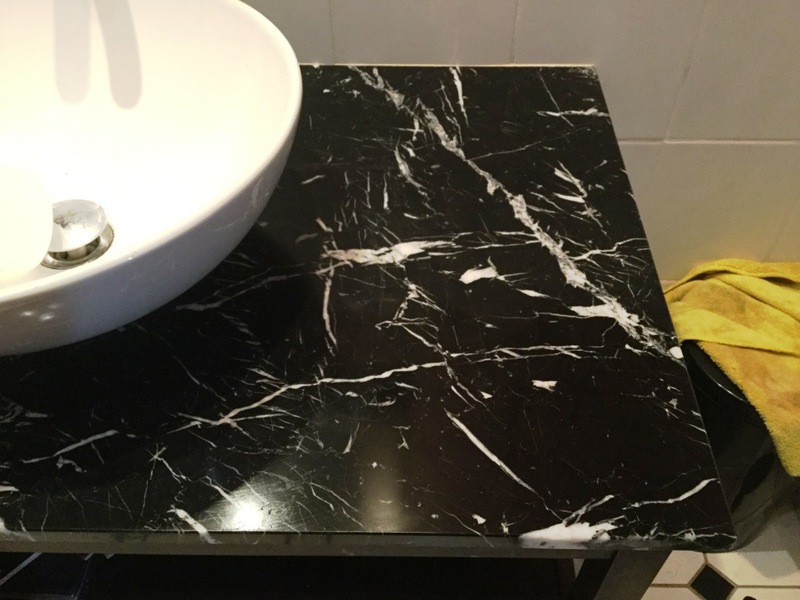 Like all natural stone, Marble is acid sensitive and unsuitable products can have a very damaging effect on its appearance. In this situation, the property owner had used a limescale remover to remove some unsightly marks from the countertop. Unfortunately, the product was acid-based and instead of making an improvement it just made it worse and caused severe etching. 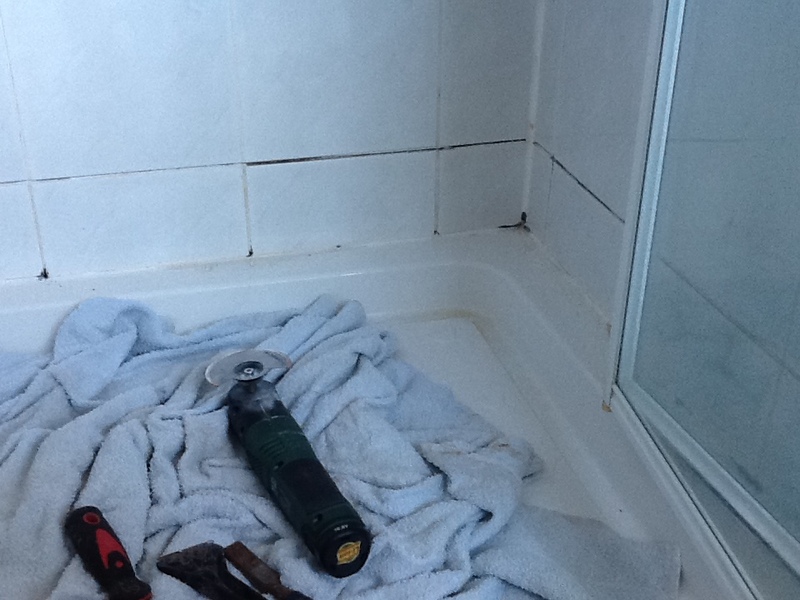 The first photo above shows the limescale marks from where toiletries have been placed on the side whilst wet. Since Northampton is a hard water area, the limescale deposits over time caused these marks to appear. The only way to effectively remove the Limestone deposits – while at the same time rectifying the damaged caused by the botched cleaning attempt – was to use a system of hand-held diamond encrusted pads and hand help blocks of various grits to cut back the stone and re-polish it, a process we call burnishing. Before officially beginning the burnishing process, I ran a few tests to determine the type of pad I would need to use to achieve the best results. I found that, in most areas, I would need to use the Tile Doctor 400 Grit (Coarse) pad to resurface the tile and remove the damaged layer of stone, but in some areas where the etching was worse, I would need to use the 200 Grit (Very Coarse) pad. After burnishing the affected areas with the Coarse and Very Coarse grit pads, I started to incrementally polish the stone to achieve a high-quality shine, working my up through the Medium, Fine and Very grit pads. No chemicals were used during this process – only water for lubrication, combined with the six-inch diamond encrusted burnishing pads fitted to a hand-held buffing machine. The final part of the restoration was to seal the stone to maintain a long-lasting, deep polished appearance. To do this, I used Tile Doctor Shine Powder, which is a crystallising sealer in powder form. The powder is applied directly and combined with water, before being worked into the stone to seal it. The customer was very happy with the results and the level of shine achieved. I gave the customer a complimentary bottle of Tile Doctor Stone Soap, which is our aftercare cleaner for polished natural stone, along with instructions on periodic maintenance to help maintain the finish we had achieved for as long as possible. This very nice house in a village near Oundle in Northamptonshire features something we don’t see too often in residential property – an indoor swimming pool. The pool is surrounded by some very complementary and rustic looking Slate tiles which act as the flooring in the poolhouse. However, over the years, the Slate tiles had been badly damaged by the chlorine bleach which is used to sterilise the pool water. 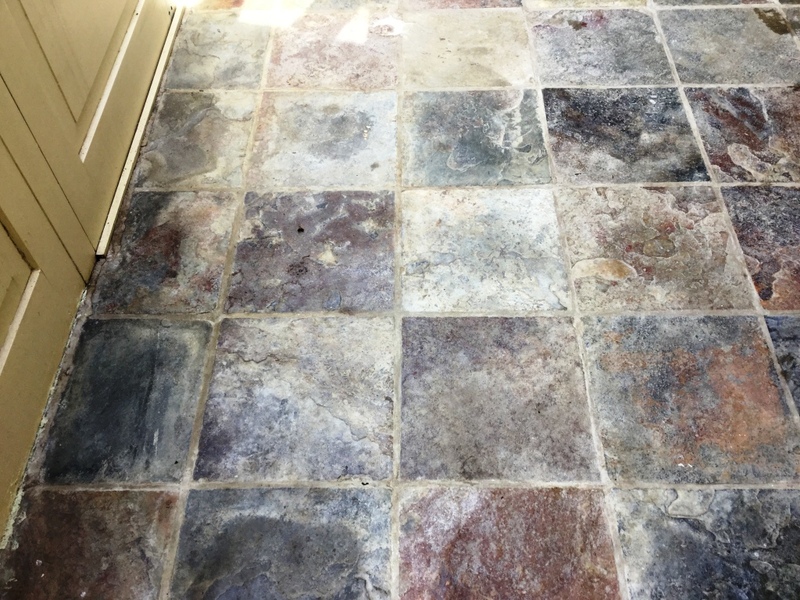 The cumulative effect of people splashing water onto the tiles or walking around wet on the floor had caused the sealant to break down and the bleach had left a white blotchiness on the stone. I was asked to rectify the situation by deep cleaning the tiles, resurfacing some of the damaged stone, and applying a fresh sealant. 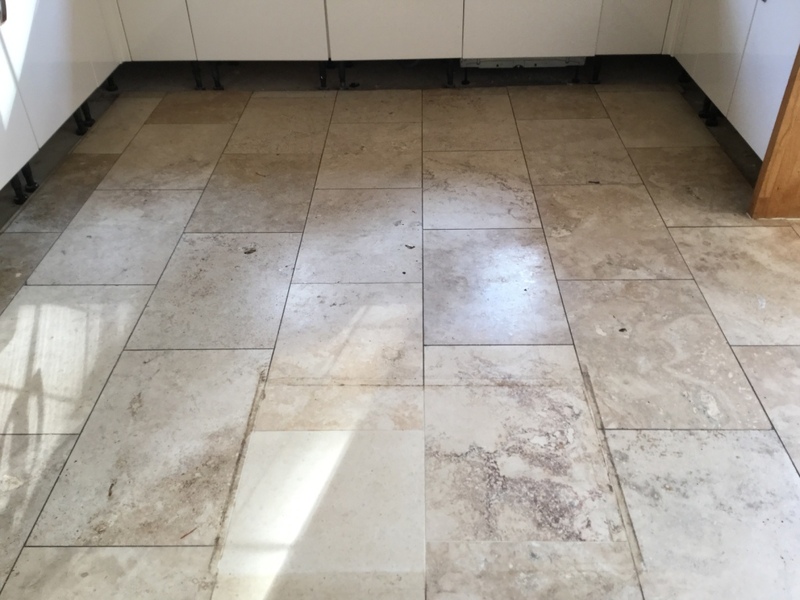 My first course of action in restoring these tiles was to clean the entire floor using Tile Doctor Pro-Clean, which is a strong alkaline-based cleaner for most types of natural stone. 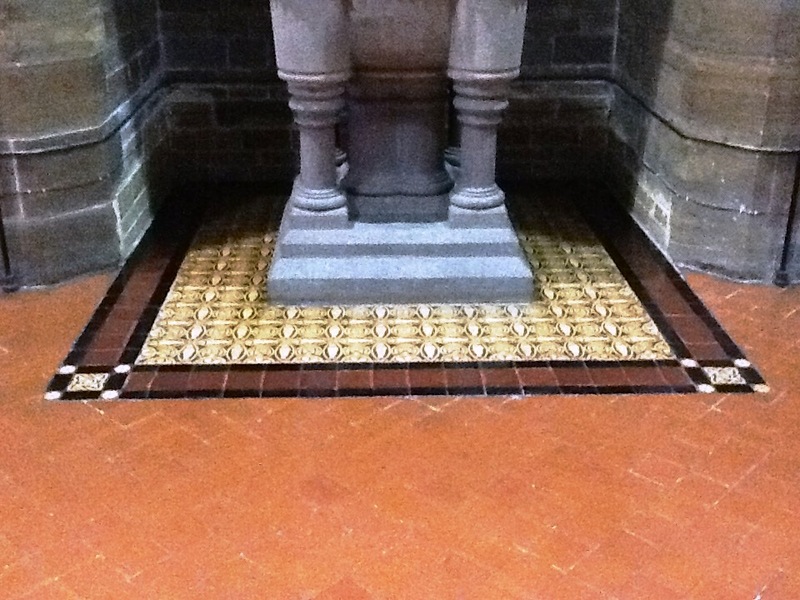 This product was scrubbed into the tiles using a stiff brush fitted to a rotary machine. After cleaning, I rinsed the floor with fresh water and used a wet vacuum to soak up the resulting slurry. Although the pool was protected with a cover I had to take care not to allow any of my cleaning water to contaminate the pool. The process was effective in removing most of the white calcium deposits caused by the bleach, but not all of them. I tackled the more embedded stains with Tile Doctor Acid Gel, which is a blend of phosphoric and hydrochloric acids which treats stubborn smears such as these. The gel was brushed onto the tiles and left to dwell for 15 minutes, and then agitated using a black stripping pad fitted to a rotary machine. After rinsing the floor again, I found that there were yet still stubborn stains remaining that didn’t respond to chemical cleaning. I decided that removing these would necessitate a more aggressive approach, and so used a set of diamond-encrusted burnishing pads to literally remove the damaged layer of stone and resurface the face of some of the badly damaged tiles. 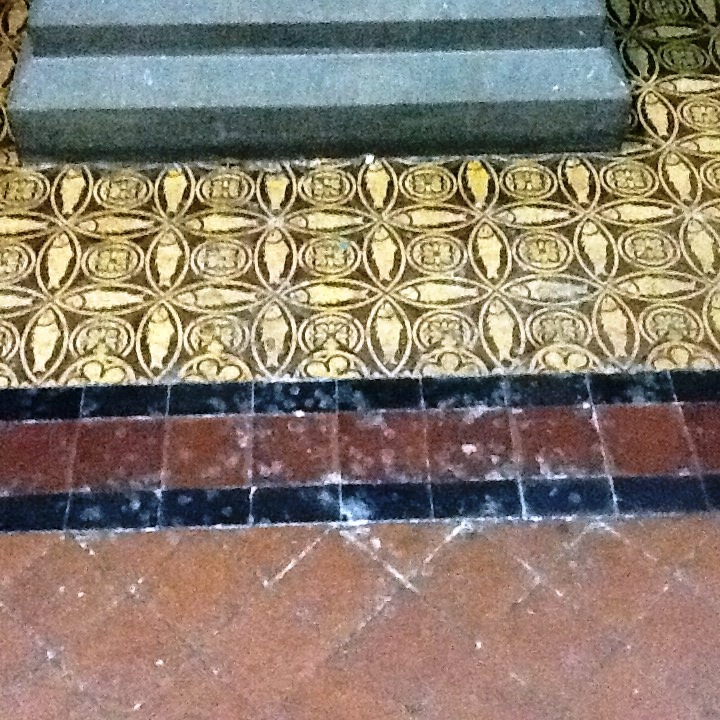 The tiles were left to dry overnight after being cleaned and repaired. The next day, I returned to the property to applying the fresh sealant. For this I used Tile Doctor Colour Grow, a sealant which impregnates the stone to provide maximum protection and enhances its natural colours. 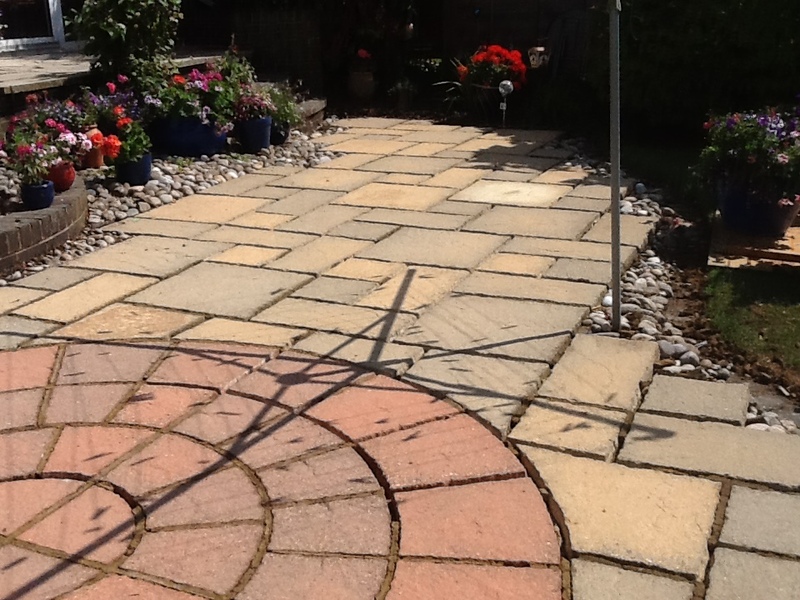 The customer was very impressed with the result and was very much keen to make sure the tiles remained in such good condition, so I made sure to provide the groundsman with instructions on routine maintenance. I informed him that each time the pool is used the entire area needs to be hosed and brushed down as no sealer can withstand continuous exposure to chlorine bleach. I also left a complementary tin of Colour Grow sealant with him for periodic top-ups, as well as information on the yearly maintenance plan we offer at Tile Doctor. 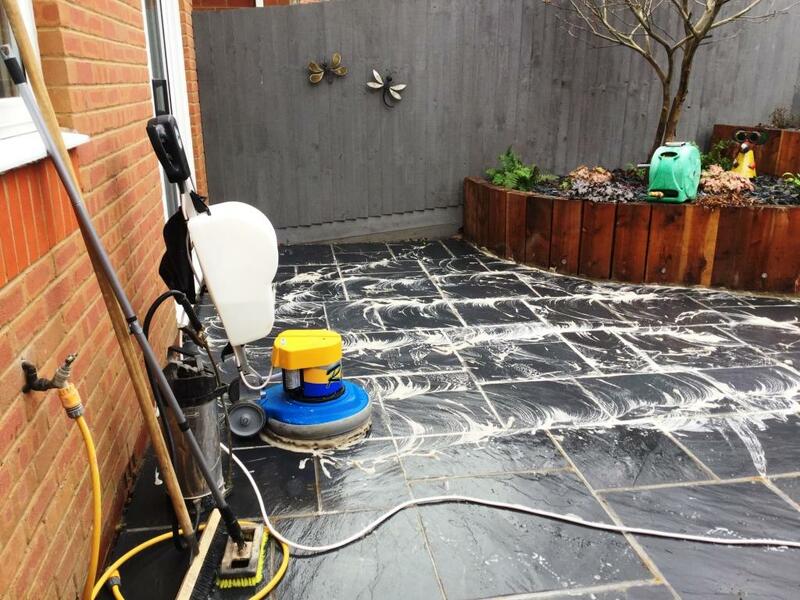 Patios are particularly difficult to keep clean as they are continuously exposed to the elements fortunately Tile Doctor specialises in cleaning and restoring all different types of natural stone internal and external. I was recently asked to restore a patio at a house in Bozeat, a village in Northamptonshire. The patio was consisted of both floor tiles and walls, and was made of a rather uncommon stone: Egyptian-style Marble. 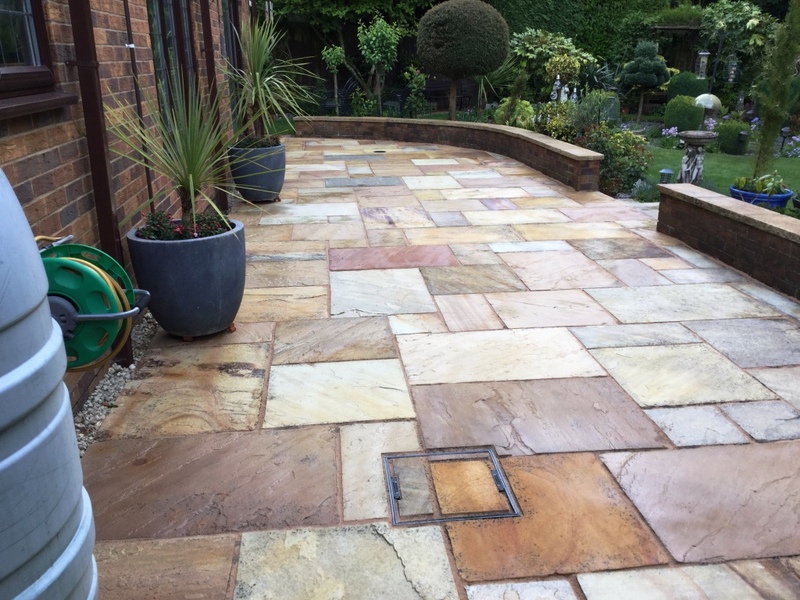 The customer had clearly taken pride in the presentation and aesthetic of his garden but, having a concentrated on other projects for the past couple of years, he had neglected to preserve the condition of patio. Making matters worse, the patio had never been sealed, and this had allowed dirt and moss to become ingrained in the stone. The customer was also concerned by a large rust mark left on the stone where old garden furniture had been sitting. 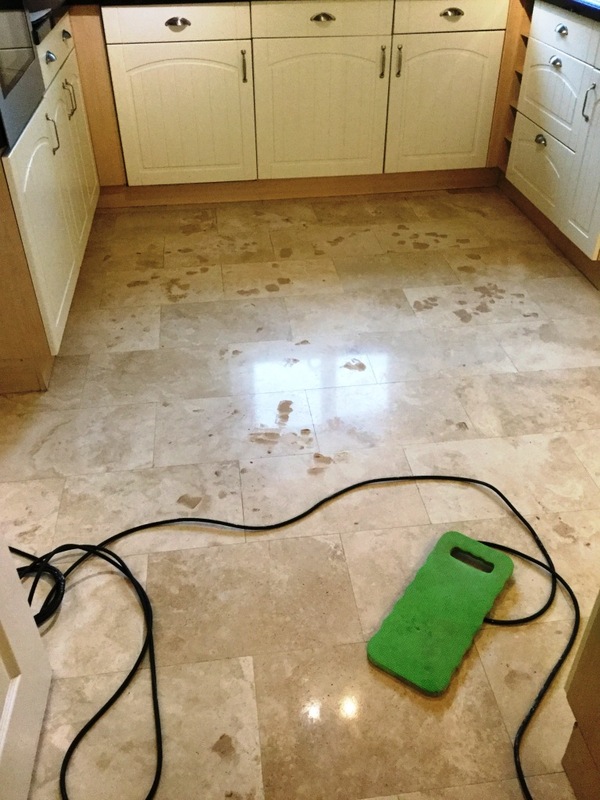 Upon my first visit to the property, I carried out a test clean on a small patch of Marble using Tile Doctor Pro-Clean, which is a high-alkaline cleaner that we find particularly reliable to use on natural stone. The customer was very impressed by the sudden improvement in the condition of the test patch. I also tested a new product by the name of Tile Doctor Rust Away, which is a non-acidic rust remover. Amazingly, the product helped to reduce the rust stain by about 90%. The full restoration was booked in to take place within a fortnight. The first part of the restoration involved cleaning the entire patio with Pro Clean, although I worked one small section at a time. 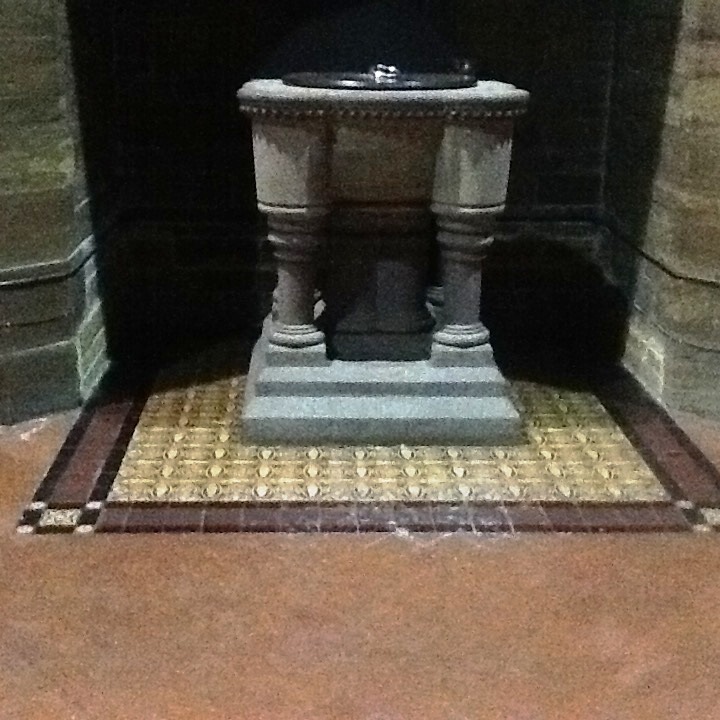 The product was worked into the stone using a black scrubbing pad fitted to a rotary machine. 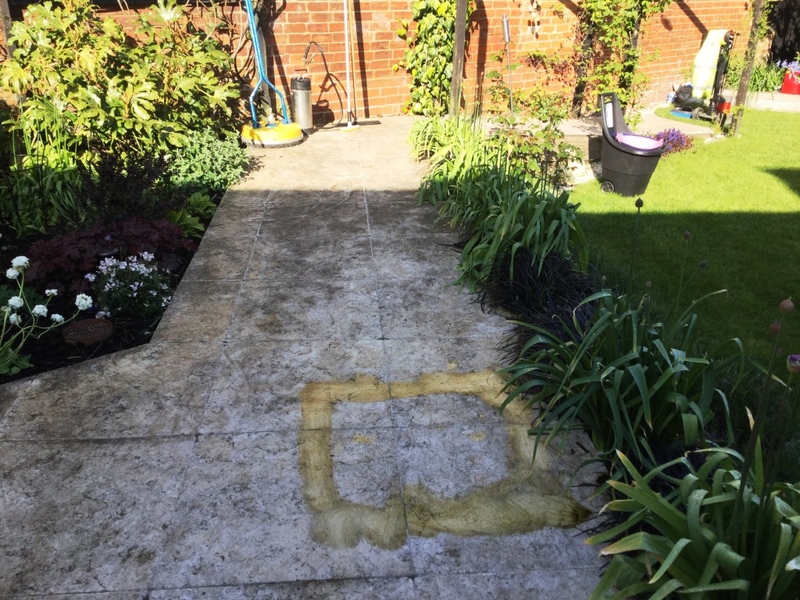 The resulting slurry was rinsed away using a Honda Petrol jet washer and a spinning tool, leaving the patio clear of most of the dirty, algae and moss. Next, I treated the entire rust stain with Rust Away. The product was scrubbed in using a handheld brush and left to dwell for a few minutes, before I rinsed the area with the jet washer and spinning tool. The stone had a matte finish, but to remove the deeper staining, I needed to use a set of three diamond-encrusted burnishing pads, which we typically use for polishing stone and removing light scratches and marks. Luckily, the weather proved to be good, so I could return to the property the following day to seal the patio, including the walls, with Tile Doctor Ultra-Seal, which is an impregnating, natural-look sealer designed to ensure maximum stain protection. The photos really do speak for themselves, showing the amazing results and transformation of the garden. I left the happy customer with some maintenance instructions to keep the appearance of stone up as it is exposed to the elements. 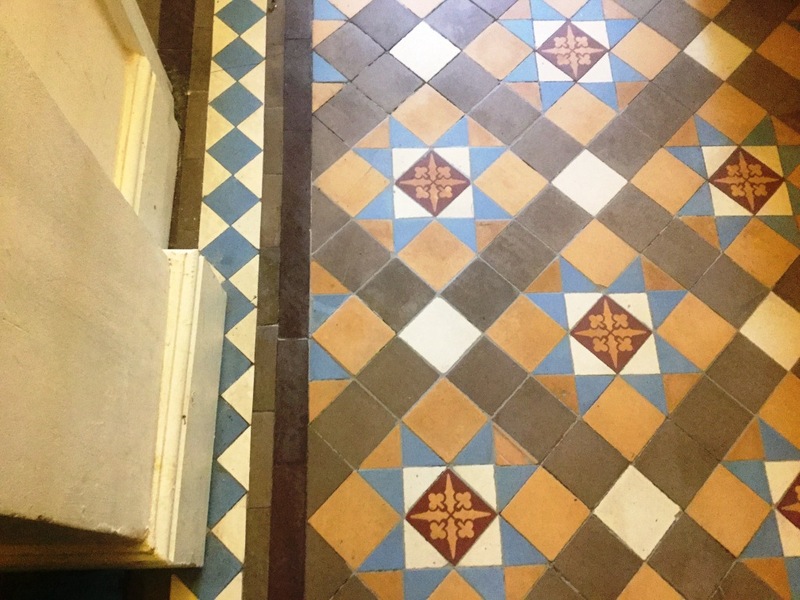 It was back in 2013 that I first visited this school in Oundle to attend to a 150-year old Victorian Quarry tiled floor which, at the time, had extensive problems with damp and a poor performing sealer that had gradually peeled away. Over a few weeks, we successfully stripped away the old and ineffective sealant and addressed the damp issues, before applying a breathable sealer. 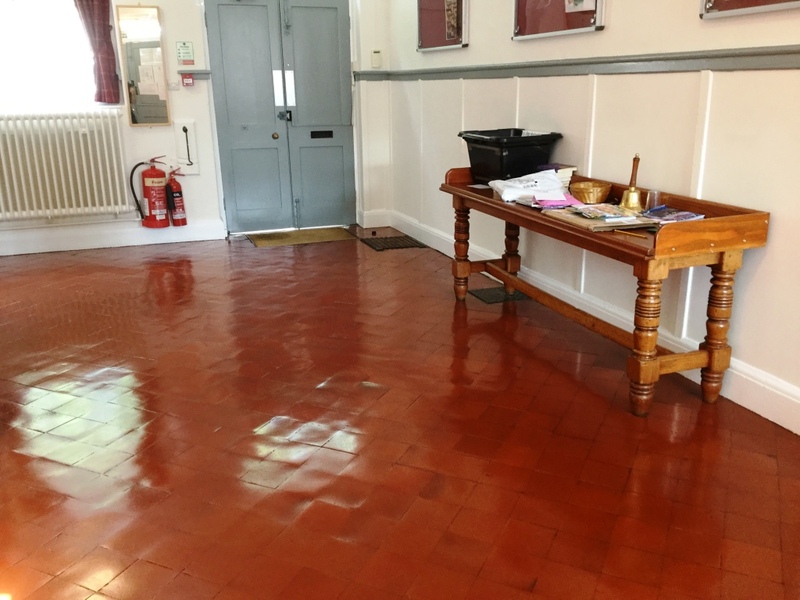 We subsequently allowed the tiles to successfully dry out for several months before returning to the school to provide a light clean and apply our topical sealer, known as Tile Doctor Seal and Go, as the school required a shiny, yet hard-wearing finish. As part of my initial visit, I had supplied the school with five litres of Tile Doctor Neutral Tile Cleaner, which is a pH neutral formula designed for regular use, and a white buffing pad. I had also spent an hour with their in-house cleaner (who was already familiar with using a buffing machine) to talk through daily maintenance of the floor, as over 100 children can be walking over these floors at any one time on an almost daily basis. Of course, not every floor will receive this amount of traffic and suffer from this level of wear and tear, but in these situations Tile Doctor can offer a maintenance plan for our customers. The school have me back annually to carry out a full maintenance clean and seal. This involves, firstly, etching the top coats of sealant with a green diamond-encrusted burnishing pad to remove any build-up of dirt and staining. Then, I rinse the whole floor with fresh water and soak up the residue with a wet vacuum. After drying the area with fans, I proceed to reapply two fresh coats of Tile Doctor Seal & Go. This is now my fourth year of visiting the school and, as the photos show, an annual maintenance plan is the best way to keep floors in top condition without the disruption caused by a full clean or restoration. Contact your local Tile Doctor consultant about the maintenance plan we offer for any natural stone flooring after an initial clean. 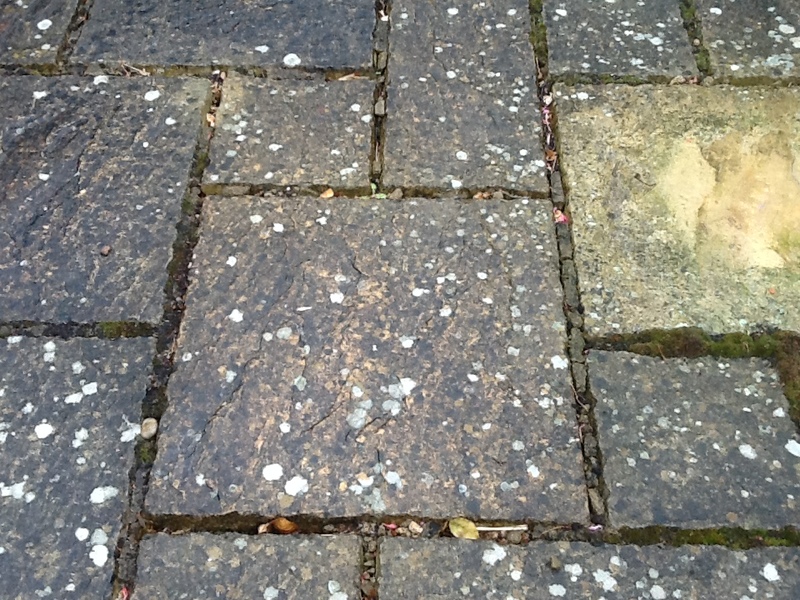 This customer, who lives in Wollaston, a small village in Northamptonshire, called me to look at the unfortunate condition of her Riven Slate tiled patio. She had hired a builder to install it, but he had neglected to remove the grout haze which had occurred quickly enough, allowing it to set. He was subsequently unable to remove the haze because he had already sealed over it. This had left it looking very unsightly, as you can see in the photo below. The customer initially contacted me back in December 2016. 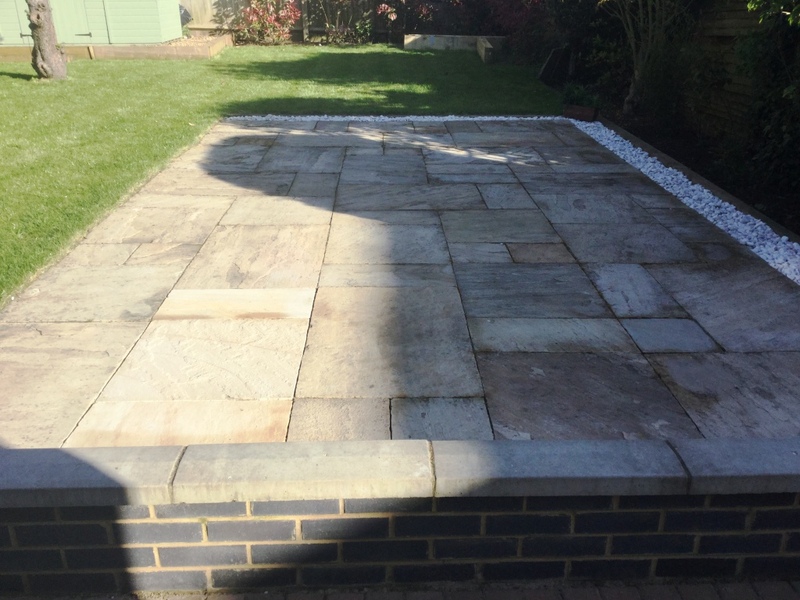 At that time, I did explain to the customer that the Winter wouldn’t be an ideal time to restore the patio, and that it would be best to carry out the work in the Spring. 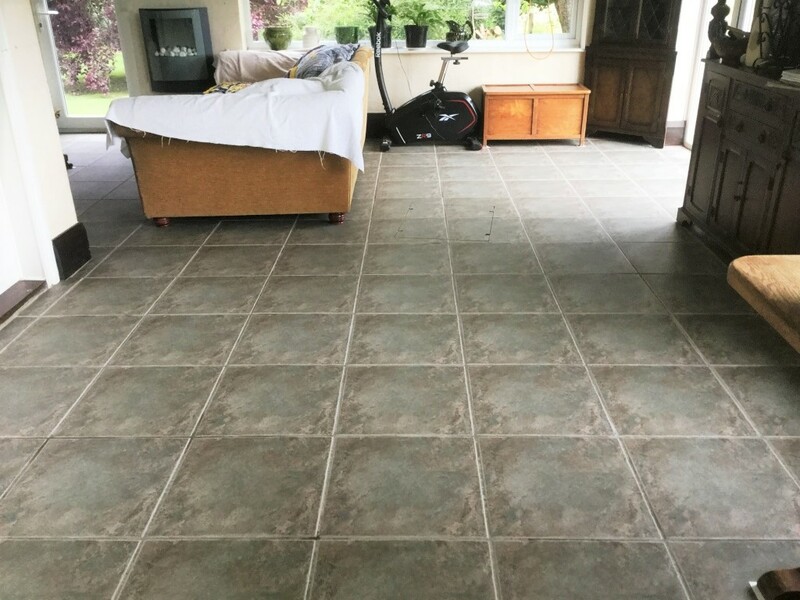 However, she was so unhappy with the appearance of the patio and – knowing she had guests coming over for Christmas – wanted something to be done to improve the condition of the tiles as soon as possible. It was agreed that I would immediately carry out the removal of the old sealer and the grout haze beneath, but leave the re-sealing until the Spring of the following year when the weather was dry. The customer understood that when I returned in the Spring, the patio would require another light clean and brush to prepare it for sealing. 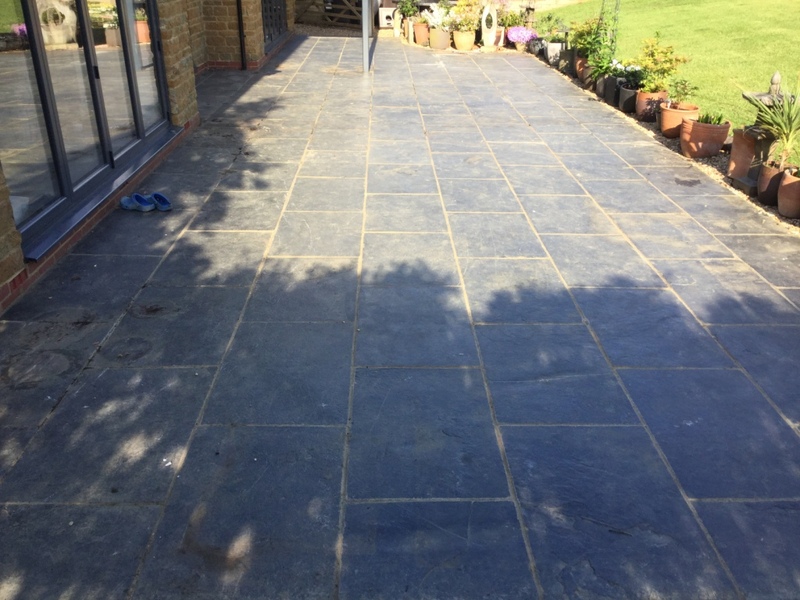 To put the customer’s mind at rest somewhat, I carried out a test clean on one slab of the patio using Tile Doctor impregnating, colour intensifying sealer, known as Colour Grow. 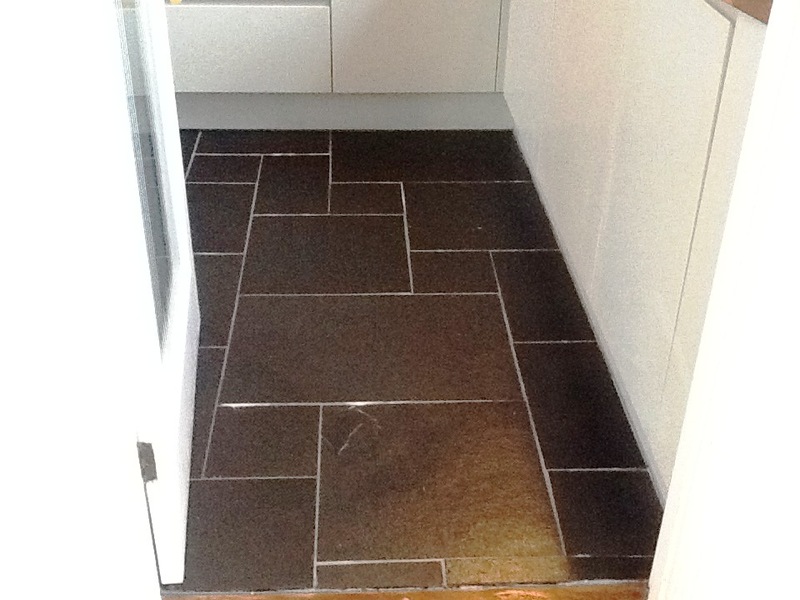 This darkened the tile and provided a natural look finish, which was preferred by the customer. I also returned to the property several days later to carry out a water repellency test, but as you can see from the photo below, the rain beat me to it. Thankfully, the repellency test had positive results. I was then able to begin the cleaning process. To begin, I removed the old sealer using a strong mix of Tile Doctor Remove & Go, which is a stripper and cleaner. This product was scrubbed into the tiles with a rotary brush machine. Net, I rinsed away the resulting slurry and soaked up the water with a wet vax machine. 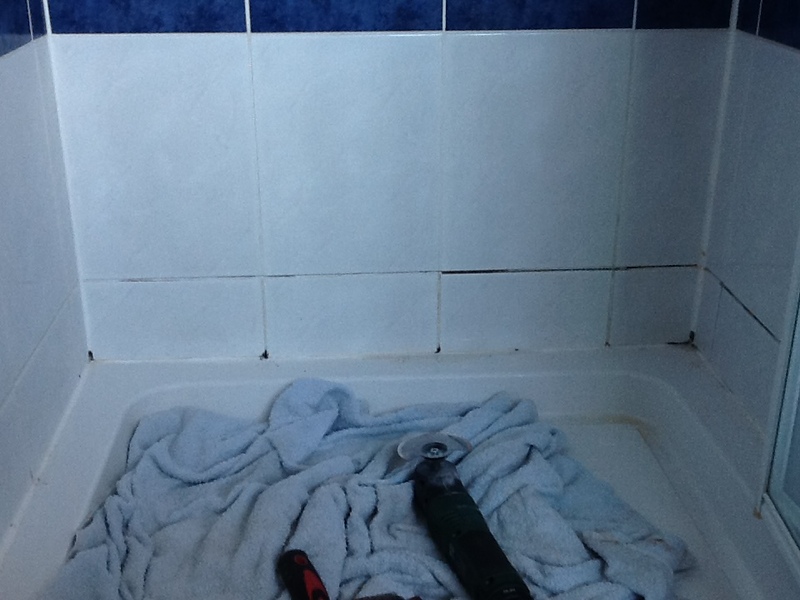 This initial clean exposed the true extent of the grout haze – it was over all every tile! My next course of action was therefore to remove this using Tile Doctor Acid Gel, which is a gel cleaner specially formulated to neutralise grout haze. This was allowed to dwell for a short period before I brushed it in. Following this, I gave the whole area a second brush with a small amount of water, before using a wet vax machine once again to make sure all cleaning chemicals were removed. I used the customer’s hosepipe to rinse down the entire patio as there was good drainage. I allowed the tiles to dry out naturally, before waited for a dry day in April this year to return to the property. 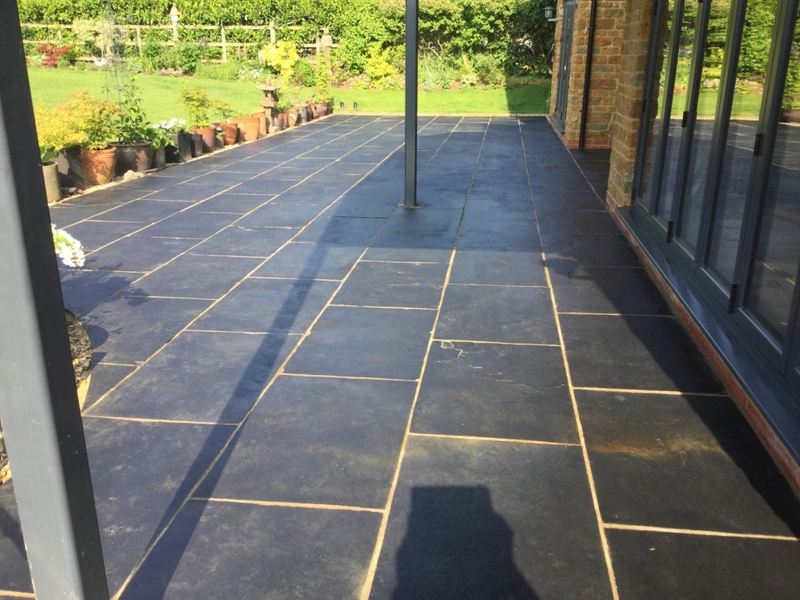 During this day, I sealed the entire area with Tile Doctor Colour Grow sealer to really deepen the colour in the stone and provide the whole patio long-lasting protection against the elements. 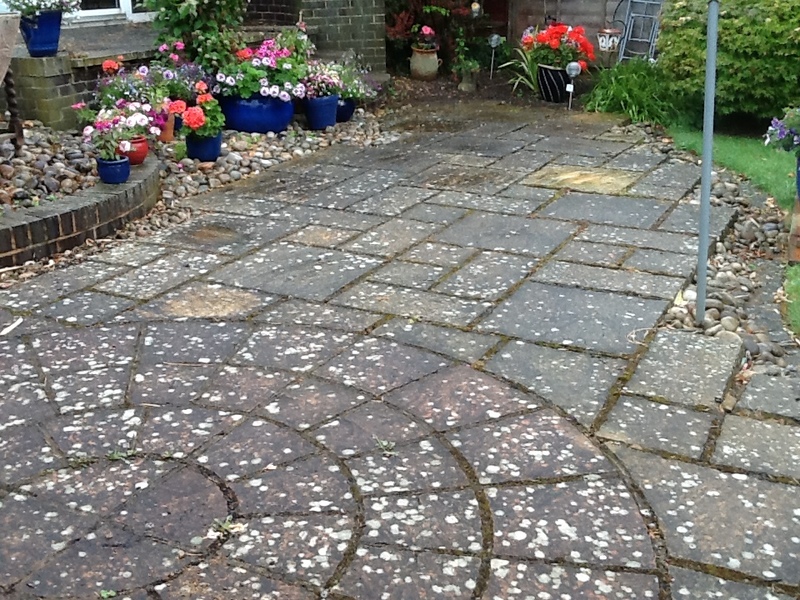 The customer was exceptionally happy to have the patio restored to perfect condition. I’m sure she’ll make great use of it over the Summer! 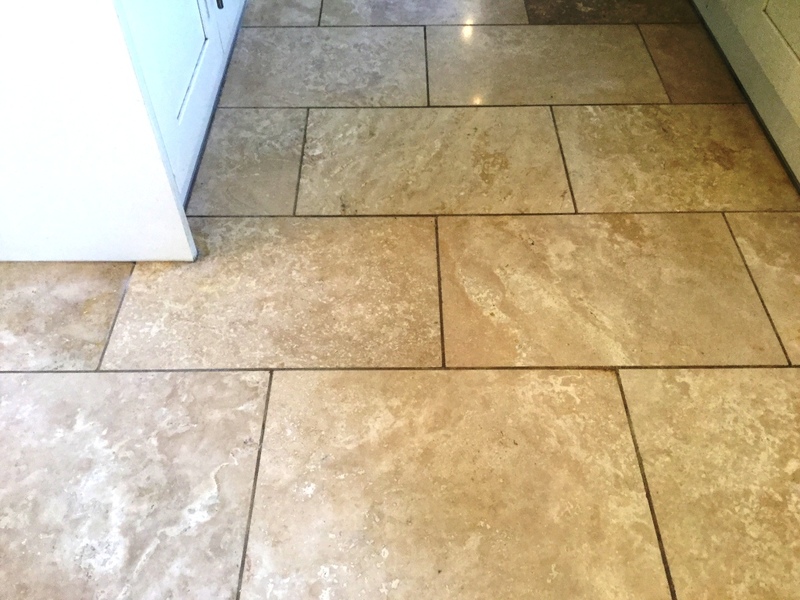 The problems with not maintaining a natural stone floor properly are manifold. 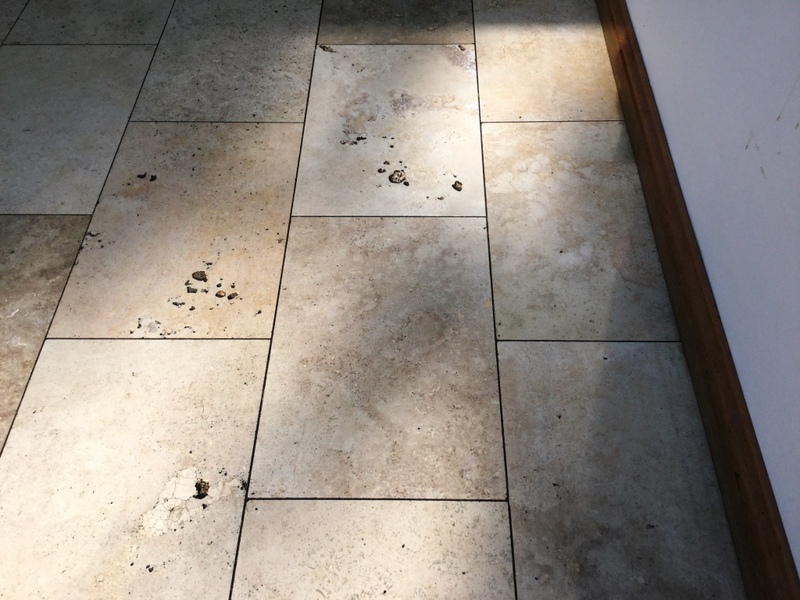 The build-up of ingrained dirt and muck is not just unhygienic, it also makes the stone appear dull and discoloured – and for many property owners, this can completely ruin the character of a room. Here’s an example of a very dull and lacklustre Slate tiled floor at a small cottage in Little Harrowden, which is tiny village of less than 1,000 people situated roughly three miles north-west of Wellingborough in Northamptonshire. The owner was concerned that the poor condition of the floor was making the feel kitchen narrow and confined, and so she called me to help with brightening it up with a deep clean and seal. Achieving a sheen finish would help to reflect the natural light that comes into the room. I began the restoration by masking up the edges of the room and applying a clear silicon to the base boards of the kitchen units to prevent any water damage. 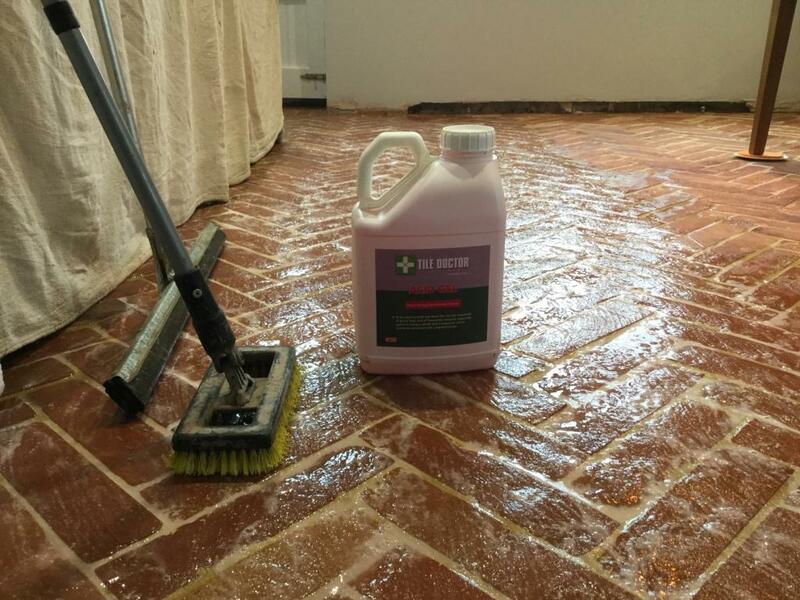 My choice of cleaner was Tile Doctor Oxy Gel, which is a strong alkaline-based gel cleaner. It’s like Tile Doctor Pro Clean, which is also alkaline-based, except it sticks to the tile due to its consistency and so it’s excellent for cleaning vertical surfaces such as bathroom walls. On this occasion, I wanted to use Oxy Gel to keep the amount of water I needed to use to a minimum. Since this was an old cottage there were a few damp issues that I wanted to avoid exacerbating. I spread the Oxy Gel out evenly over half of the floor, before agitating it with rotary brushes. I allowed this to dwell for 10 minutes before adding a small amount of water and agitating the floor again, this time paying attention to the grout lines, which were very badly soiled. This process was subsequently carried out over the rest of the floor. I wet-vaxed each area after completion of the process and then wet-vaxed the entire floor again to neutralise the tiles and remove any remaining product. The floor was then left to dry overnight. Returning to the property the following day, I took damp meter readings to see if the tiles were dry enough to be sealed. As I mentioned, the floor had some damp issues so this was important to check. I did, in fact, have to use a heat gun to finish drying a few damp areas of grout. 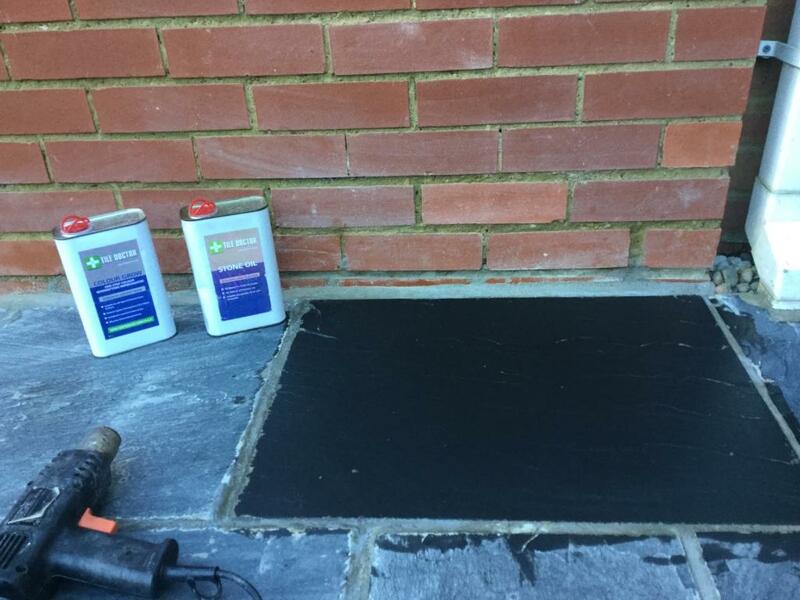 Once satisfied, I sealed the Slate with Tile Doctor Seal & Go Extra, which is a breathable water-based sealer, which is ideal in situations where no damp proof membrane is present or where there are damp issues. Once dry, the sealer provides an aesthetically pleasing light sheen finish. 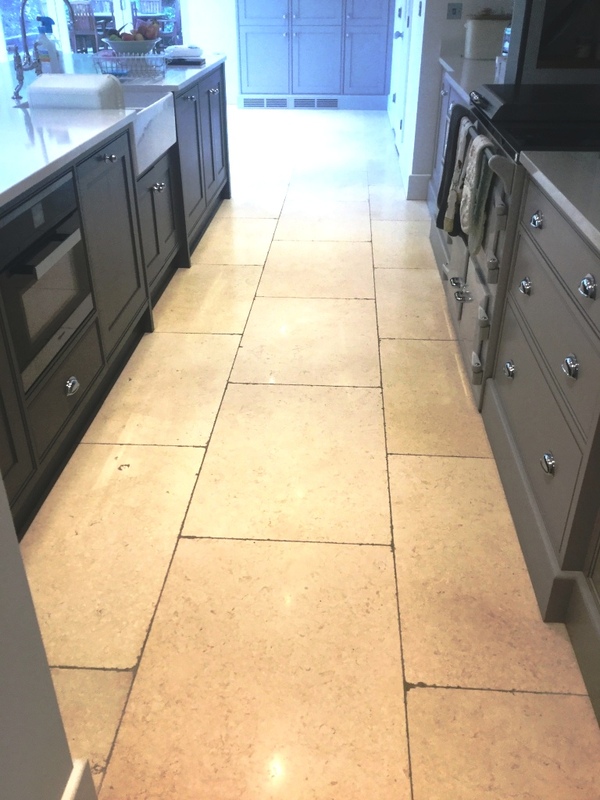 As you can see from the photo below, the deep clean and fresh seal really helped to improve the patina of this Slate tiled floor, helping the entire kitchen feel brighter and more spacious. Another satisfied client! 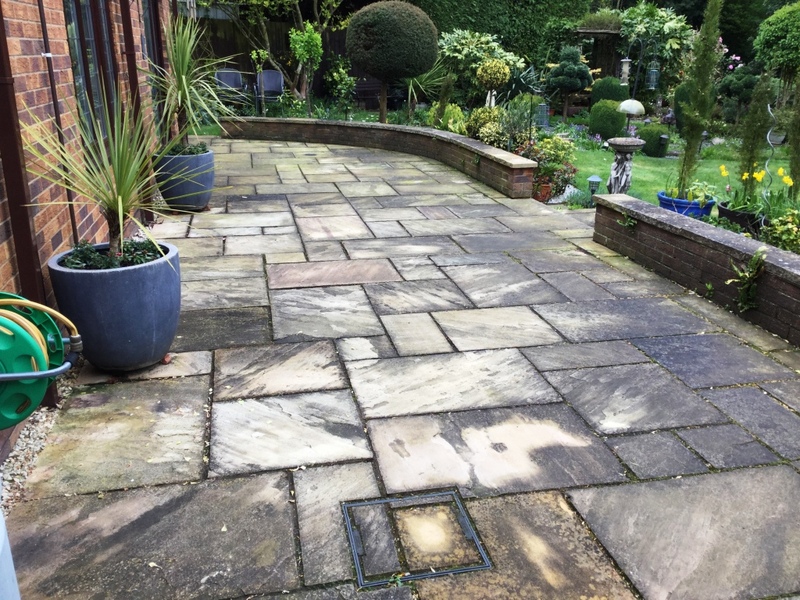 At the start of the year we usually get asked to restore the appearance of patios and other outside areas which have suffered from the staining of autumn leaves and the ravages of winter cold snaps. 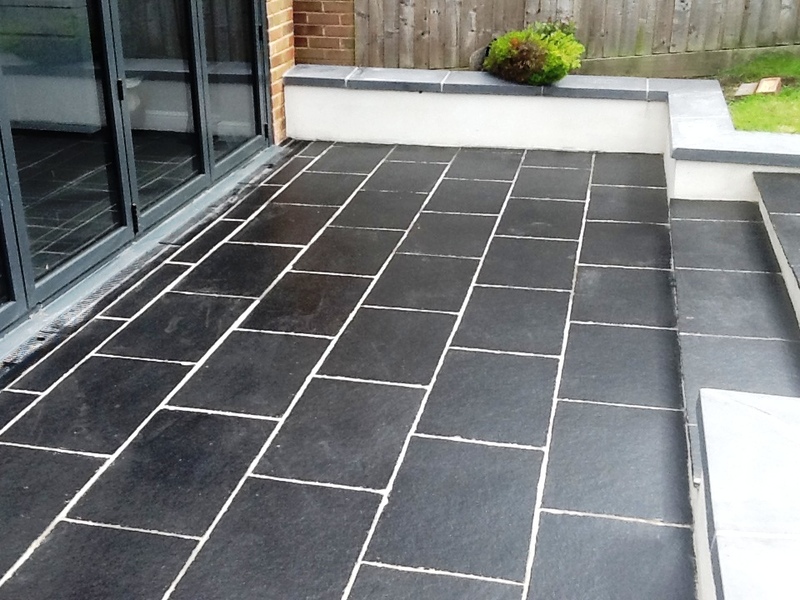 Most patios are quite straight forward to maintain however when you’re dealing natural stone then it’s best to call in your local Tile Doctor to ensure nothing is applied to the stone that could damage it. 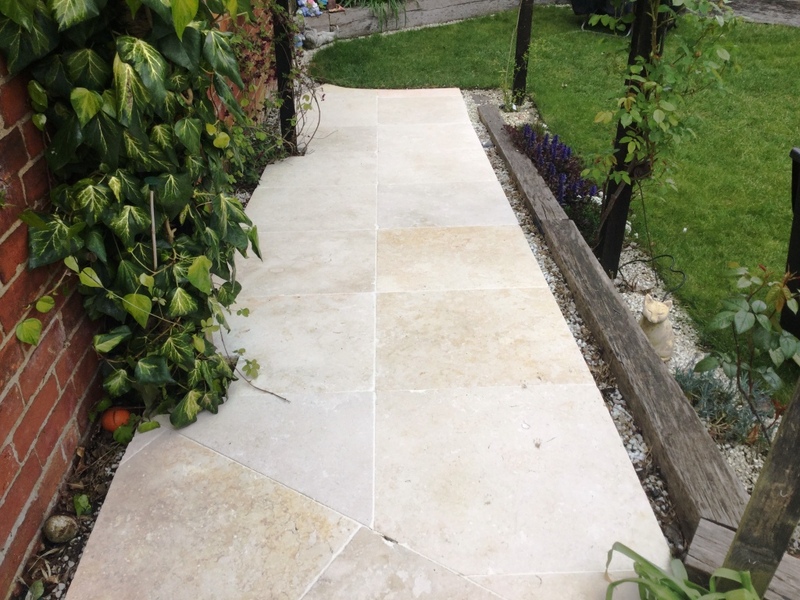 Such was the case with this four-year-old Sandstone Patio at a house in the town of Kettering. 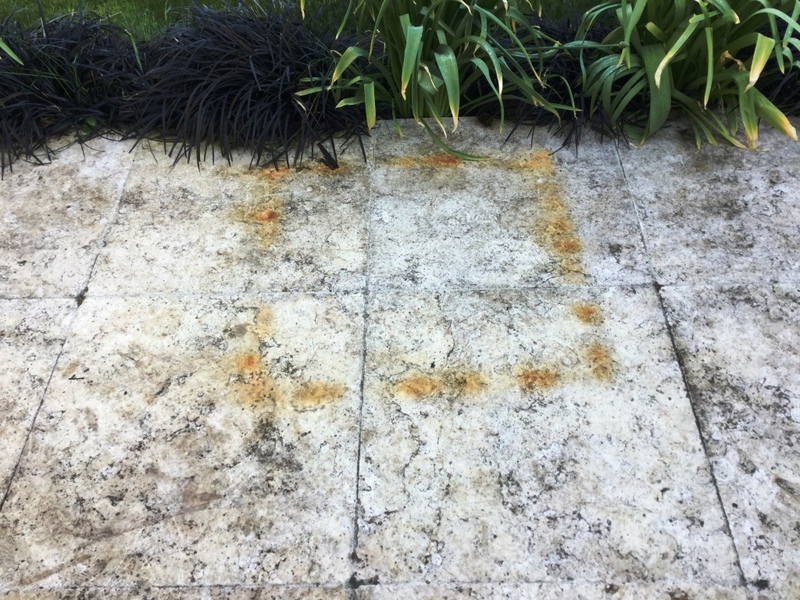 Unfortunately, it was not sealed when it was first installed and the combination of weather and UV sunlight had faded the tiles, this together with general soiling had greatly affected the appearance of this beautiful stone and could almost have been mistaken for concrete slabs. 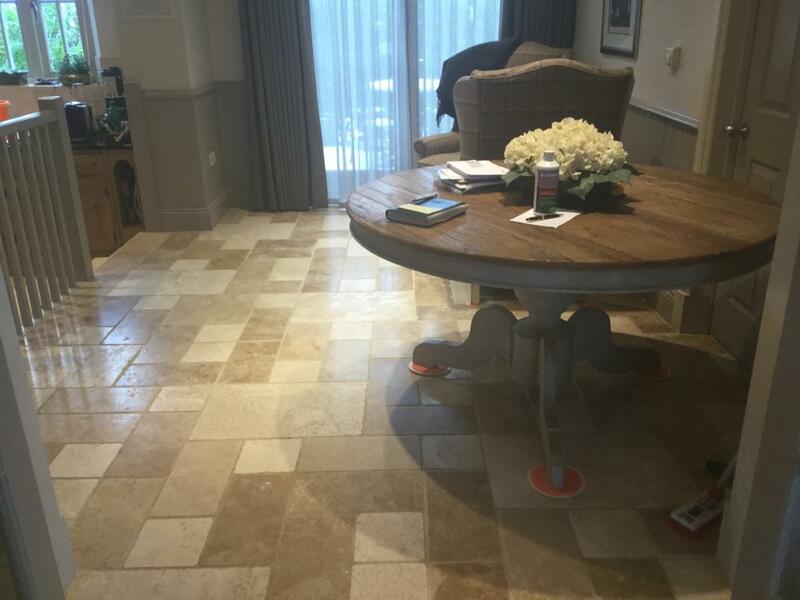 My first course of action was to lightly spray the area with a dilution of Tile Doctor Pro-Clean which is a powerful tile cleaning product that is safe to use on Stone. The solution was allowed to soak in for a while before being agitated with a brush to bring out the dirt. This was followed by pressure washing with a spinning tool at a medium pressure so as to not damage the stone. 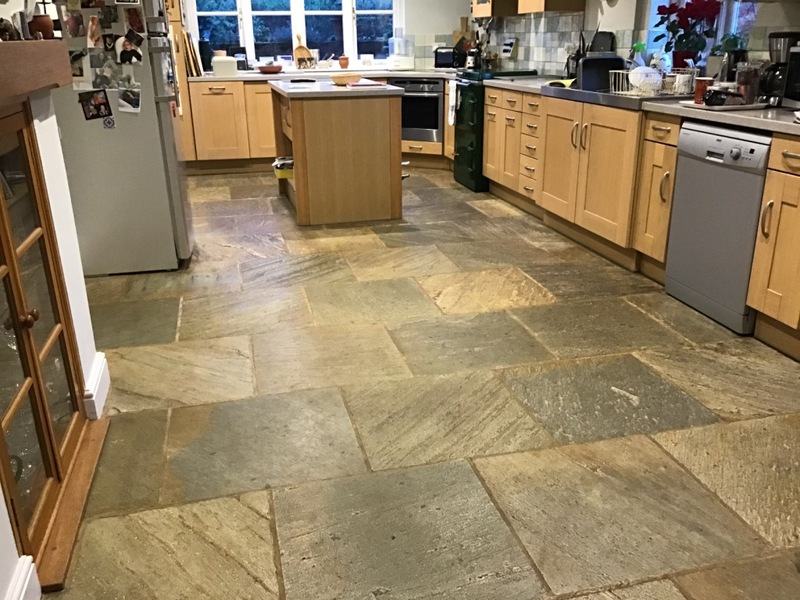 Once dry I re-grouted the entire area and then sealed with Tile Doctor Colour Grow Sealant which is a impregnating breathable product (essential for damp environments) that also enhances the natural colours of the stone. Within hours of finishing the customer came home and called me straight away to say he couldn’t believe the transformation that was achieved and they looked better than when they were first laid. 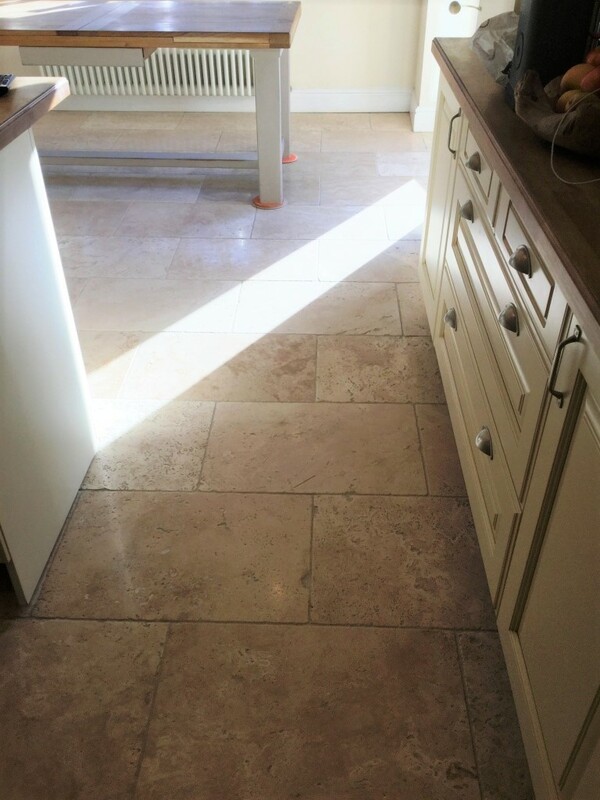 This Travertine Tiled kitchen floor was in a farmhouse close to the village of Newnham near Daventry. 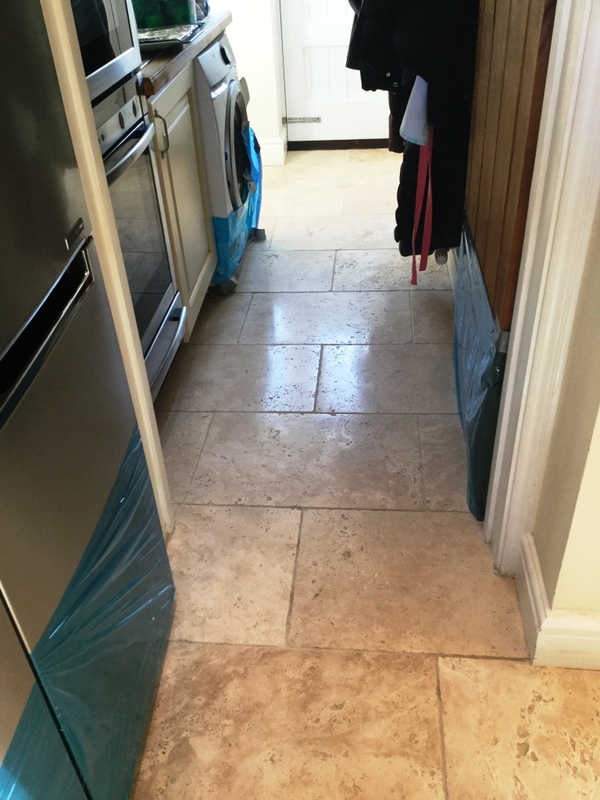 The client had called us in because she was concerned that her floor was becoming increasingly difficult to keep clean which was due to the small holes and pits becoming ingrained with soil and it was becoming difficult to remove as the original sealant had worn off. 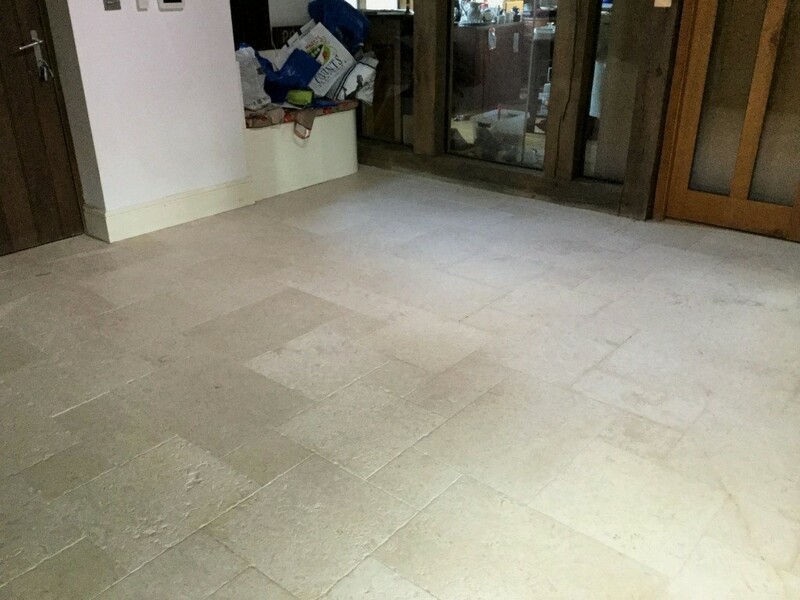 Hopefully you can see from the pictures the results that can be achieved on a badly stained and pitted Travertine floor. The first photo below shows the extent of the problem due to many holes in the floor, this is a characteristic of Travertine and normally these holes are filled in the factory but the filler does come out over time leaving holes. 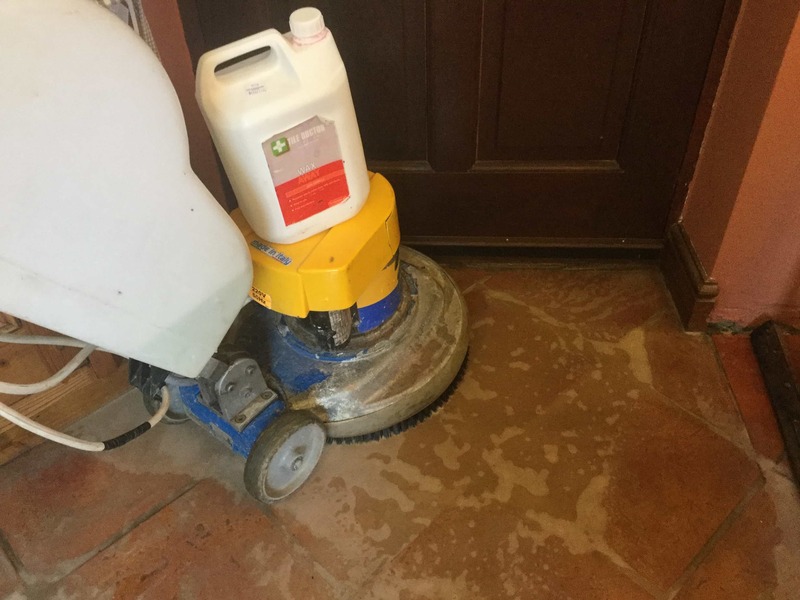 The floor was cleaned using a combination of Tile Doctor Burnishing Pads to re-surface the tile and the application of Tile Doctor Grout Pro-Clean agitated with a stiff brush to clean out embedded soil in the pits and grout lines. The Burnishing pads fit a rotary floor polishing machine and come in a series of different grits which are applied from Coarse through Medium and then Fine and lubricated with a little water. I also carried out some repairs to the larger holes with a travertine filler that was mixed to match the existing colours. The second picture shows the repairs in progress, the filler is mixed and applied before leaving an hour and then polishing off any excess filler with dry cloth, the floor was then vacuumed and allowed to fully dry overnight allowing the product to harden. 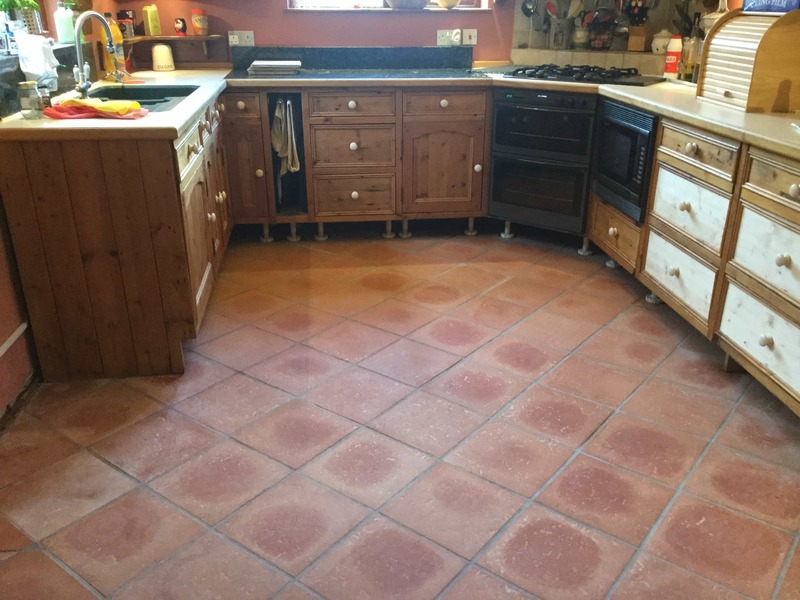 The floor was polished and sealed the following day using 2 coats of Tile Doctor Ultra Seal sealant to protect the grout lines and stone from any staining in future, it leaves a no-sheen natural look which worked very well in the kitchen area. I waited a for the sealant to dry and then carried out a water repellency test to check it was fully sealed before giving the floor a final polish using a Tile Doctor Polishing Pad. 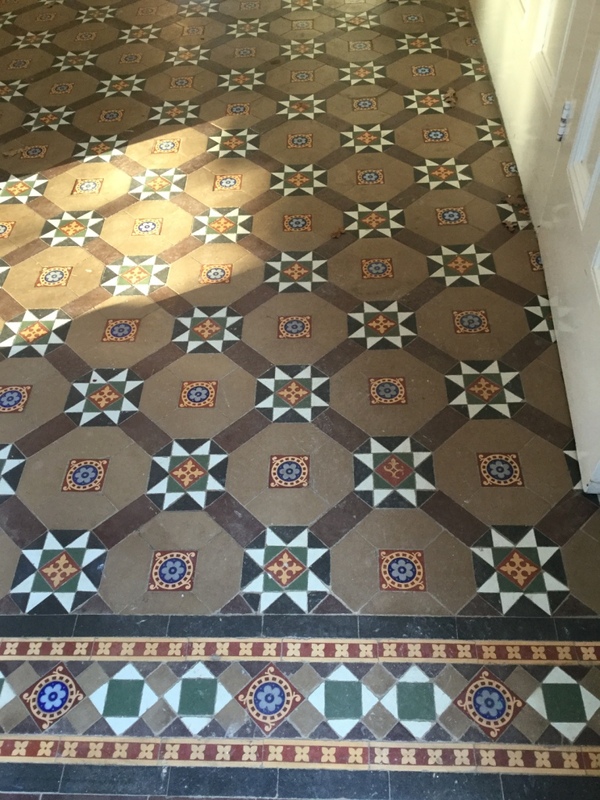 The pictures below were taken of a Victorian tiled hallway floor in a large property in the old village of West Haddon. 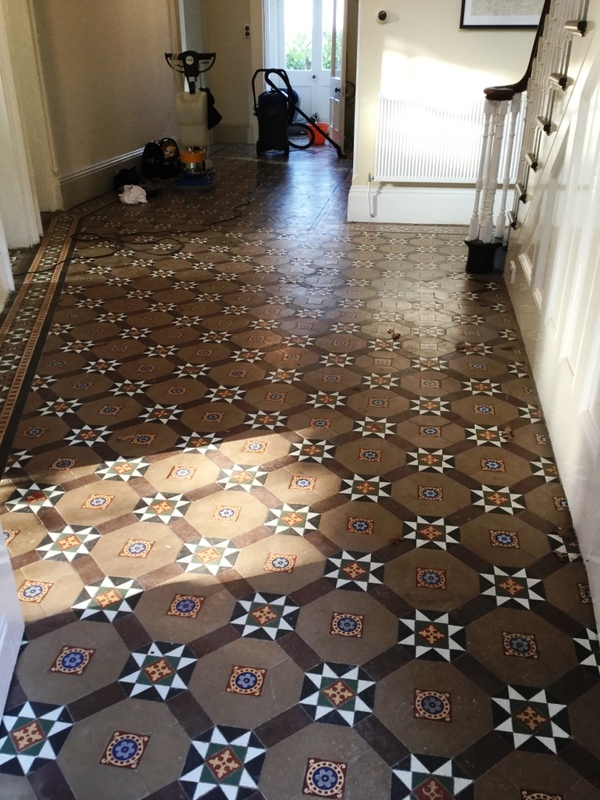 The tiles were in good physical condition for its age but required attention as it was looking very dull and dirty due to not being sealed for many years allowing a build-up of soil to embed in the surface of the tiles making cleaning very difficult. 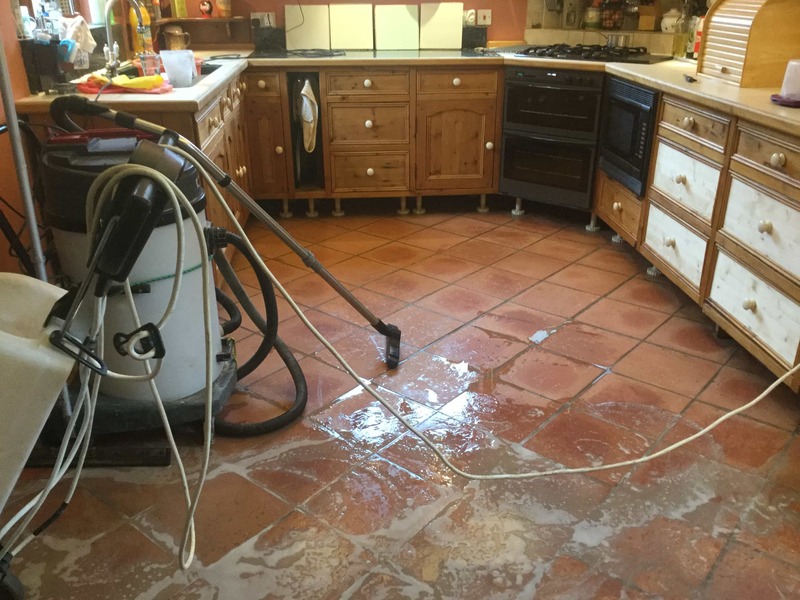 My first course of action was to vacuum the floor to remove light dust and debris, this was followed by applying Tile Doctor Pro-Clean diluted with warm water spraying several metres at a time. The solution was allowed to soak in for a short while before being agitated with a rotary machine fitted to a rotary machine and a stiff grout brush which was run along the grout lines. The section of floor was then rinsed with water and then this was extracted with a wet pick up machine. This process was then repeated through the entire area. I then switched to a new cleaning process for Victorian tiles that was taught on a recent Tile Doctor training course. Basically it involves using a special diamond impregnated burnishing pad fitted to a rotary machine to resurface the tiles using just water. Again I worked in small sections until I had covered the entire area. 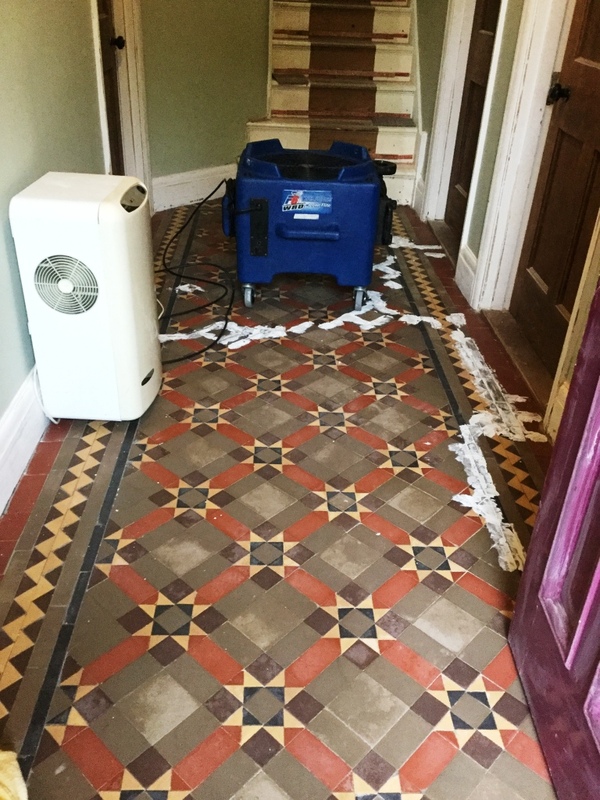 A common issue with these old Victorian floors is they were usually laid without a damp proof course; as a result it’s not uncommon for white salt deposits (efflorescence) to appear a few days after cleaning. To counteract this I gave the floor an acid wash using Tile Doctor Acid Gel, leaving it to dwell before rinsing. This helps neutralise the tile and will combat any salts rising up through the floor later. I returned the following day to carry out repairs and to re set a couple of loose tiles which is not unusual for a floor of this age. The floor was then left to dry for a further day with a dehumidifier on site before returning to seal the floor with a breathable sealer for which we used two coats of Tile Doctor Colour Grow. Colour Grow does a really good job protecting tiles as it soaks into the pores of the tile enhancing its colours whilst protecting from within however it leaves a matt finish and the customer wanted a sheen finish. This would not be a problem to achieve however it would require the application of another product and I was still concerned about potential efflorescence issues which would be more difficult to resolve with the application of a further sealer so I agreed to return several weeks later to finish the job. As agreed I returned a few weeks later which allowed the floor to dry and guard against any damp issues and on my return I was happy to confirm the floor had fully dried using my damp meter and further there were no signs of efflorescence. I then applied 5 coats of Tile Doctor Seal & Go to give the customer the required finish she was after. I also left the client a free sample of our cleaning solution Tile Doctor Neutral Clean together with written maintenance instructions to help keep the floor looking its best for years to come. Limescale deposits are a big problem in many parts of the UK where hard water is common. 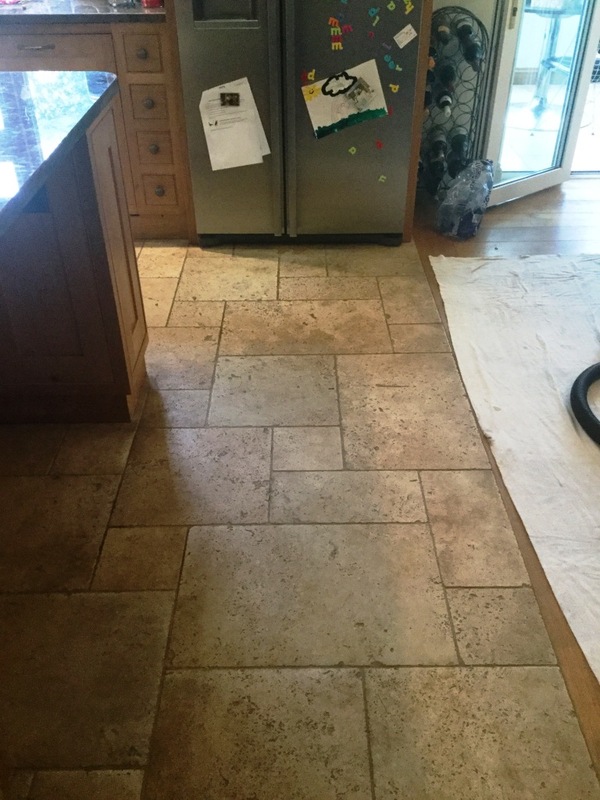 To remove it you need to use a strong acidic cleaner however what to do if you have limescale deposits on Limestone? As many may already know, Limestone is an expensive, high-quality stone that like a lot of natural stone is acid sensitive and can be damaged with the application of acid-based products. You can use acids on Limestone however if your careful and I demonstrated this recently at a property in this village of Everdon near Daventry in Northamptonshire. 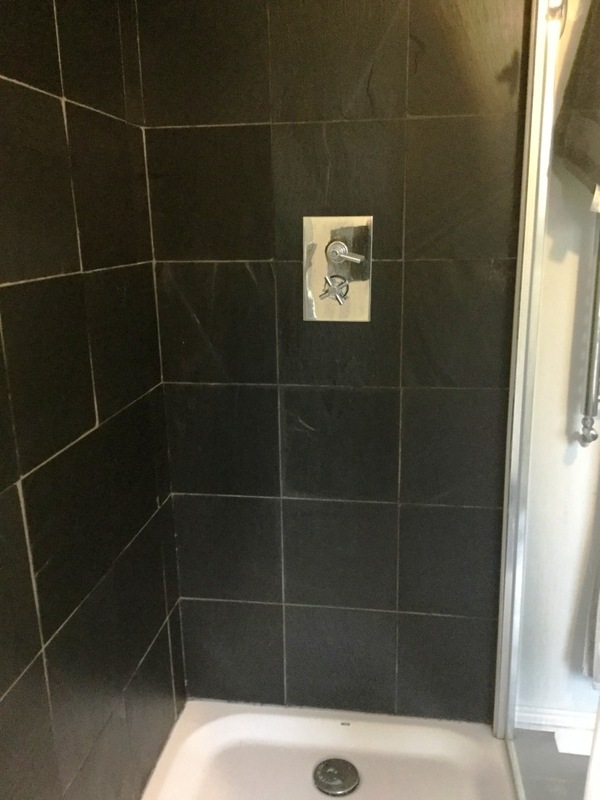 My customer had a fantastic black Limestone tiled shower cubicle that had been absolutely ruined by white limescale staining and it had reached the point where the situation simply couldn’t be resolved with standard cleaning products. As the staining was so severe, I opted to use Tile Doctor Acid Gel to clean the tiles. This is a blend of phosphoric and hydrochloric acids in gel form and is the best product for cleaning vertical services, since water based products just run off and don’t have time to work on the staining. Working in small areas, I carefully scrubbed the product into the stone and then rinsed it off with plain water. This process was repeated across the whole cubicle, reducing the stains significantly in the process. Next, I used a handheld polishing machine fitted with 6” diamond encrusted burnishing pads, along with some water for lubrication, to polish and deep clean the stone, removing any stubborn stains remaining on the tiles. I left the cubicle to dry completely overnight. Upon my return the next day, I proceeded to seal the tiles using two coats of Tile Doctor Colour Grow sealer. This sealer is impregnating, meaning it fils the pores of stone to protect against ingrained dirt and staining. As well as providing stone protection, Colour Grow also enhances the natural colour in the stone – in this case, the deep black shades in the Limestone. Having finished the job, I gave the very happy customer some advice on keeping limescale and other staining at bay in future. 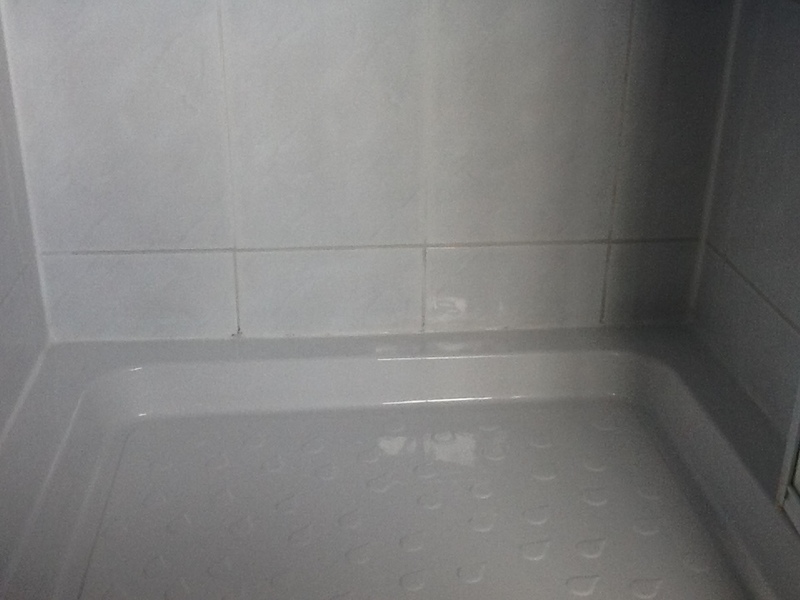 I explained that proper maintenance can be conducted by simply rinsing the tiles with clean water after each use of the shower, and by using Tile Doctor Aqua-Pro tile aftercare cleaner at least once a week. 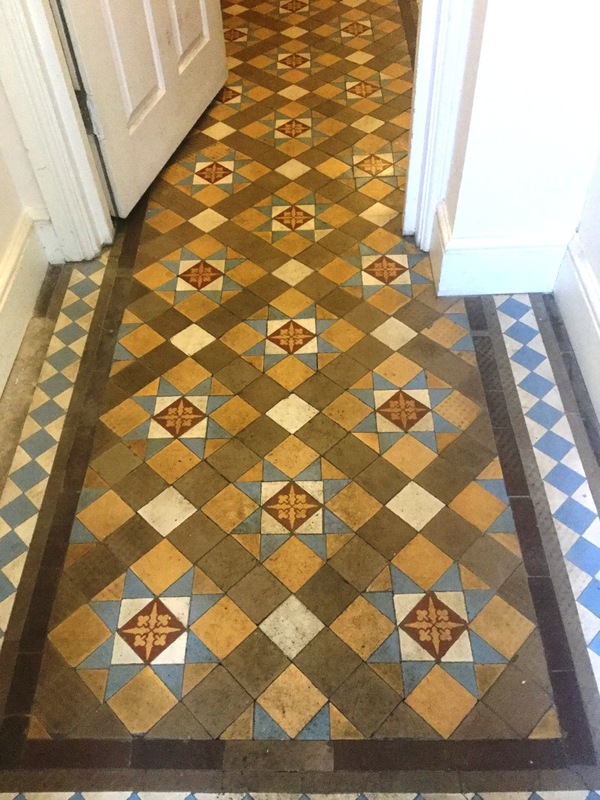 The photographs below are from a Victorian tiled hallway floor at a house in Northampton where I was called in by the owner to inspect the floor for restoration, deep cleaning and re-setting of all loose tiles covering around 3sq metres. 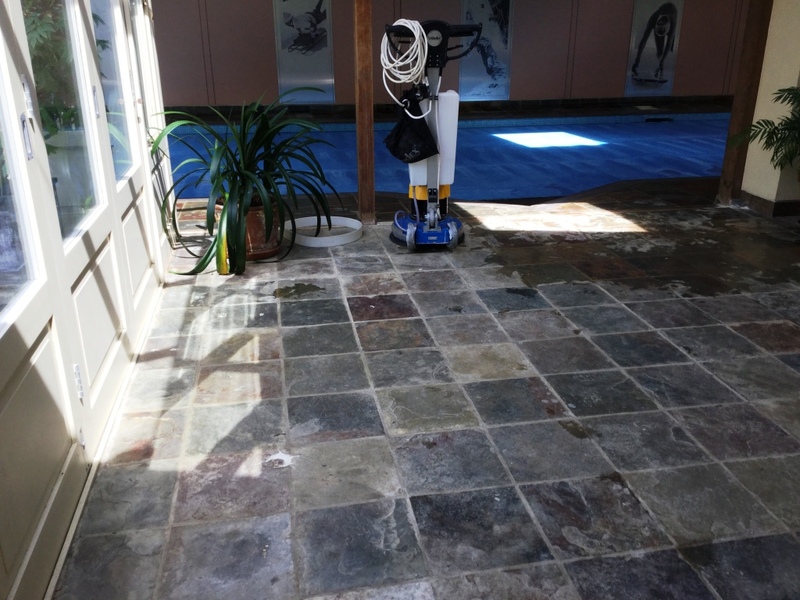 The initial process was to vacuum and remove any loose debris before applying Tile Doctor Oxy-Gel to the entire area. Oxy-Gel is a strong alkaline based gel cleaner/stripper which is safe to use on tile and grout and being gel based it’s very easy to control. The gel was left to get to work on the dirt for ten minutes before being scrubbed into the tile with a black stripping pad fixed to a rotary floor machine. The resultant slurry and dirt was then rinsed with water and removed using a wet vacuum. 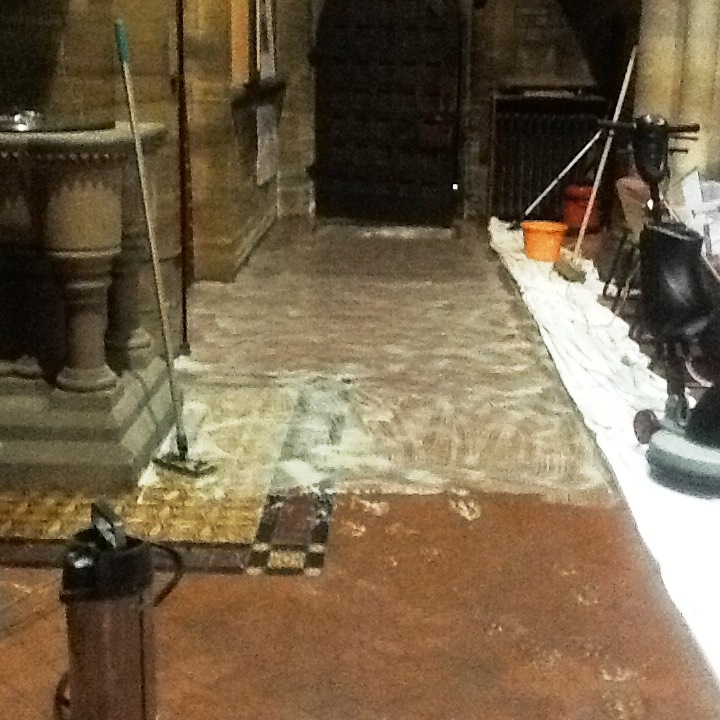 The floor now free of dirt and old sealers was now prepared ready for repairs and re-grouting. The next step was to remove small sections of loose tiles and then re-fixing and re-grouting as required. 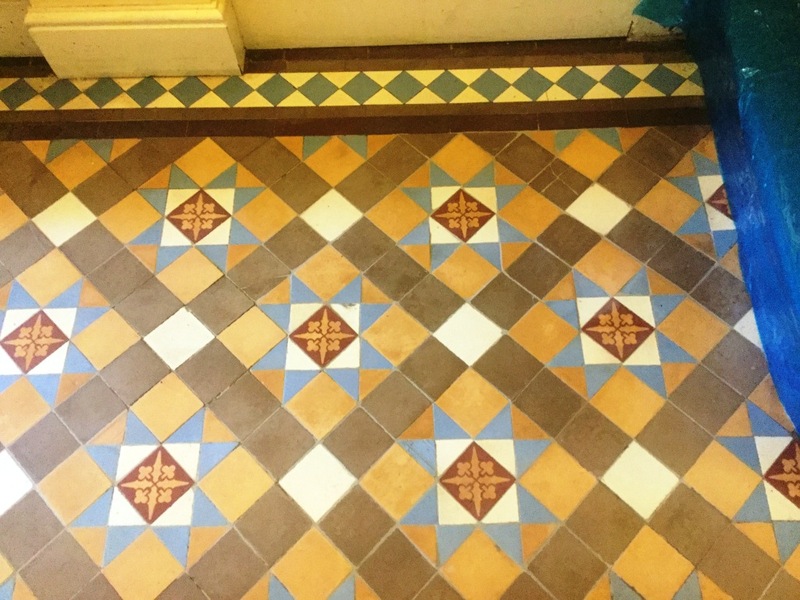 We took care to replace tiles into their original position to ensure they sat together correctly. Once the section was replaced I removed the tiles in the next section and repeated this process until the 3sq metres of loose tiles were all reinstalled. 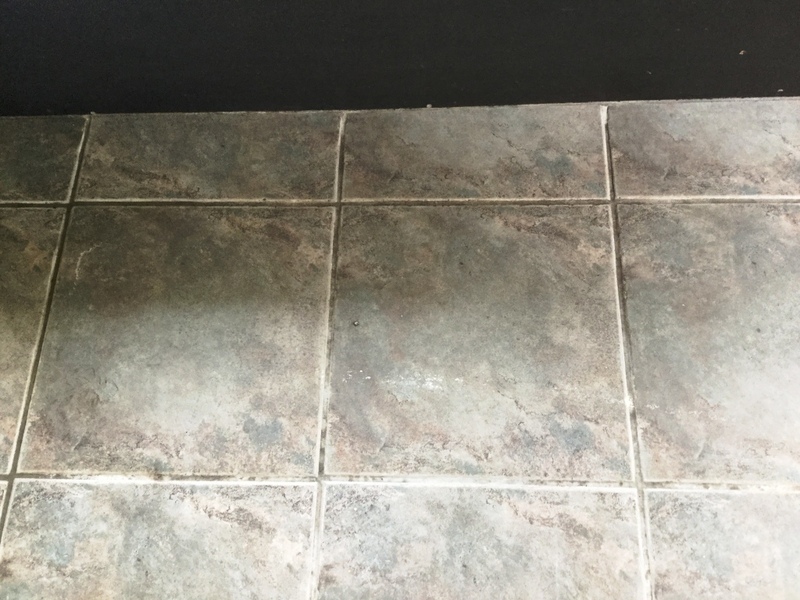 I allowed the grout to dry for a few hours before polishing off excess grout with a cloth and removing difficult grout smears with a weak solution of Tile Doctor Grout Clean-Up. The floor was then rinsed again using water to remove any trace of products and then dried using the wet vacuum. 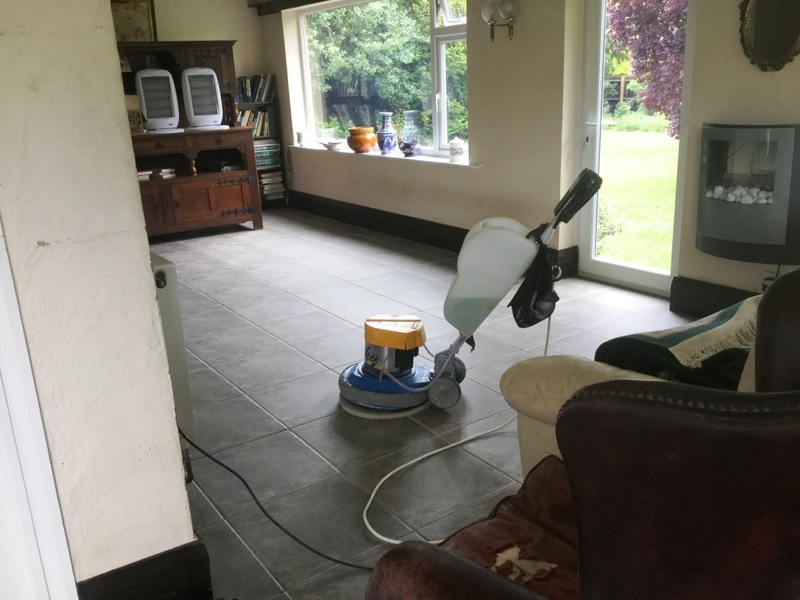 I returned a few days later to ensure the floor was completely dry as dampness can be issue with this type of tile, I then vacuumed the floor and gave it a light clean with Tile Doctor Neutral Cleaner to make sure it was spotless before sealing. Once the floor had dried I took damp readings and when satisfied the floor was dry again I applied three coats of Tile Doctor Colour Grow Sealant for a light sheen finish and to enhance the natural colour of the floor. Colour grow is a penetrating sealer that protects from within by soaking into the pores of the tile stopping dirt from becoming ingrained there, it also enhances colour. 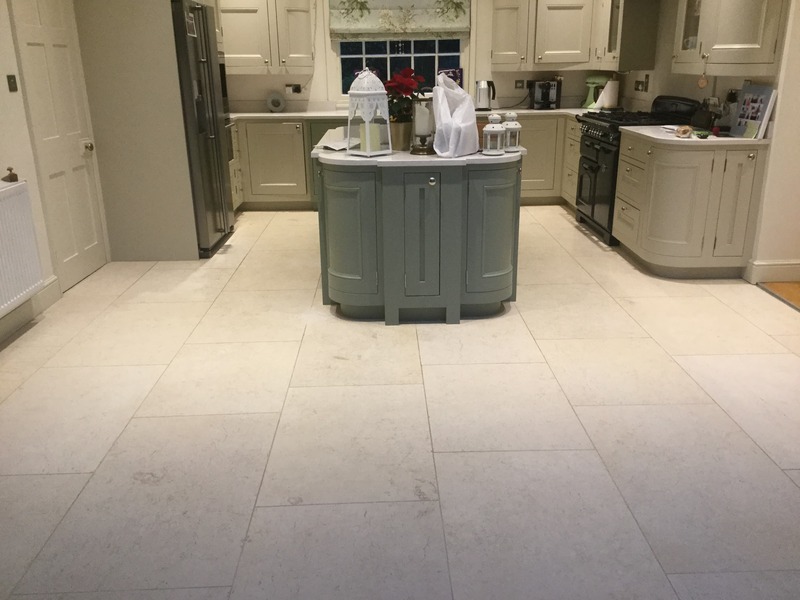 Limestone is known on the international market to be a stone of premium quality, durability and toughness, and Limestone tiles give any property a high-end wow factor when they are looking their best. To maintain that appearance however does require some work and this is where Tile Doctor is happy to assist. 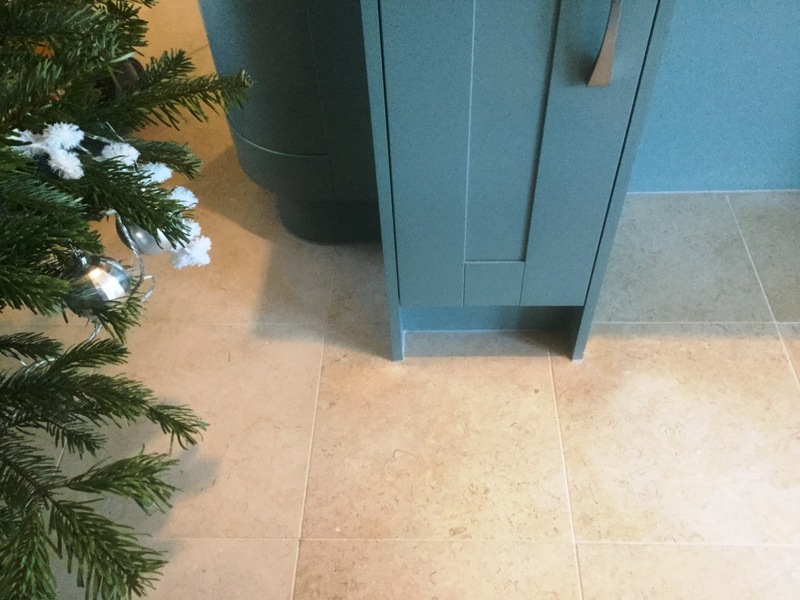 This Polished Limestone tiled floor had been installed four years prior in the kitchen and living room of a house in Ashton Village, near Oundle in Northamptonshire. 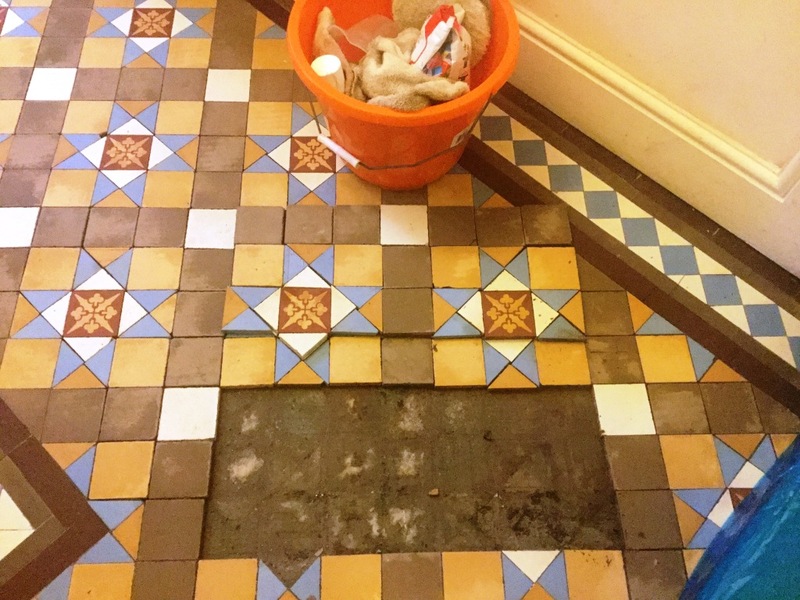 The tiles had lost their shine and the grout had become dirty and stained and the floor in general was proving to be increasingly difficult to clean. 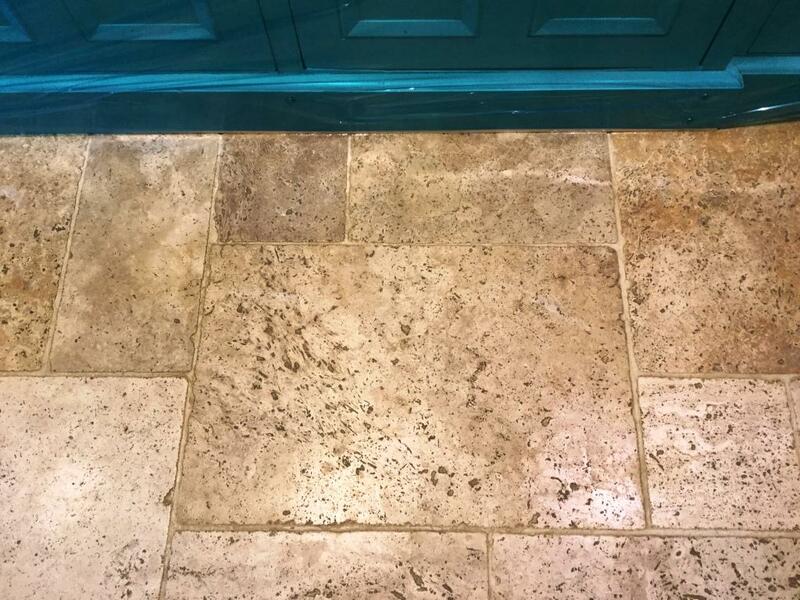 This is a common problem with polished stone floors, the surface polish and sealer wear down over time allowing dirt to penetrate. 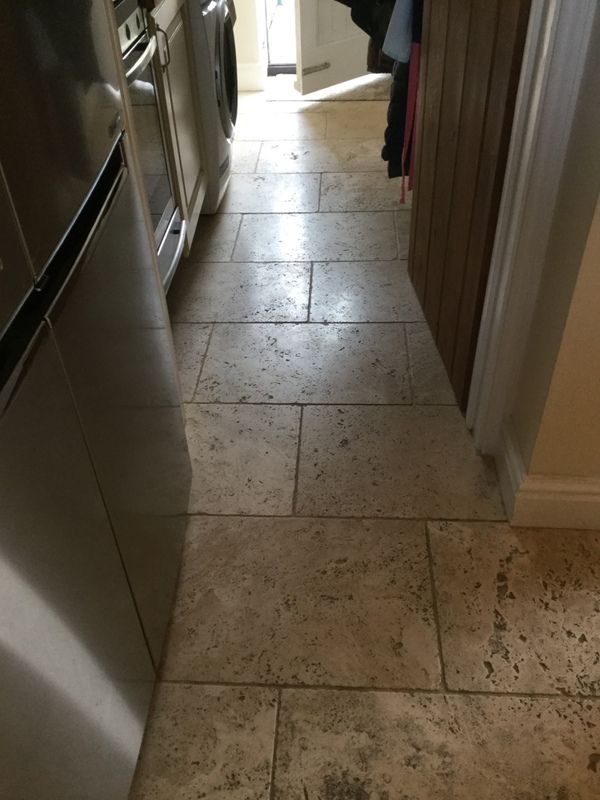 At a loss with what to do to restore the appearance of the floor, the property owner called me in to give the Limestone a professional-level clean, seal and polish. 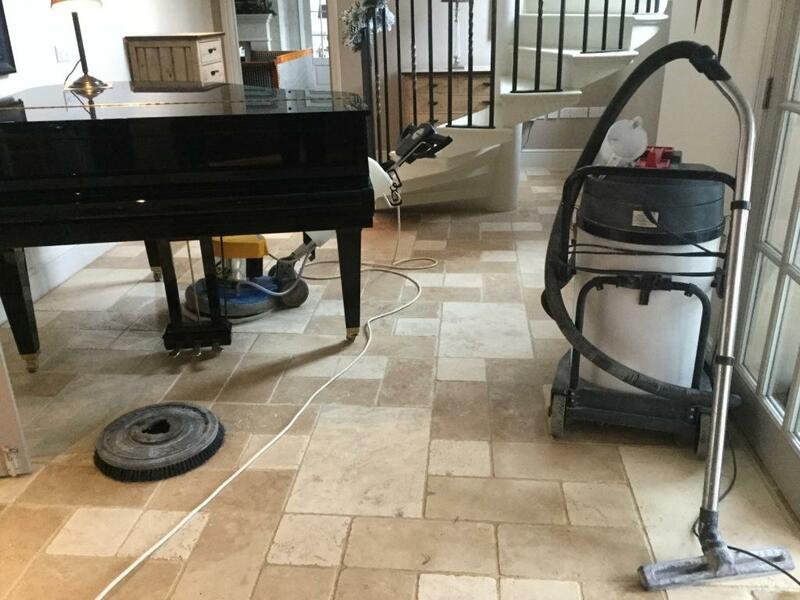 With tiles made of Limestone, Travertine, Marble and other high quality polished stone, we find that the best way to restore appearance is through a process known as burnishing. Our burnishing system involves the application of four different diamond encrusted pads. Working in small sections of between four and six square metres, I applied the first pad, which uses a coarse grit to remove light scratches and dirt, followed by a pad with a medium grit pad to prepare the floor for polishing. Next, I used the third pad with a fine grit to start the polishing process. Before moving on to the fourth and final pad, I cleaned the grout lines using handheld brushes in combination with Tile Doctor Pro-Clean, which is a high alkaline tile and grout cleaner that is safe to use on tiled floor. The floor was rinsed and the soiled cleaning solution extracted using a wet vacuum. Following this, I allowed the floor to dry completely overnight. Upon my return to the property the next day, I used the fourth pad, which uses a Very Fine grit is to give the stone a high shine finish. The floor was then ready to be sealed with Tile Doctor Ultra Seal, which is a premium, natural look, impregnating sealer designed to provide maximum stain protection. This was allowed to dry for an hour, before I then re-polished the tiles to remove any excess sealer and to refine the finish the absolute best quality possible. The benefit of the burnishing pad system is that no chemicals are used (just a small amount of water for lubricant) so it is environmentally-friendly. 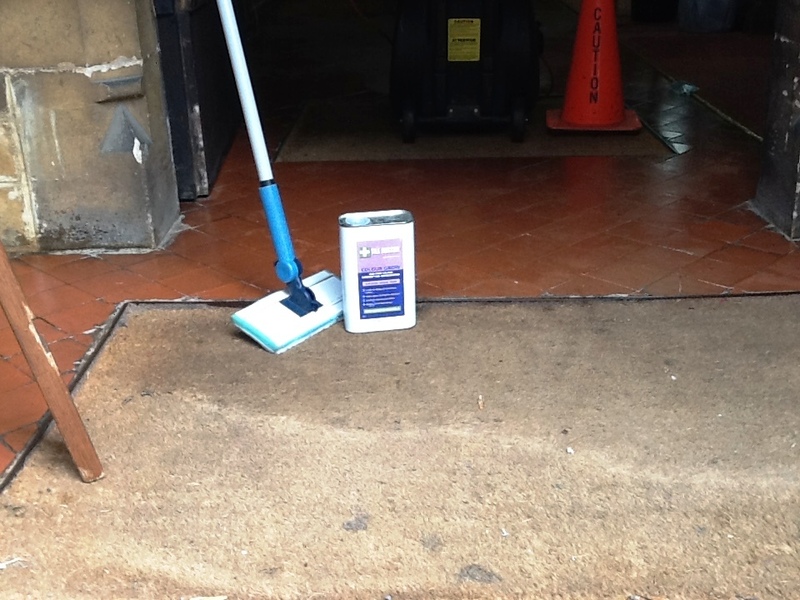 I recommend the customer to use Tile Doctor Neutral Cleaner in the future to provide quick and effective maintenance. She was very pleased with the results and now she will be well-equipped to keep the floor in fantastic shape. 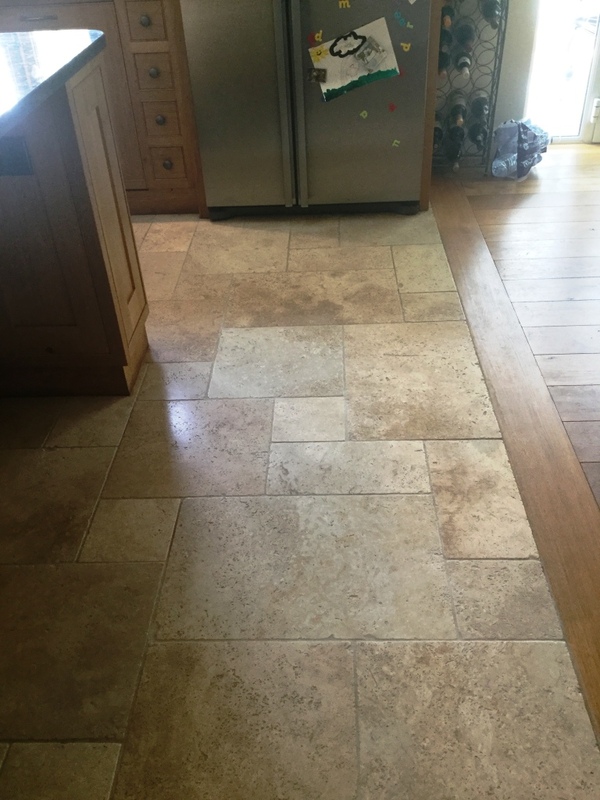 The following pictures show the amazing results that can be achieved with a badly stained and pitted Travertine floor. 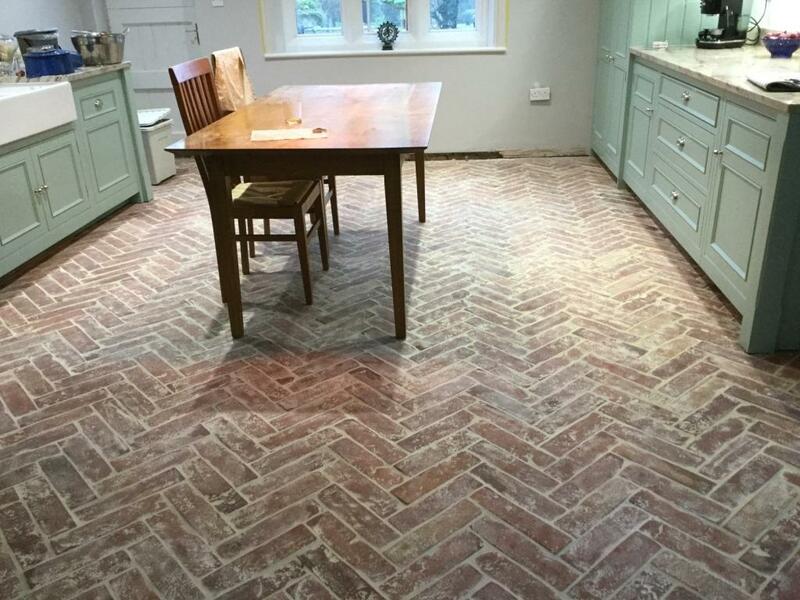 Covering an area of approximately 40m2 the tiles had been laid four years earlier in the Kitchen and Hallway of a house in Helmdon Village. The sealer had since worn off and dirt had become ground into the pores of the stone making it very difficult to clean effectively. Travertine does look amazing but does need to be sealed to keep it looking that way. The first few photos show the floor before any cleaning was undertaken and the customers kitchen units which we had wrapped to protect against any splashing. We always take great carewhen working in peoples homes to avoid any damage and we advise that as much furniture as possible is removed from the area to be cleaned. In this case the client was unable to move the large table as they had nowhere to store it fortunately we carry specialist furniture sliders to allow us to move furniture backwards and forwards during cleaning so were able to work around it. The floor was cleaned using a combination of Tile Doctor Burnishing Pads and Tile Doctor Pro-Clean with a stiff brush to clean out embedded soil in the tile pits and grout lines, I also carried out some repairs to missing grout along the edges and around the oak beams to match the existing colours. The Burnishing pads are applied individually to each tile in sequence starting with acoarse pad and finishing withthe fine pad. The floor is rinsed in-between each pad and the resulting residue extracted from the floor using a wet vacuum. The pads are encrusted with diamonds and are ideal for bringing back the finish of stone surfaces like Travertine. The picture above should give you an idea of the machinery required to achieve professional results. Before leaving for the day the floor was given a final rinse with water and as much water and moisture as possible was extracted from the floor using the wet vacuum. When we returned the next day the floor had dried and we were able to apply the sealer. 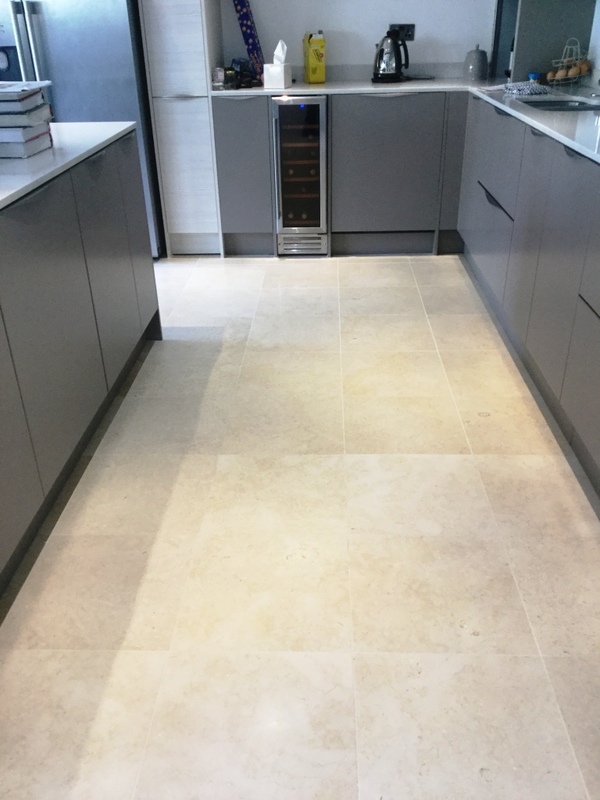 On this occasion we used Tile Doctor Colour Grow was applied to both the Travertine tiles and the grout lines, not only will this protect both the tile and grout from staining Colour Grow also enhances the natural colour and beauty of the stone. The owner of the property was very happy with the result and left the following comment on the Tile Doctor feedback system, I always appreciate it when clients take the trouble to do that. Finedon is a small civil parish in Northamptonshire with a big history. At the time the Domesday Book was complete in the late 11th century, the town was, in fact, a large royal manor held by the wife of Edward the Confessor. In subsequent centuries the town has experienced a rich history and many of the current houses were built during the Victorian period (1837-1901). 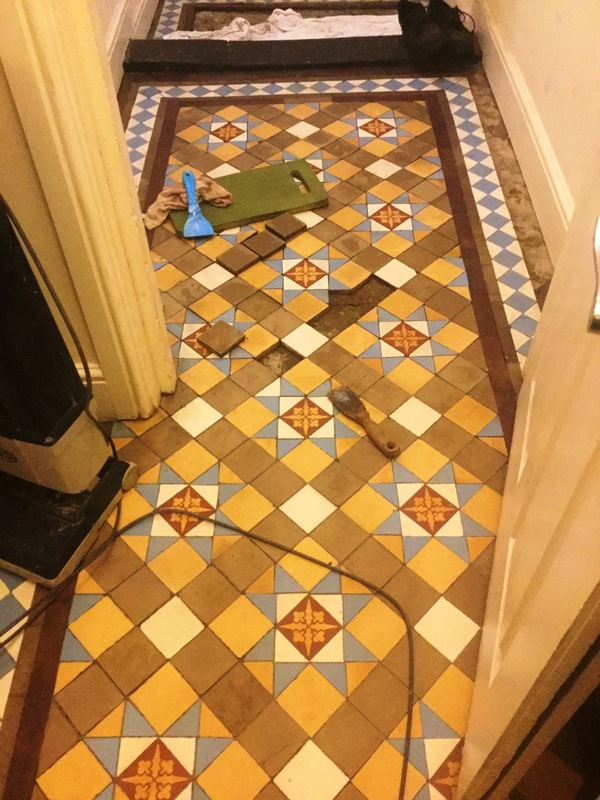 It came as little surprise to me, then, to get a call from a customer in the town who had recently found an original Victorian tiled floor underneath the carpet in her house. 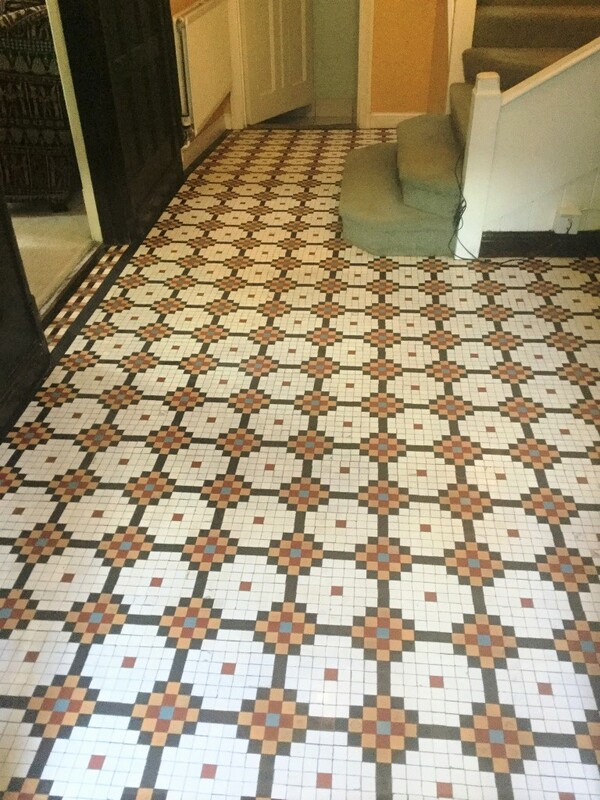 The tiles were well over a century old. They had been covered by carpet for several years at least, and once unearthed they are clearly covered in paint and other debris from renovation work that had been carried out. Naturally, the customer was keen to restore the appearance of the tiles and so she called me, the local Tile Doctor, to get the job done. You can see from the photos above that the floor was in quite a state – it took a whole day to clean. 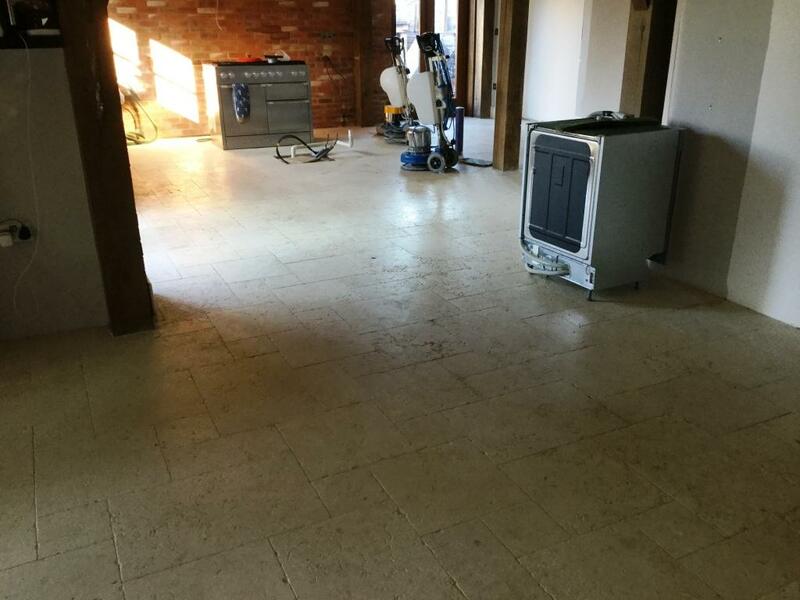 The floor area was only around eight metres squared, but it took two litres of Tile Doctor Remove and Go and three litres of Tile Doctor Pro-Clean to get it clean. Remove and Go is a very strong stripper that will just about shift any type of dirt or stain, while Tile Doctor Pro-Clean is a reliable high alkaline cleaner both products are designed for use on natural stone. Once all the dirt, stains and paint splashes were removed, I washed down the floor with fresh water to neutralise the chemicals. I then installed some equipment to assist the drying process overnight, allowing the tiles to be sealed the next day. There were also some cracks and missing grout that I replaced, along with some several loose tiles that I refitted. I returned to the property the next day to seal the floor. 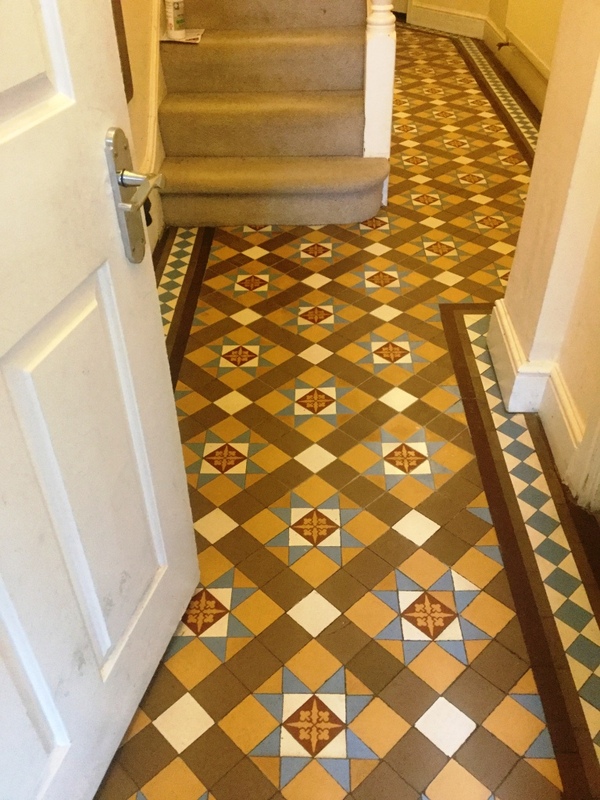 To do this I used two coats of Tile Doctor Colour Grow, which provides robust protection and the quality matte finish the customer had requested. As the name suggests, it also enhances the natural colours in the tiles, restoring character to this original feature. For a more traditional look, one litre of sealer was sufficient. Looking at the photos, you can see the huge improvement made over two days of work. One hundred years of wear and tear alleviated in 48 hours! The customer was thrilled. 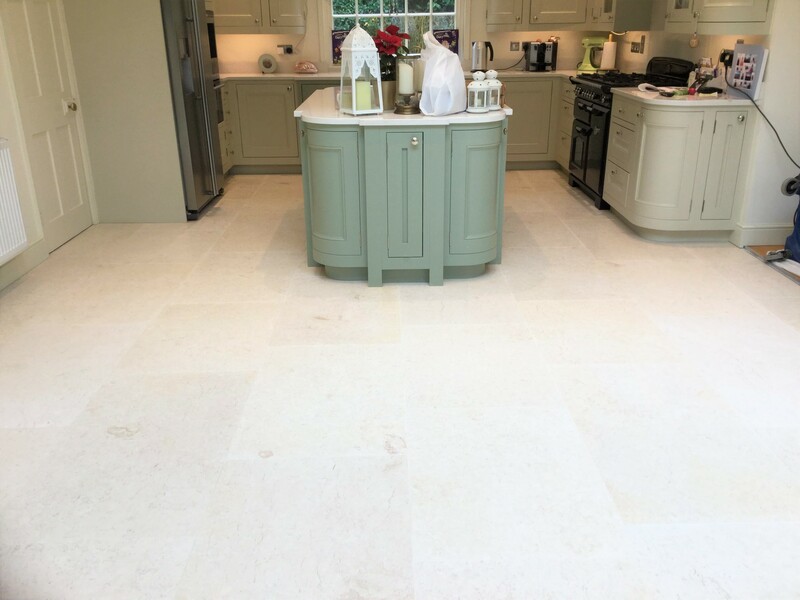 Travertine is a highly coveted and popular choice for tiled floors – and it’s easy to see why. At peak condition, it’s one of the most beautiful and eye-catching types of tile that is available. However, the appearance of the stone tends to suffer heavily from a natural process of corrosion know as pitting, which results in small holes developing that easily fill up with dirt and muck over time. This ingrained dirt is particularly difficult to remove with domestic, supermarket-quality cleaning products. 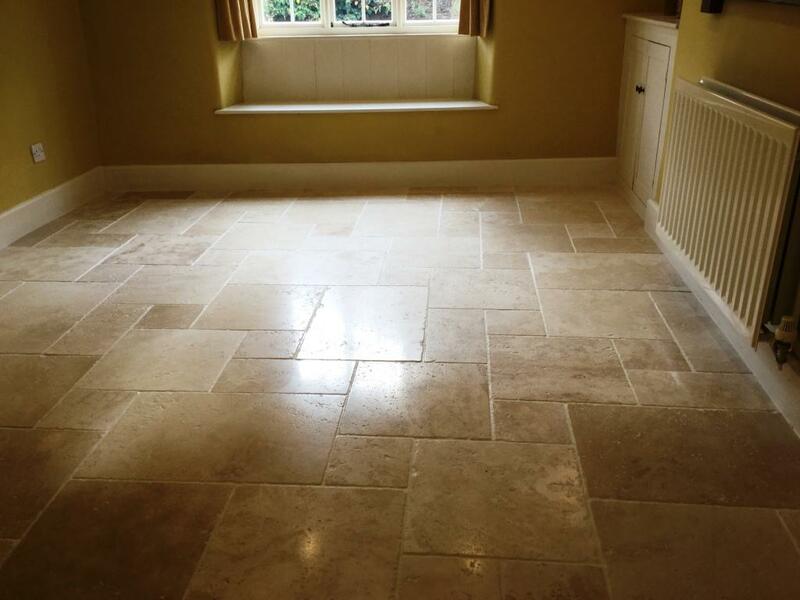 This customer, who lives in Staverton, near Daventry in Northamptonshire, was very concerned that his Travertine tiled floor had lost its former lustre and shine due to pitting issues, continued foot traffic, and the fact that the sealant has lost its performance over the last few years and hadn’t been topped up. Dirt had therefore been allowed to penetrate both the grout and stone making it look dull and uninviting. A quote was issued and accepted to restore the floor to its former glory. It was agreed the work would best be carried out whilst the customer was away on a short break with his family. I decided the best course of action to bring the floor back to its former glory would be to hone and polish the stone with Tile Doctor diamond encrusted burnishing pads. Our burnishing process involves removal of a very thin layer of the top surface of the stone using four pads of different grits. The first pad has a Coarse 400 grit. It is attached to a rotary machine and, with only water for lubrication, removes minor scratches, sealers, and the top surface dirt. Working in small areas of four-six square metres each, I applied the pad across the the entire floor, rinsing in between eras and picking up the soiled solution with a wet-vac machine. I then repeated this same procedure with the second pad, which is a Medium 800 grit pad used to remove dirt from minor scratches and holes in the stone. Next, I mixed up some Tile Doctor Pro Clean and sprayed it on the grout lines, which were only lightly soiled, and used hand brushes to clean them. The next burnishing pad I used had a Fine 1500 grit, which is used to start the polishing process. Following the application of the first three pads, I stopped to allow the area to dry overnight. To get the best results with burnishing, it is best that the tiles are dry as otherwise you won’t achieve the highest level of shine possible. Returning the following day, I proceeded to apply the final Very Fine 3000 grit burnishing pad to achieve a very high quality polished finish. Once the burnishing process was completed, I applied two coats of Tile Doctor Ultra Seal to seal the tiles. Ultra Seal is a no-sheen, natural look impregnating sealer designed to provide maximum protection against dirt and stains. The second coat was allowed to dry for an hour before I re-polished the entire floor with a very fine 3000 grit pad to refine the polish even further. The fantastic results can be seen in the photos below. 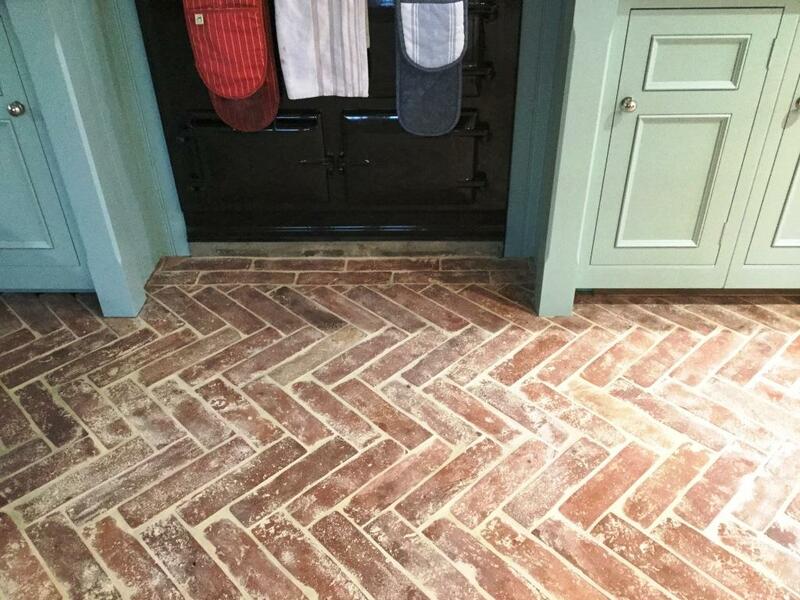 This newly installed Herringbone-style Terracotta tiled floor in a refurbished kitchen was heavily covered with patches of grout haze. The customer, who lives in the town of Cogenhoe, Northampton informed me that the tiler had supposedly sealed the floor before grouting. If this was true, the grout haze should have been very easy to remove. However, the tiler had clearly not been entirely truthful as, when I arrived at the property to carry out a test clean, I found very little evidence of any sealer whatsoever. Nonetheless, I found that the grout haze was easily removed using a solution of Tile Doctor Grout Clean Up, a concentrated phosphoric acid cleaner which is designed specifically for the removal of haze, mineral deposits and efflorescence. 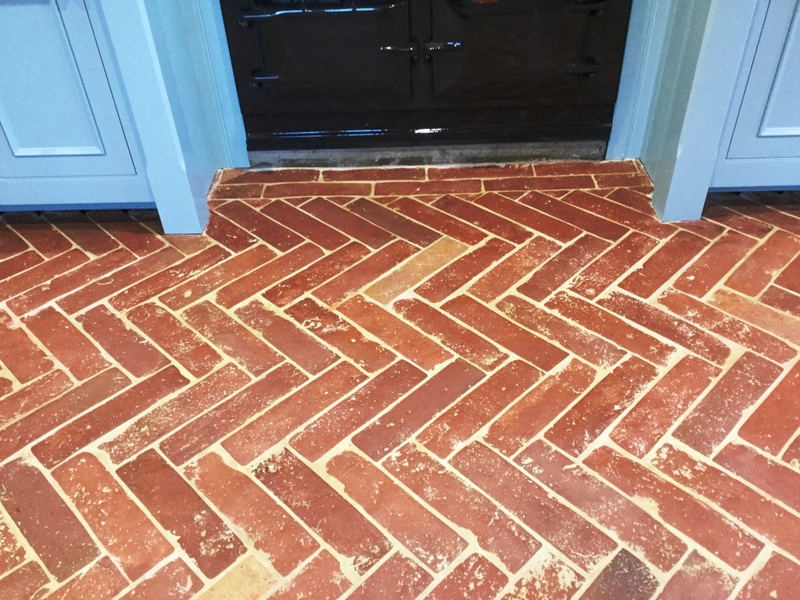 These Terracotta tiles were very pitted and the original tiler was correct to fill the small holes with grout to complement the rustic look of the tiles, but he should have taken the correct measures to ensure that a white misty grout haze didn’t appear over the whole area! The customer was happy for me to proceed with restoring the floor, but also very concerned that her newly installed hand painted kitchen units would be damaged by the chemical cleaning products. I assured her that I would cover them up completely and carry out all work along the plinths by hand. Once on site, I covered the kitchen units to protect them and proceeded to mix up a solution of Grout Clean Up. This was applied firstly around the edges of the floor and scrubbed into the stone by hand using a stiff brush. Working in areas of four square metres each so as to not the leave the product on the floor too long, I applied the solution to pre-wet the floor ready for the next part of the process. This was to apply Tile Doctor Acid Gel, our blend of phosphoric and hydrochloric acids, leave it to dwell for a few minutes has then agitate it to neutralise and remove the copious grout haze. Once each area had been treated I rinsed it with water to remove any chemicals. 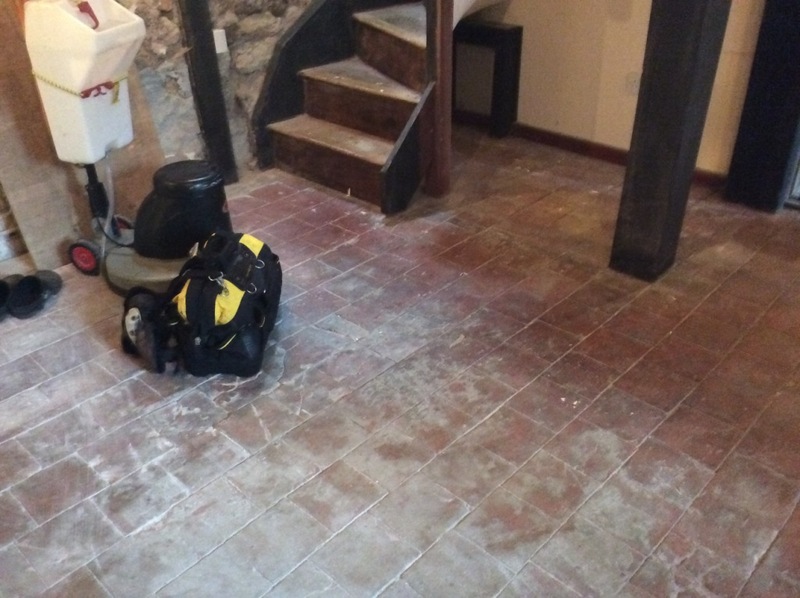 With the entire floor treated, I installed a dehumidifier to help the tiles to dry quickly overnight. 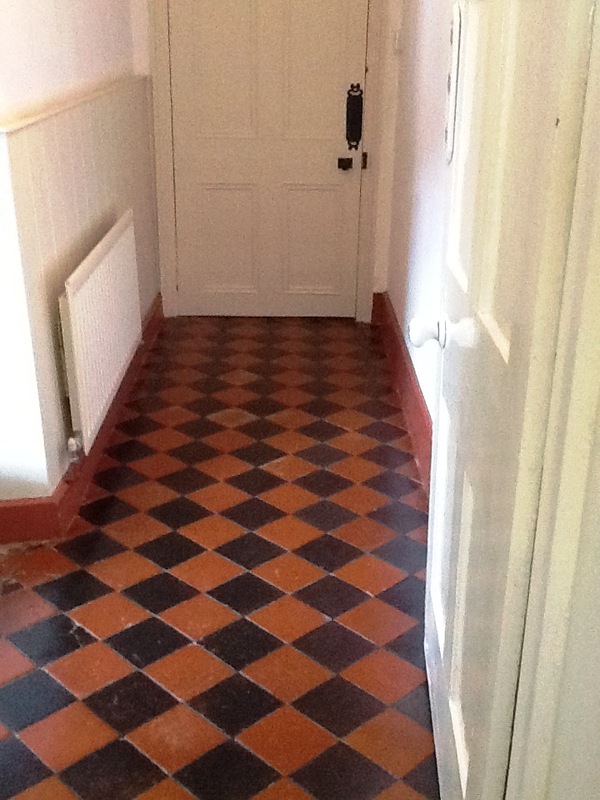 The next day I returned to the property to apply two coats of Tile Doctor Colour Grow sealer. This is an impregnating sealer which provides robust protection while also lifting the natural shades in the Terracotta. Each coat was polished in by hand, leaving an hour for drying between coats. I then waited another hour before giving the whole floor a final polish with a buffing machine to remove any excess sealant. The result achieved in the space of 24 hours was fantastic and the customer was exceptionally pleased. Despite the severity of the grout haze problem, the combination of the right products allowed me to handily resolve it. 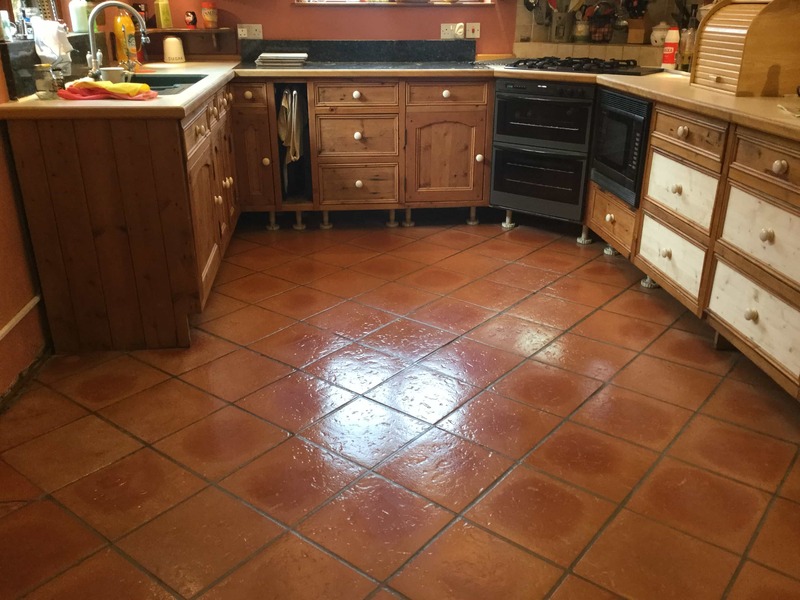 The addition of a properly applied and top quality sealer will help to ensure the floor is protected from staining, something which is essential in a kitchen. 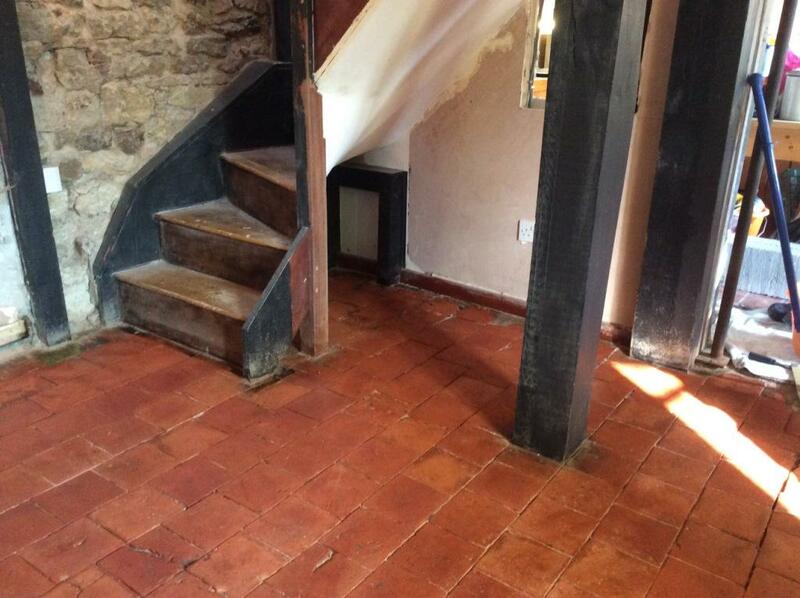 It’s not every day that I get to work on a 350-year old property, however, not too long I was contacted by a client who was in the process of renovating one in the village of Ringstead, complete with an original Quarry tiled floor. 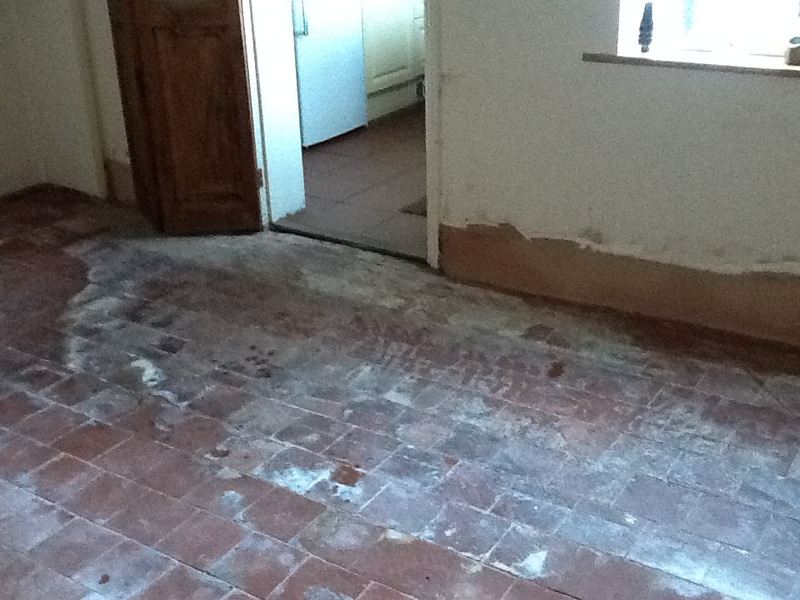 After removing the old flooring in the property, the client had discovered a broken-up screed of concrete covering the original tiles, the remnants of which can be seen in the photos below. 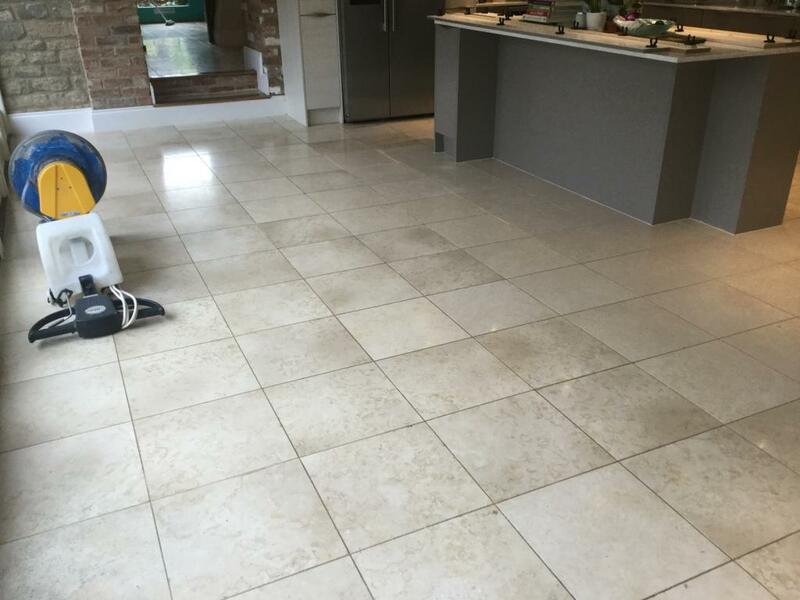 He proceeded to manually scrape the screed off over the course of several days – successfully removing about 60 per cent of it – but found there to be many stubborn areas and instances where the tiles were badly cracked and would need replacing. 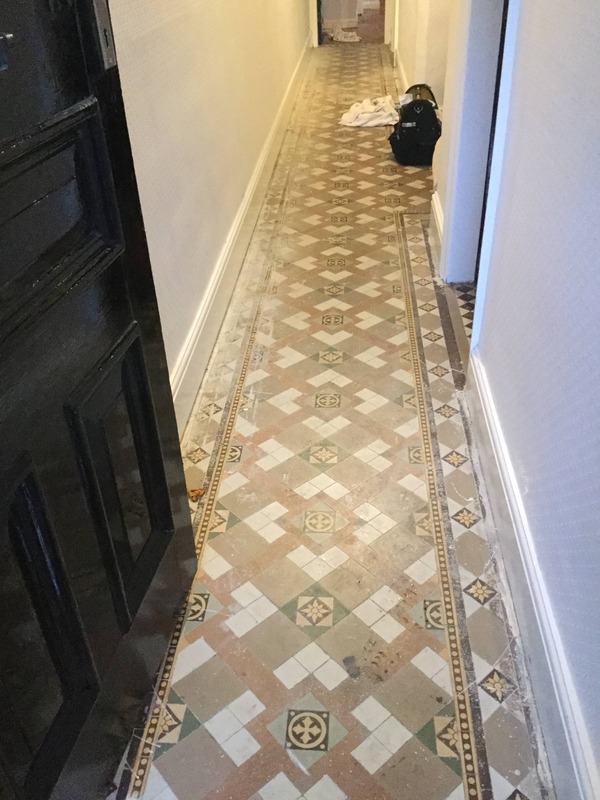 As a passionate renovator, the client treats restoring old properties as a labour of love, and only recruits professional help when he really needs it, so it was a real compliment to be consulted to see if the floor was salvageable. I’ve worked on floors in an equally bad state before so I was confident it could be restored, I provided a quote which was accepted and a date was agreed to start the work. 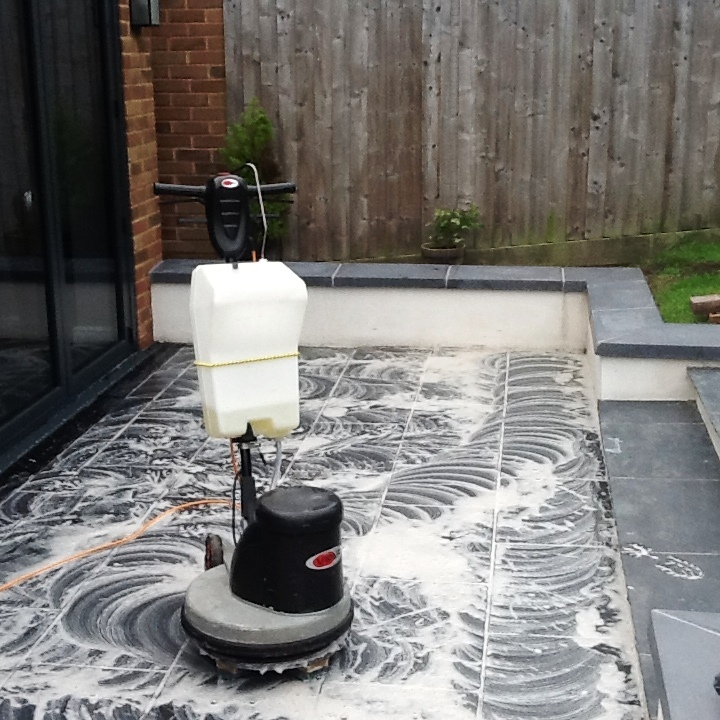 Upon arriving at the property, my first course of action was to run my rotary machine, fitted with a dry concrete cleaning brush, over the entire area to remove dust and etch the area to allow the cleaning products to permeate the surface of the screed. I then vacuumed the area thoroughly before applying Tile Doctor Acid Gel across the entire area. Acid Gel is a blend of phosphoric and hydrochloric acids in gel form which helps to remove inherent grout haze, efflorescence and other stubborn staining. The product was left to dwell for 20 minutes, before I repeated the action with the concrete cleaning brush to work the product into the tiles. Acid Gel was left on for a further 10 minutes and agitated with handheld brushes to clean the stone. Following this, the resulting cleaning slurry was removed with a wet-vac machine. To complete the cleaning process, I used a long handled scraper to score along the top of the remaining concrete and break it down by applying Tile Doctor Grout Clean Up, which is essentially the liquid version of Acid Gel. I carried out this action twice to ensure the removal of all the concrete. 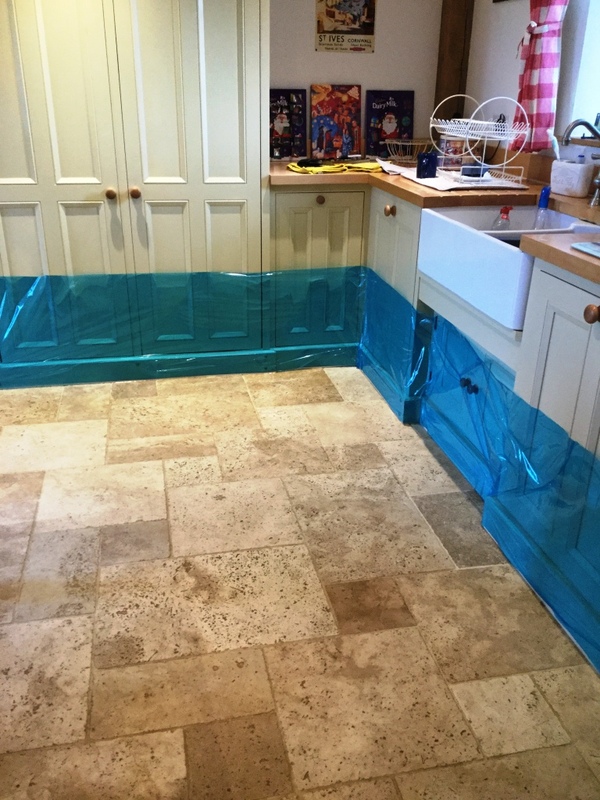 The floor was then allowed to dry for 4 days; properties of this age have no damp proof membrane to the this provided time to allow excess moisture to evaporate following the cleaning. Returning to the property, I ran some quick deal tests to check that the Quarry tiles were ready to sealed. 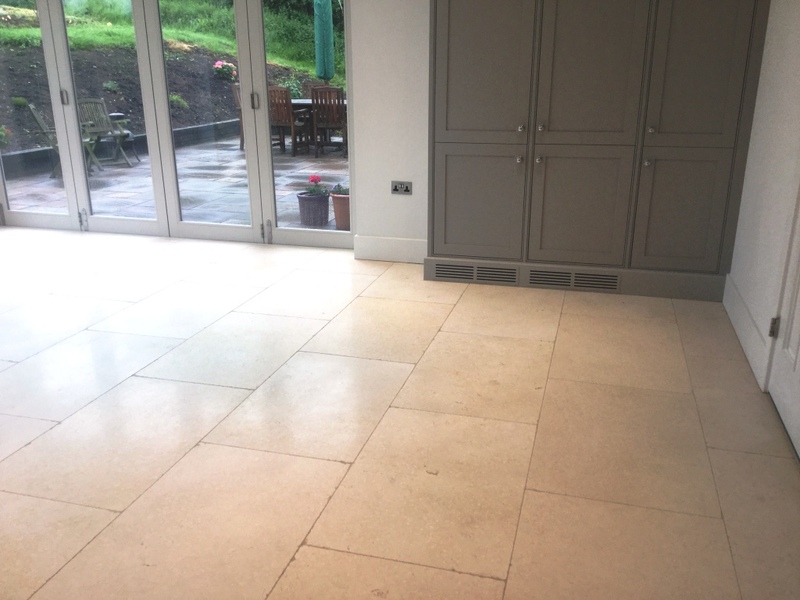 Once I was satisfied with the condition of the floor I proceeded to apply two coats of Tile Doctor Colour Grow, our impregnating, breathable sealant which offers provides robust protection and enhances the natural reddish shades in the Quarry. The client was very pleased with the results. Our work has helped him massively along the way to the complete renovation of this great property. 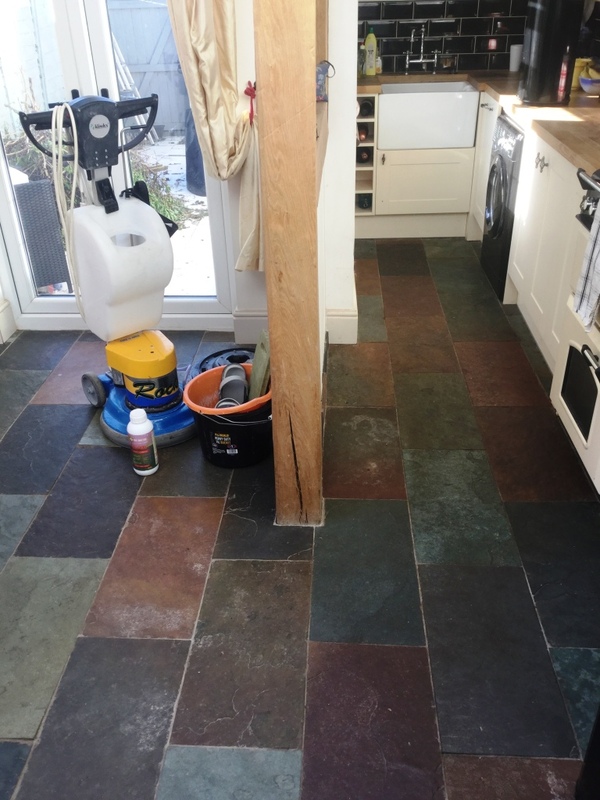 His long-term plan is to keep the Quarry tiled floor as it is, however when he encloses the area under the stairs he will use the tiles from that area to replace cracked and damaged tiles that are in the centre of the room. If more tiles he intends to source them from a reclamation yard. Lichen, moss and other plant-based staining is a common sight on patios exposed to the UK climate. For many property owners, it’s a very difficult task to keep patios looking great in the face of the natural effects of the environment. However always happy to help Tile Doctor is available to provide the professional cleaning and sealing needed on a regular basis. 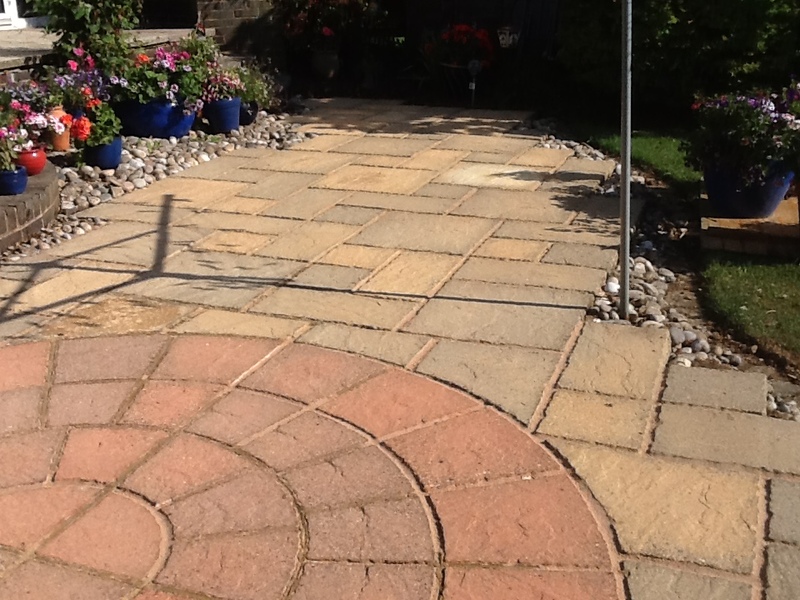 This Sandstone tiled patio in Rushden was certainly a prime candidate for restoration. Not only was it completely covered in lichen and moss, but it was also cracked in parts and missing grout. 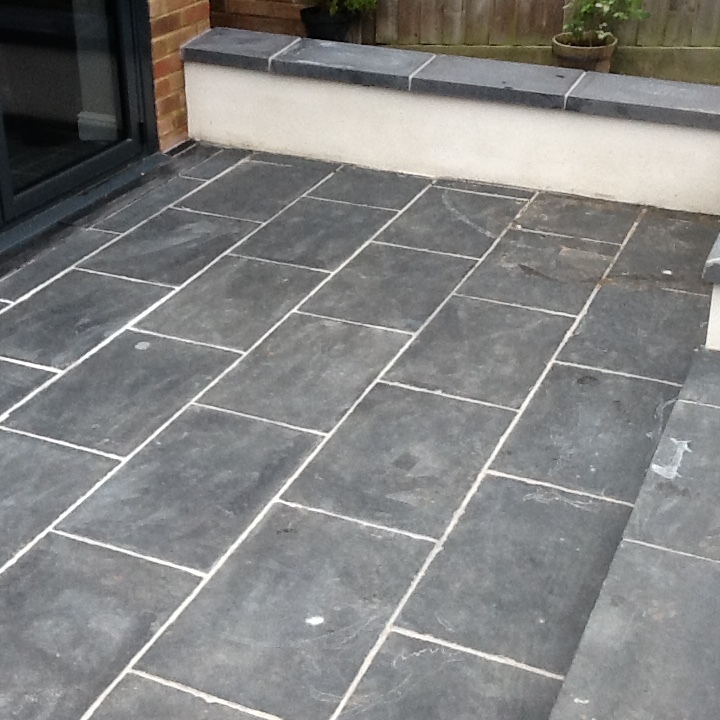 The patio would therefore need not only cleaning and sealing, but also re-grouting. To begin the restoration, I opted to power jet wash the entire area to remove as much of the initial layers of moss. Then, I mixed a strong dilution of Tile Doctor Pro Clean, which is a powerful and reliable alkaline cleaner suitable for use on both internal and external natural stone tiles. This was applied liberally to the patio and scrubbed into the stone to cut through the particularly stubborn stains. The two photos below show the fantastic result. After completing the cleaning phase, I allowed the patio to dry completely overnight before returning to re-grout the entire area with mortar. To finish off I applied a fresh sealer in the form of Tile Doctor Seal and Go Extra, which an acrylic-based, fully breathable sealer appropriate for outside use. The below pictures show the final result. As you can see, it was a complete transformation – and my very happy customer will agree! With the right products and methods, it’s possible to bring new life back to weathered patios. 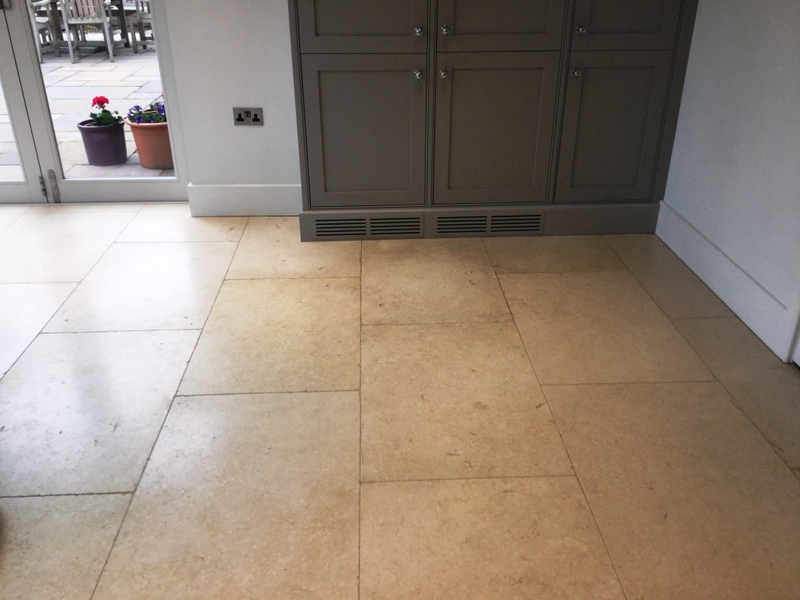 Although at first glance this Travertine tiled floor in Oundle appeared to be in decent condition, upon closer inspection however it became very clear that it was suffering from significant pitting issues and had become very dull for a polished stone. While they can’t necessarily be seen in the photographs, the floor had hundreds of small holes across the entire area, along with a few hairline settlement cracks in a few particular tiles. 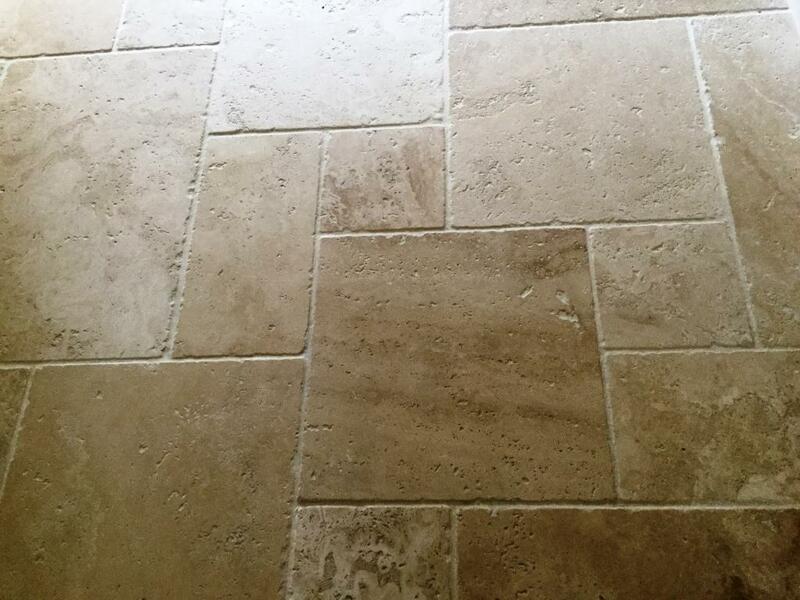 It is natural for Travertine to become pitted and for small holes to appear over time. 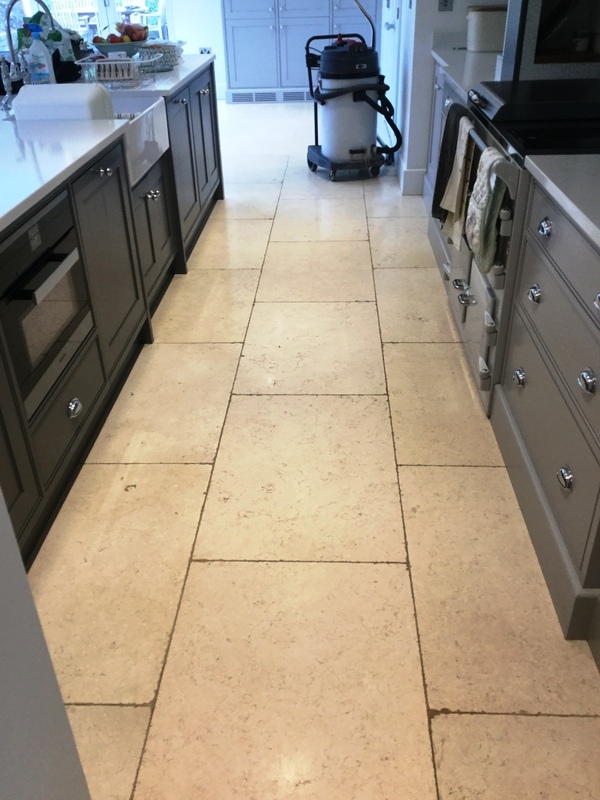 To give the stone a smooth appearance these holes are filled at the factory; however, in high traffic areas such as kitchens and living rooms these fillers pop out and the holes quickly fill with dirt and grime, making the floor grubby and difficult to clean. 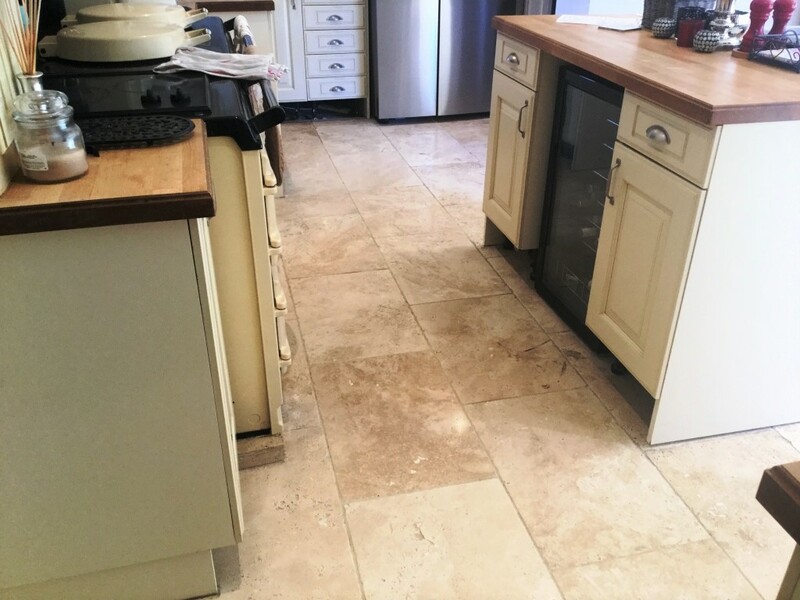 Needless to say the property owner was keen to have the Travertine restored as quickly as possible to avoid the situation becoming worse. 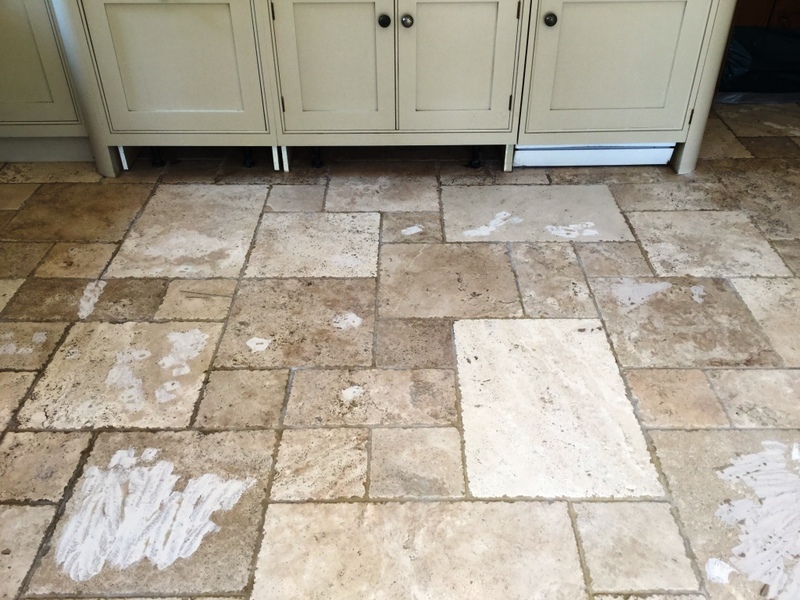 To begin the restoration, I needed to clean the whole floor to remove the dirt and muck that had become ingrained in the Travertine. 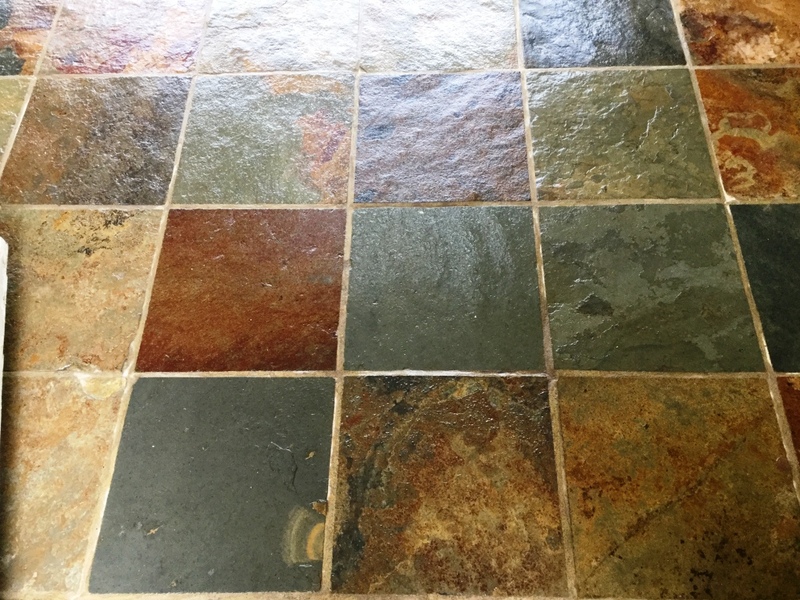 I did this using our reliable high alkaline cleaner known as Tile Doctor Pro Clean, which I applied liberally and worked into the stone using the Tile Doctor diamond burnishing pad system, paying special attention to the grout lines. There are four pads in the system and each burnishing pad is fitted to a rotary machine and ran across the floor in sequence starting with the coarse pad and finishing with the fine pad using a little water to help lubricate. Before applying the final polishing pad, I went round on my hands and knees and filled all the holes and cracks with an appropriate colour filler which did take some time to complete. After allowing the new filler to dry overnight, I returned to the property to polish off any excess by hand with a cloth. Following this, I gave the tiles a final polish with the Very Fine diamond encrusted burnishing pad which gave the floor a uniform polished finish. To protect the floor in the future the last step was to apply a fresh sealant in the form of Tile Doctor Colour Grow, a fanatic product for high-end tiles like Travertine, Limestone and Marble. 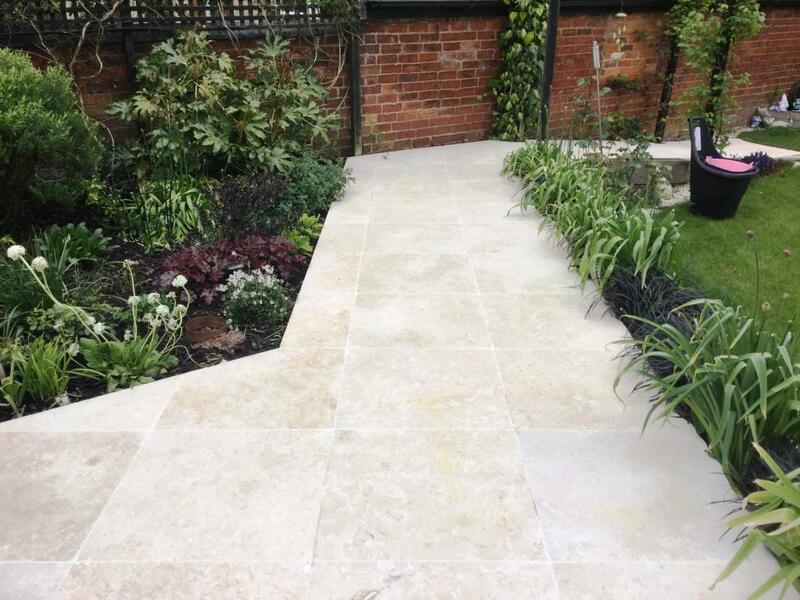 Colour Grow is a colour enhancing, impregnating sealer which fills the pores in the stone to prevent trapped dirt and also emphasises the natural colours and shades in the process. The tiles were then left to dry for two hours. I then opted to test for water repellency to check the sealant would provide adequate protection, with a successful outcome. 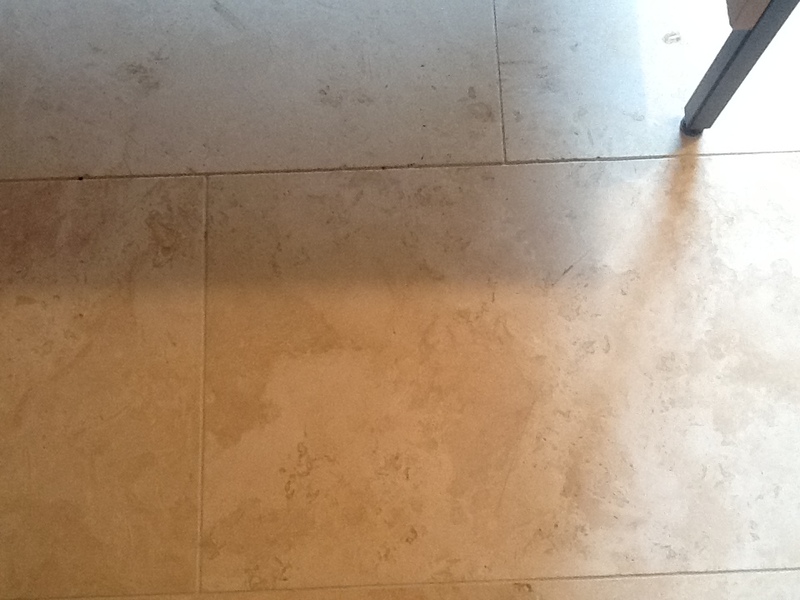 The final picture below shows the finished results: clean, well-protected Travertine tiles with improved sheen. My customer was very pleased to have the pitting problem resolved, while also having the floor deep cleaned and sealed and left the following testimonial on the Tile Doctor feedback system. 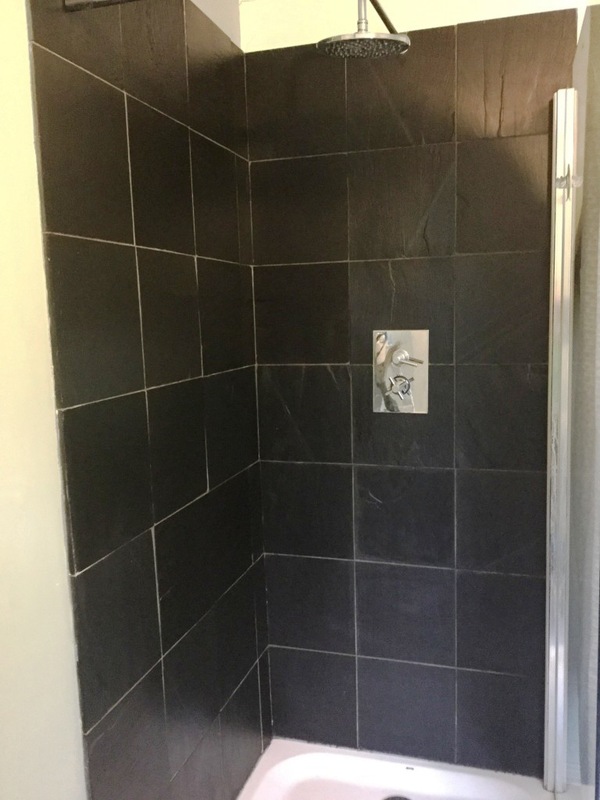 A common problem with bathroom and shower cubicle tiles is the appearance of mould on the tile, grout and silicone which if not tackled on a regular basis will spread and threaten to severely damage the appearance of the tiles, along with the silicone. This problem is usually due to inadequate ventilation however the good news is that with early intervention with Tile Doctor Mould Away spray the problem can be reversed. 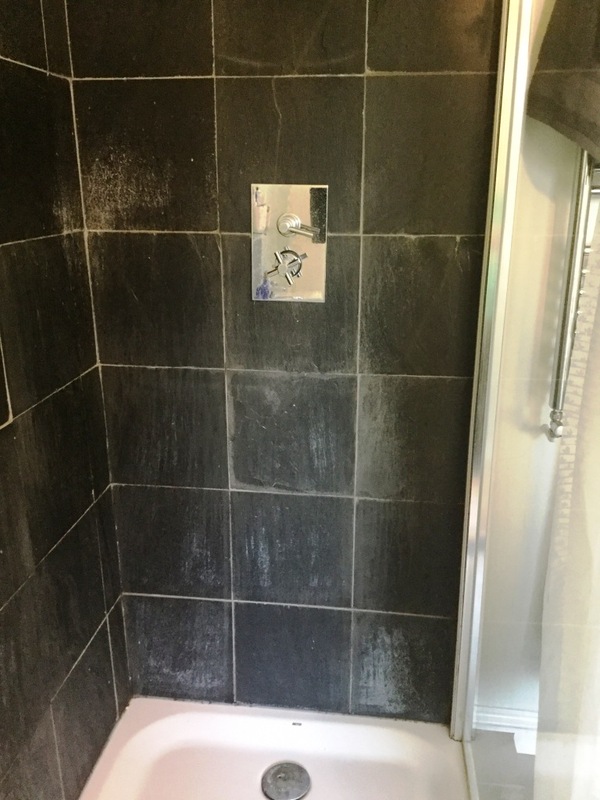 The two photos below show a bad case of this very problem at a property in Northampton, where you can see that the grout and silicone sealant had become black with mould. Firstly, I decided to cut out the damaged grout with a hand held disc cutter and remove all the silicone at the base of the shower. 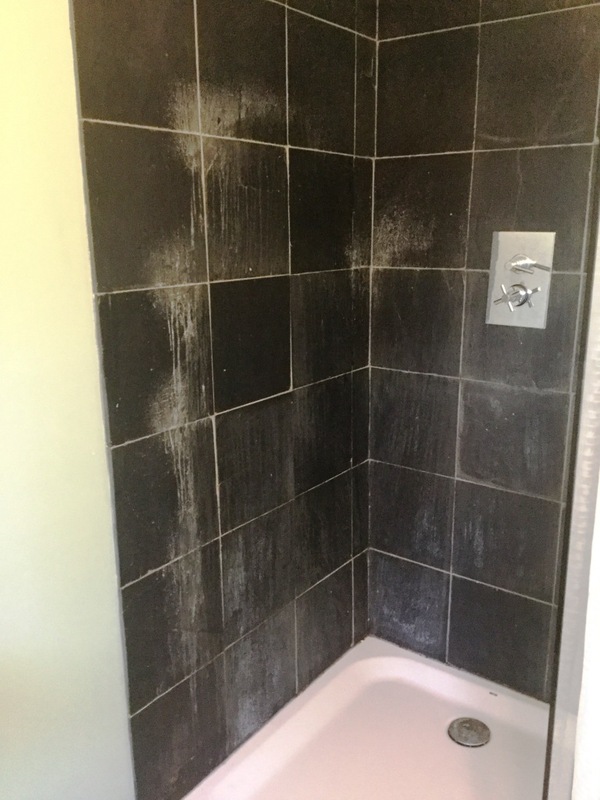 To treat the less invasive mould in the rest of the cubicle I sprayed it with Tile Doctor Mould Away, which is specifically designed to remove mould from silicone and grout. I sprayed the product onto the affected areas and left it to dwell for five minutes, before scrubbing it in with a stiff grout brush, resulting in a good clean. The area was then rinsed with plain water. Finally, I replaced the grout and the silicone that I had removed earlier with a flexible grout and a white silicone, both of which include a mould inhibitor. I left the customer with a bottle of Tile Doctor Aqua Pro to aid with regular cleaning. If used once or twice a week, this product will help maintain the condition of the grout. 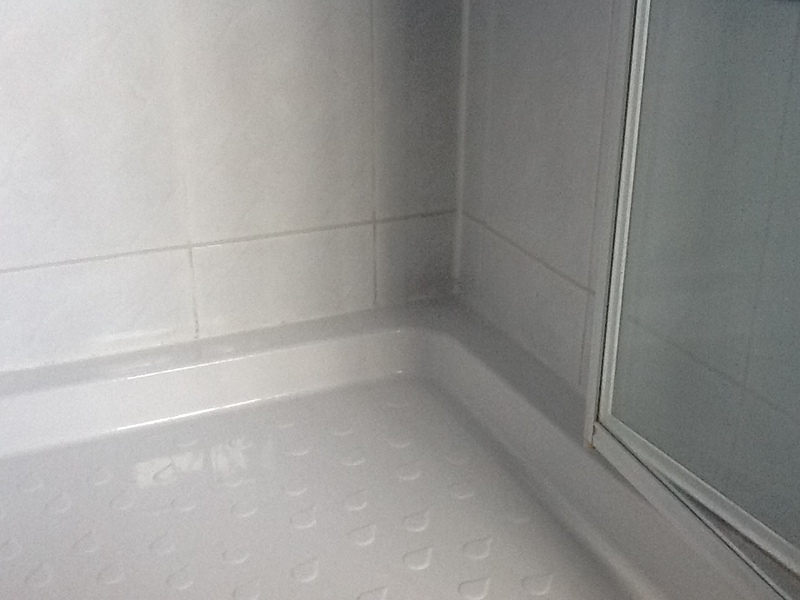 I also advised the customer that it is good practice to rinse the tiles down with plain water using the shower head after each shower to remove any soapy residue which can slowly discolour and stain grout over time. 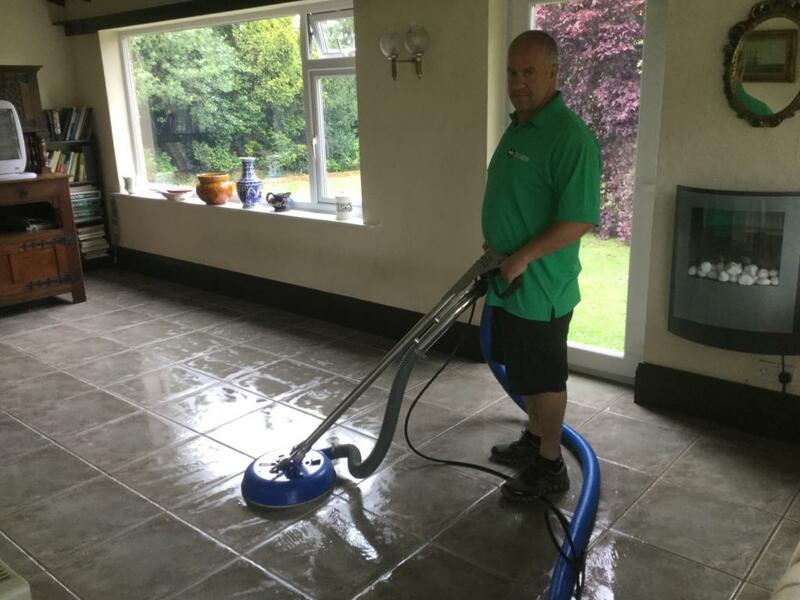 Along with internal tiled floors at residential and commercial properties, we also specialise in the cleaning, restoration and sealing of all types of external tiled floors, including patios. 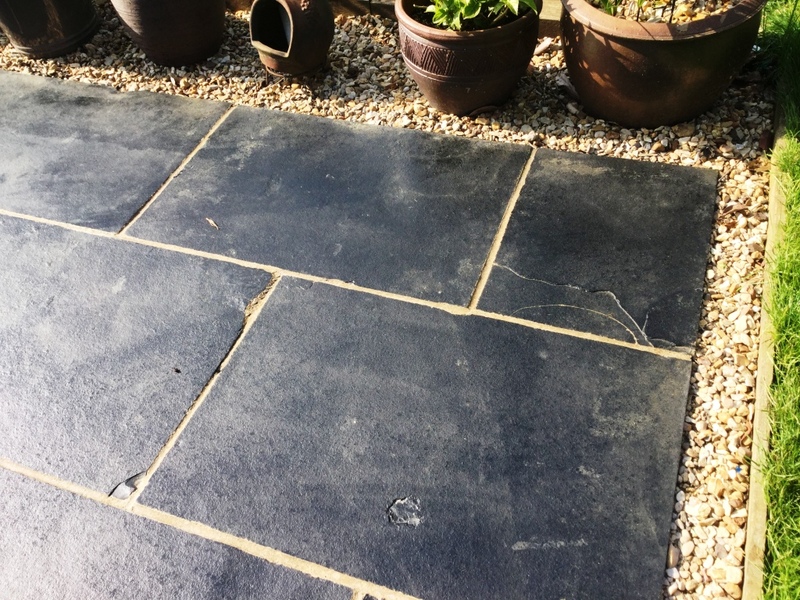 This customer, who lives in the small town of Brackley in Northamptonshire, had made the unfortunate mistake of sealing a brand new Slate tiled patio without removing the layer of grout haze smeared across the surface of the tile first. 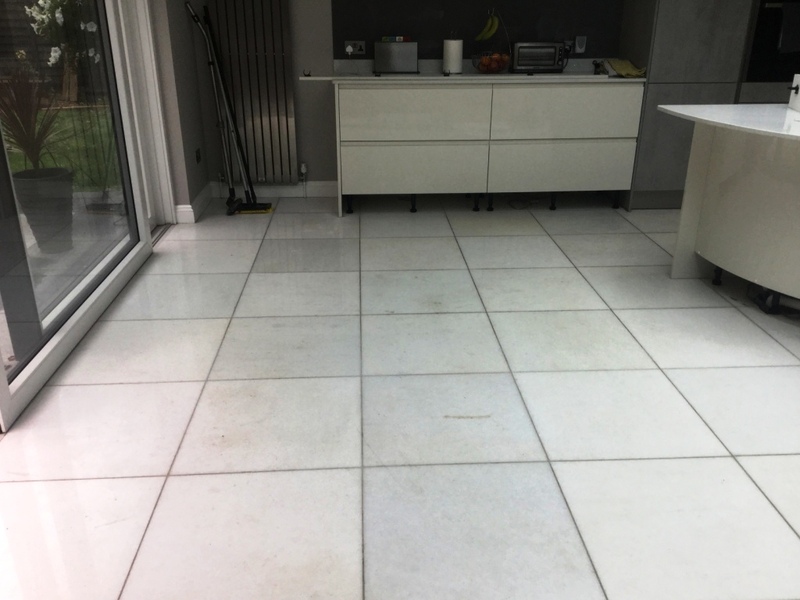 With the grout trapped between the tile and the new sealant the sealer was unable to fulfil its potential and the entire floor appeared really dull and patchy. The customer contacted me about setting the situation right. My initial course of action was to remove the new sealer using Tile Doctor Remove & Go, which is specially designed to strip away sealant, as well as adhesives and paints in cases where building and decorating works have left the tiles stained. 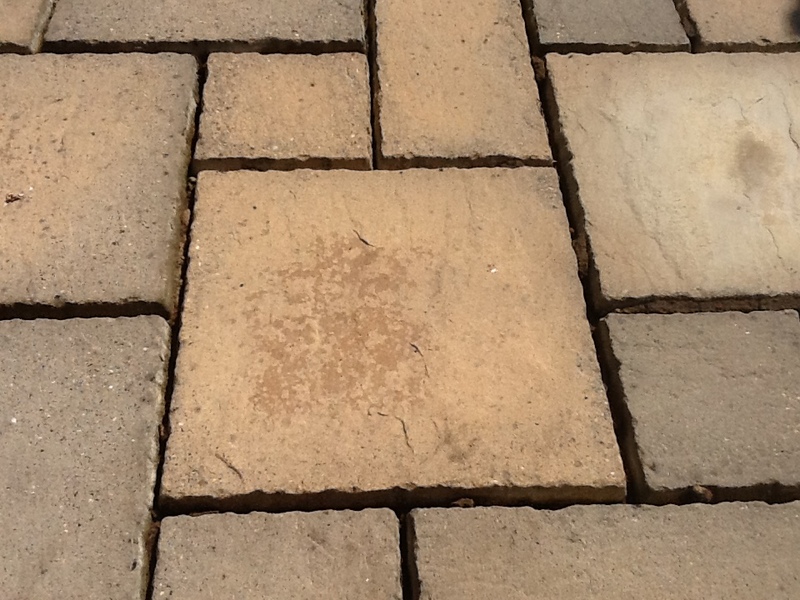 The product was applied liberally across the surface area of the patio and agitated using a rotary machine fitted with a special stripping pad. Of course, this was necessary because the grout haze could not be treated without removing the sealant first. The soiled cleaning solution was promptly soaked up using a wet-vac machine. 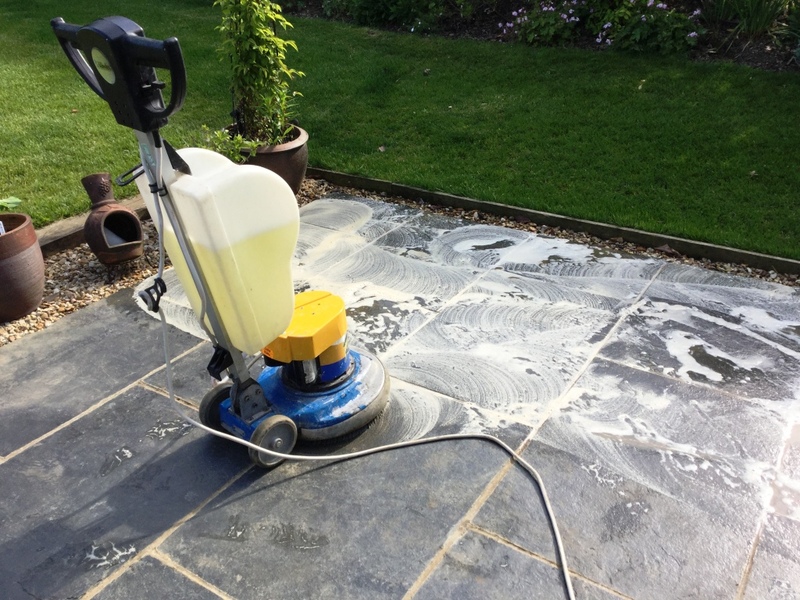 Once the tiles were exposed I applied Tile Doctor Acid Gel, which is a blend of phosphoric and hydrochloric acids in more manageable gel form, all over the patio and allowed it to dwell for ten minutes to begin neutralising the grout haze. I then added a little water and worked the product into the patio with a stiff scrubbing brush and a rotary machine to ensure all grout haze was removed from the surface of the tiles. The remaining slurry was then removed using the wet vacuum, and I rinsed the area twice with plain water to ensure all cleaning products had been removed. It was them left to dry completely. I returned to the property several days later to give the patio a fresh seal now that it was free from grout haze. First, I gave the patio a vacuum and light mop to remove any dust and debris. The customer wanted the tiles as dark as possible, therefore I suggested we use Tile Doctor Stone Oil before sealing, as this would darken the Slate significantly. Once this was agreed, I applied one coat of Stone Oil, allowed an hour for the product to dry, and then followed this applying two coats of Tile Doctor Colour Grow sealer. This is our impregnating, colour enhancing sealant which provides maximum protection against ingrained dirt and stains, as well as a durable no-sheen finish. 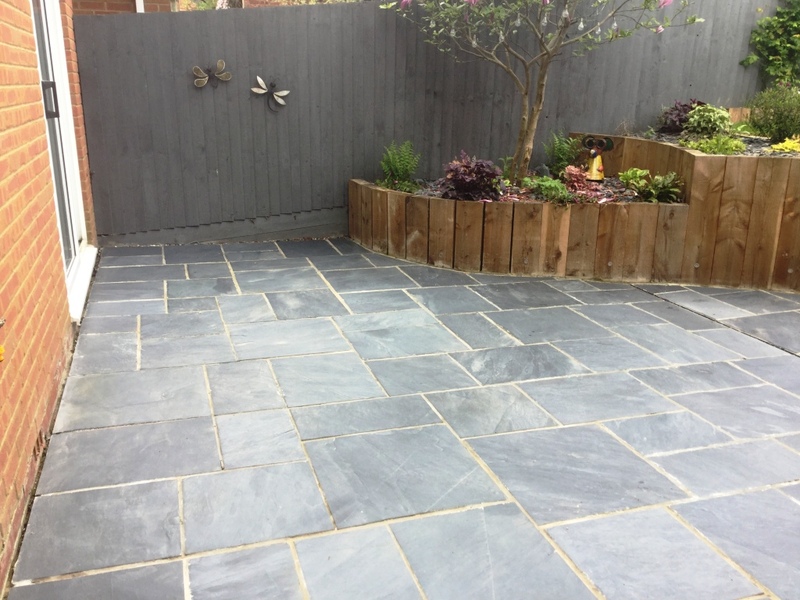 As you can see from the photographs, the Slate tiles experienced an impressive transformation. 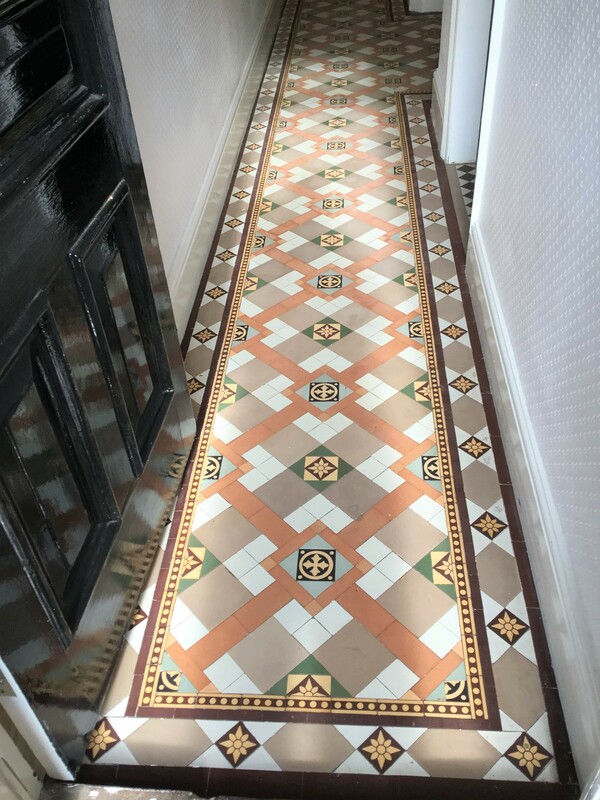 The fresh sealant, combined with the Stone Oil, really took the appearance of the tiles to a new level and, what’s more, it will be easier for the happy customer to keep it clean in the future. 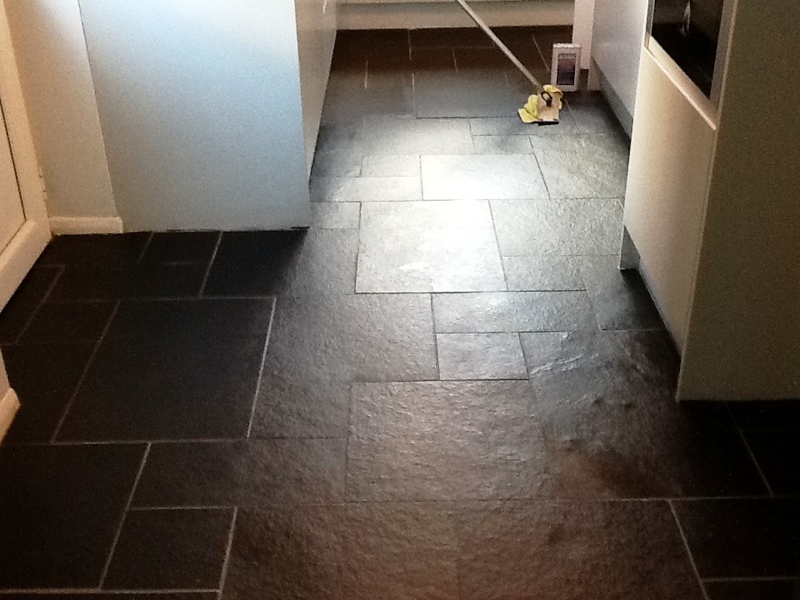 These pictures are off a brand new slate floor which the customer assumed would be much darker after she sealed it. 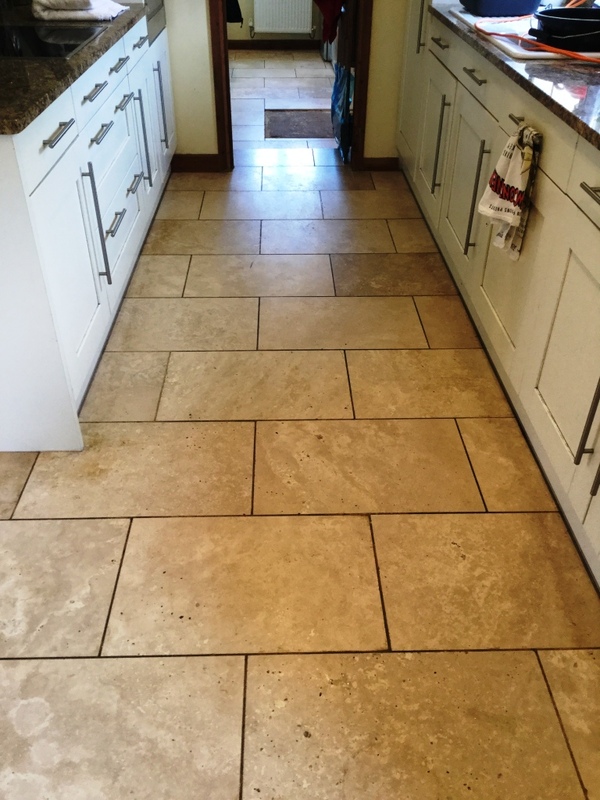 Her builder had informed her that she only needed to give them a wipe over to remove the grout haze after he had laid them which she did before sealing however she was disappointed as they came up lighter and patchy than she had envisaged from what she had seen in the shop. The colour and patchiness was down to the fact that not all the grout had been removed and was now trapped between the tile and the new sealant. To be able to remove the grout haze which was the root cause of the problem I would need to first remove the sealer. Fortunately we have a product called Tile Doctor Remove & Go which can do this so I applied it to the tiles, let is soak in for tem minutes and then scrubbed it into the Slate using a rotary machine fitted with a stripping pad. I then rinsed the floor with water and removed the soiled solution with a wet vacuum, repeating the scrubbing process where I felt it was necessary. Once this was done I could deal with the Grout Haze by giving the tiles an Acid wash using Tile Doctors new Acid Gel product which being in a gel form is much easier to control. It was applied all over the floor and allowed to dwell for ten minutes to work on the grout haze, I then added a little water and worked the product in with a stiff scrubbing brush and a rotary machine to ensure all grout was removed from the surface of the tiles; the resultant slurry was then removed using the wet vacuum again. It was important at this stage to ensure any trace of Remove and Go or Acid Gel was removed from the slate before sealing so I then gave the floor a thorough rinse with more water using the wet vacuum afterwards to remove as much moisture as possible. Before leaving for the evening I installed a fan to blow air across the surface of the tiles to assist in the drying process. I returned the following day and did a small test patch on a spare tile the customer had with a colour sealant and she wanted it darker than the sealant alone could achieve as colour enhancing sealers will only ever slightly darken the colour. 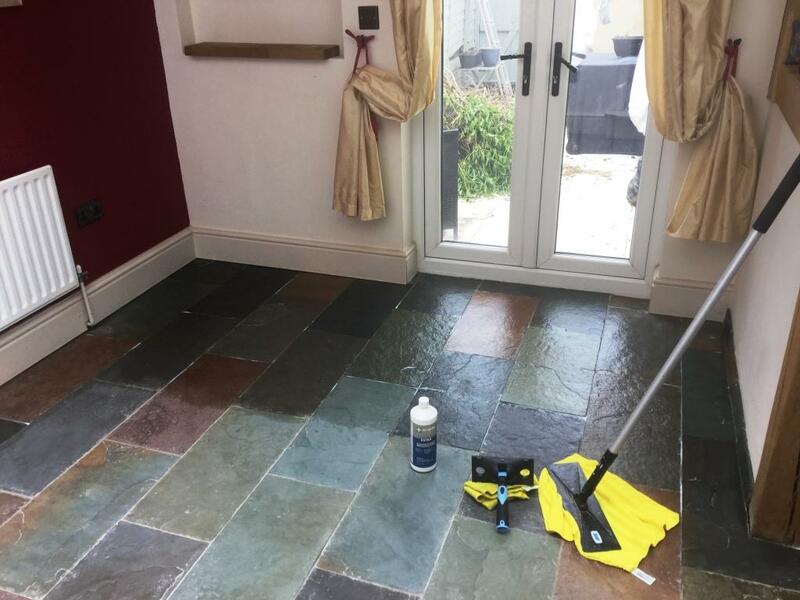 Therefore I suggested we apply Tile Doctor Stone Oil before sealing as this would darken the slate to the colour the customer was after and it works especially well on darker tiles. Once this was agreed I applied one coat of Tile Doctor Stone Oil, allowed an hour for the product to dry assisted by a fan followed by 2 coats of Tile Doctor Colour Grow to fully protect the tiles. The job took two days, the grout haze is gone and the Slate now looks how it should, my customer was very pleased and left the following message on our feedback system. Phil did an absolutely fantastic job on my black limestone tiles in my kitchen after my DIY botch job at trying to seal them. They now look like the floor I wanted to achieve when I bought those tiles in the 1st place. Thank you so much! Ms L. Whittaker. 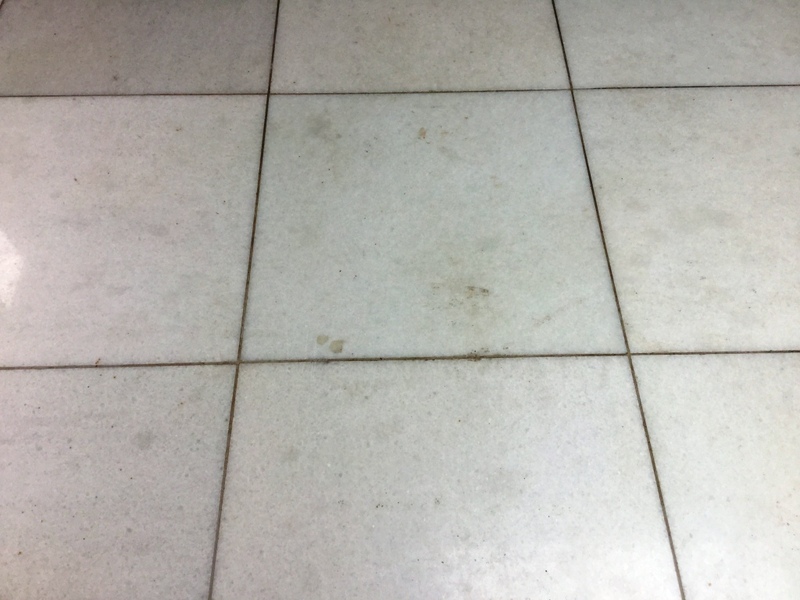 There are numerous factors that can contribute to a Quarry tiled floor looking worse for wear, including lack of sealer, dampness issues, and the wrong type of cleaning products. 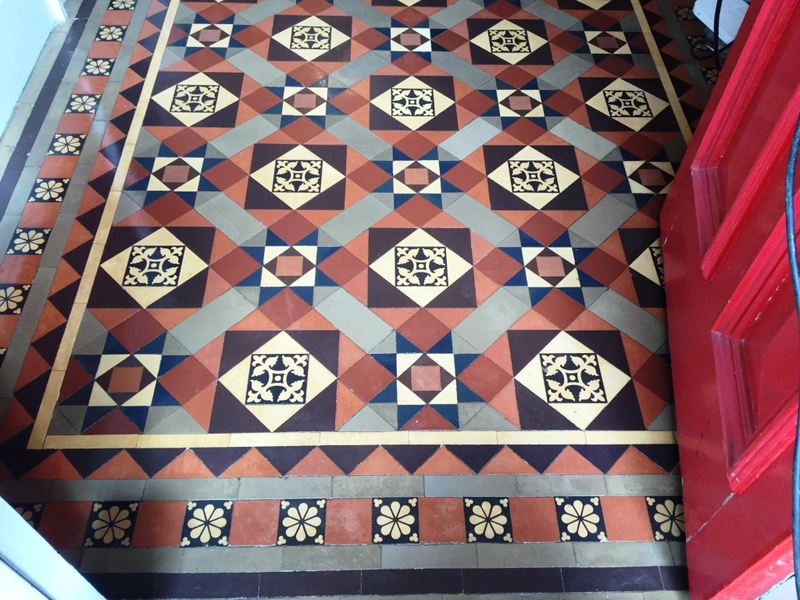 Unfortunately, this black and red Quarry tiled floor was suffering from a combination of all three: there was no sealer evident to protect against dirt and stains, and dampness in the sub-floor had caused the tiles to fade in colour and shine. The red tiles especially had faded so much that they appeared almost white. 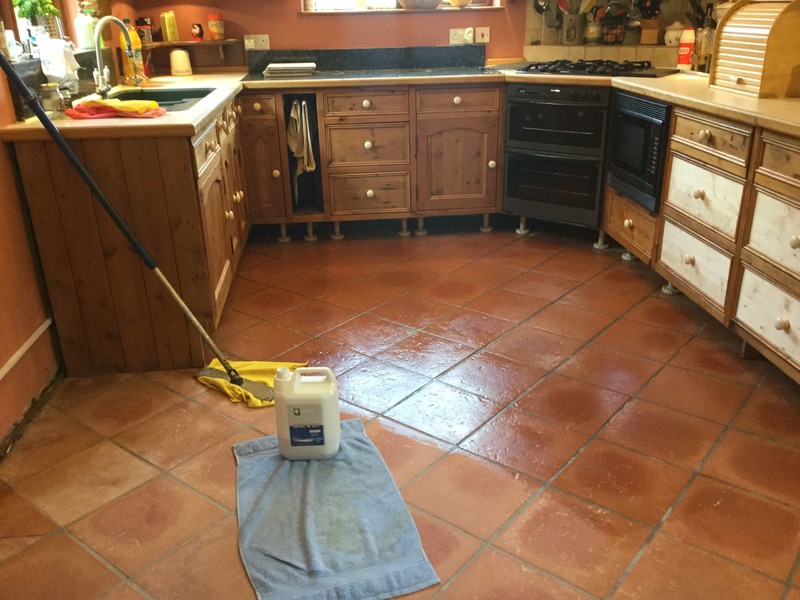 The property owner, who lives in the town of Welton, near Daventry in Northamptonshire, was desperate to have the floor professionally restored as her efforts to clean the tiles with run-of-the-mill household products had gone unrewarded. To ensure the appearance of Quarry tiles in this high traffic area of the house, I would need to provide a deep clean and a robust, impregnating seal to prevent future damage. As is the case with most types of tiled floor in this condition, I deep cleaned this floor using our powerful alkaline cleaner, stripper, degreaser, Tile Doctor Pro Clean. The cleaning method involved spreading strong dilution of Pro Clean evenly across the floor and leaving it to dwell for a short period. This allows it to seep into the tile to help lift out and dissolve ingrained dirt. I then agitated the solution with a scrubbing pad fitted to my rotary machine to ensure all layers of muck were removed, and then thoroughly rinsed the floor to remove the excess cleaning chemicals. 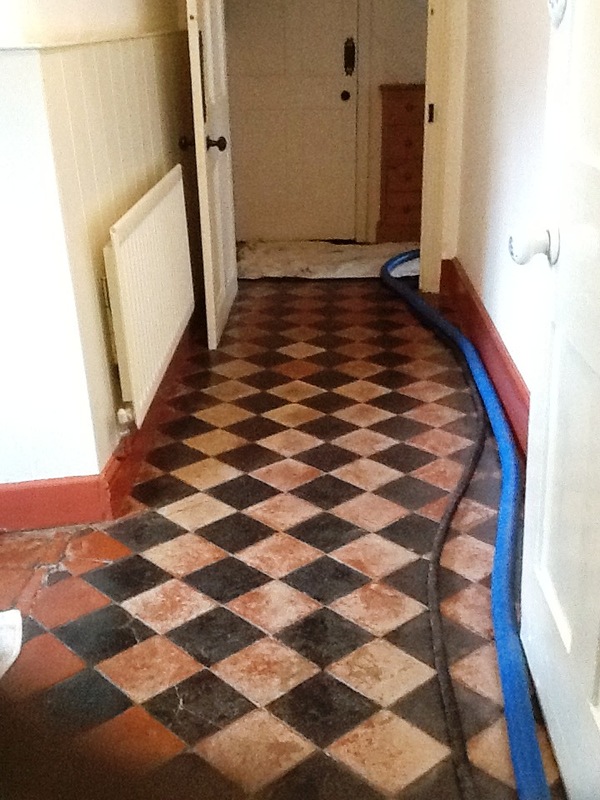 Since the floor was suffering from particularly prevalent damp issues, I left it to dry for ten days (usually 24 hours will suffice) before I returned to the property to commence the sealing process. Arriving back at the property a week and a half later, I immediately took several damp meter readings to ensure the floor was dry enough for a sealant to be applied. This is incredibly important: the slightest quantity of outstanding moisture can cloud the sealant and damage its performance. Thankfully the ten days had given the floor ample time to dry fully, and I went ahead with applying two coats of Tile Doctor’s impregnating, colour enhancing sealant called Colour Grow. As you can see from the second photo, the sealant really bought the depth of colour back to the floor, making it look very pleasing to the eye. 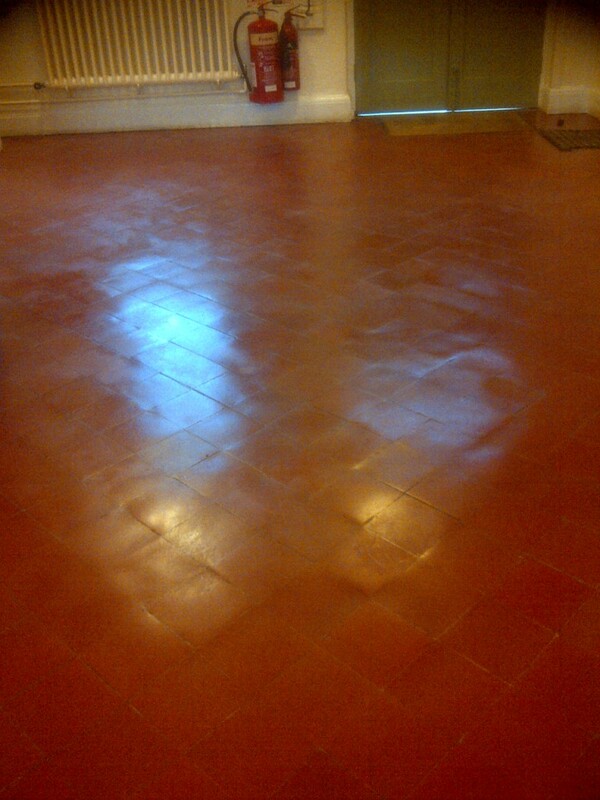 The customer was especially pleased that the red tiles actually look red again! 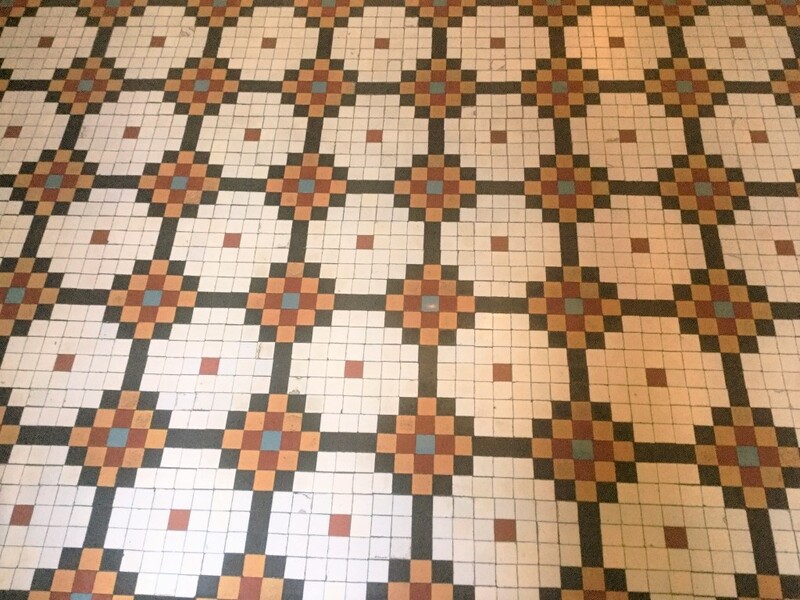 This first photo shows a classic example of a poorly maintained floor, which had faded and lost its colour due to it not being maintained or sealed for many years. 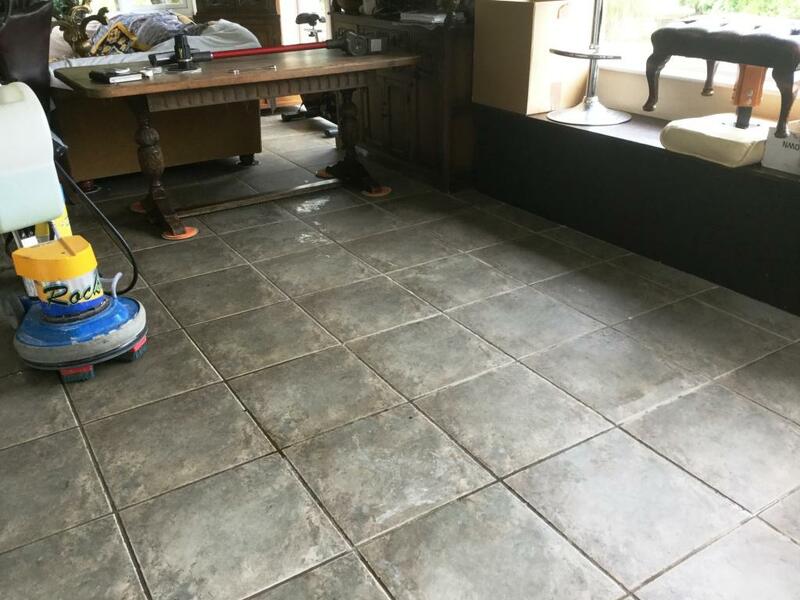 In this case, the tiles were Chinese Slate, and were proving very difficult for the property owner to keep clean due to the lack of sealer to protect against dirt and stains. The grout in particular was quite discoloured and of increasing concern to the owner, prompting up the decision to contact me about a restoration job. 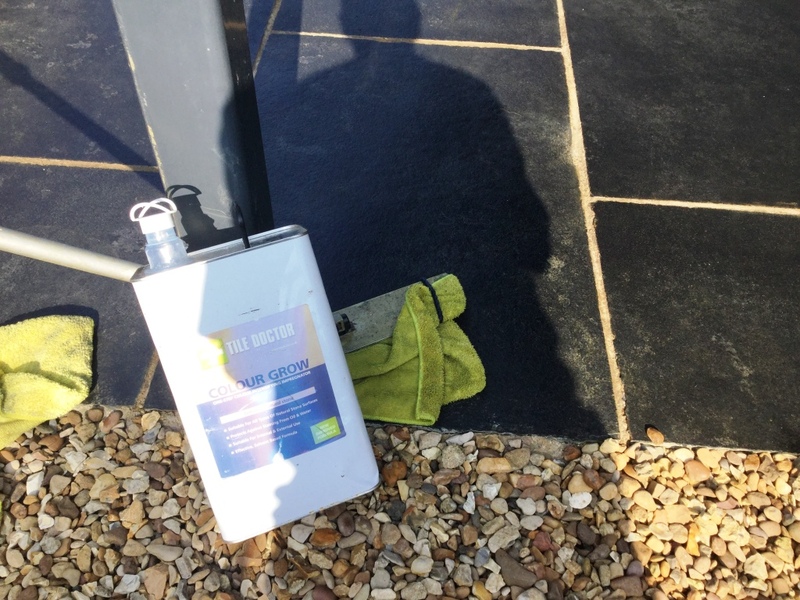 I agreed to the work – consisting of a deep clean and the application of a new sealer – and travelled down to the property in Norton near Daventry in Northamptonshire to see what results could be achieved. My primary concern when approaching this challenging restoration was to clean the grout which as aforementioned, had become dirty and discoloured. Most tiled floor owners will understand the pain of keeping grout lines clean; regular professional attention is often the easiest solution. In this scenario, the grout was cleaned using a strong dilution of the alkaline cleaner, Tile Doctor Pro Clean, mixed with warm water. This was applied directly onto the grout lines using a spray bottle and scrubbed in using a hand held grout brush, as shown in the second photo. With the grout taken care of it was now time to turn attention to the Slate tiles themselves which I tackled with more Pro-Clean but worked in this time using a black scrubbing pad fitted to a rotary machine. 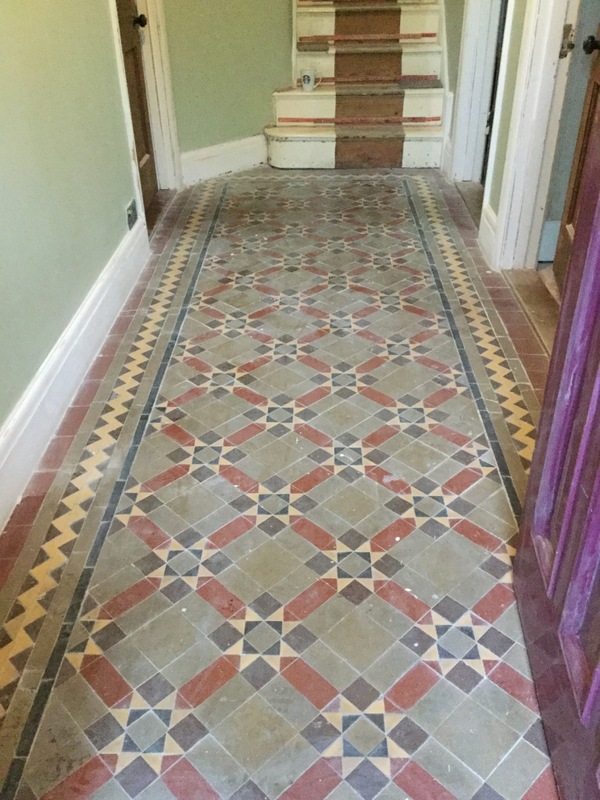 This process also stripped away any traces of old, ineffectual sealers from the tiles. This process was followed by machine rinsing the floor with cold water to neutralise the chemicals in preparation for sealing. Additionally, any particularly stubborn areas of old sealant were removed by hand brushes in combination with undiluted Tile Doctor Remove & Go remover. These areas were also rinsed to fully remove excess cleaning products. I allowed the floor to dry completely overnight with a dehumidifier installed to assist the drying process. Upon my return to the property the next day I carefully checked the floor was completely dry, since even the slightest amount of excess moisture can cloud the fresh sealer and damage its performance. Once satisfied that the floor was completely dry I applied five coats of Tile Doctor Seal & Go sealer to achieve a high shine finish, as per the customer’s request. This is the most popular finish for this type of flooring, as it its aesthetically pleasing whole with the assurance that the sealer is providing robust surface protection against stains and dirt. The last photo shows the finished result with which the customer was extremely happy! Floors like this can so easily degrade into a terrible state without the right care so it’s always a great pleasure to make such a difference. 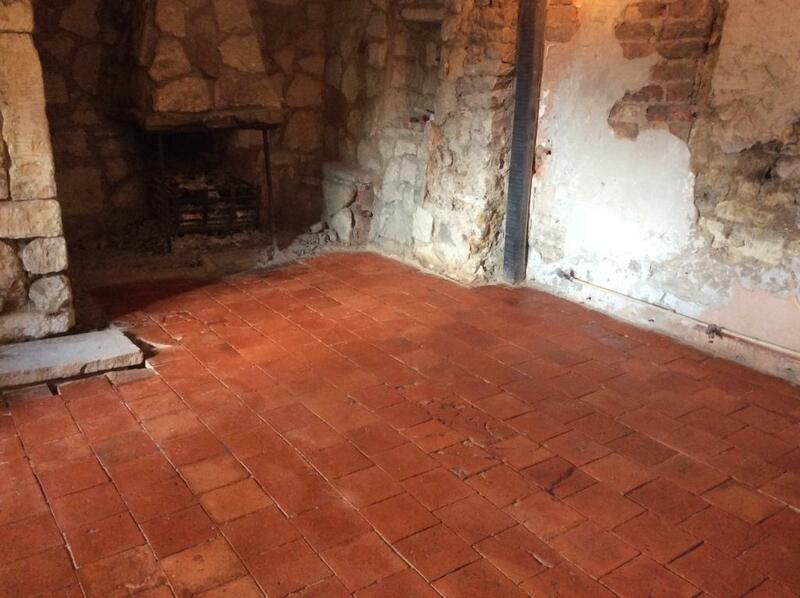 This red Quarry tiled floor was in the dining room of a house in the East Northamptonshire market town of Higham Ferrers. Despite being an original feature of the property, the floor had never been taken care of and looked to be completely beyond salvation and what must be the worst condition I have seen in a long time. When I first inspected the floor it became very quickly clear that it was suffering from severe damp problems, covering roughly two thirds of the entire surface area. I took damp meter readings and discovered that the floor was saturated as there was no damp proof course installed. This problem was compounded by staining from the glue residue used to hold down the linoleum which previously covered the tiles. But while some floors look beyond salvation, I was certain I could restore this one to an acceptable appearance. A hallway in the property had the same Quarry tiles, but these had been painted with a red tile paint at some point in the past, which itself had worn off in the main traffic areas. These tiles had no damp problems and so it would just be a case of removing the rest of the paint and providing a thorough cleaning before sealing. 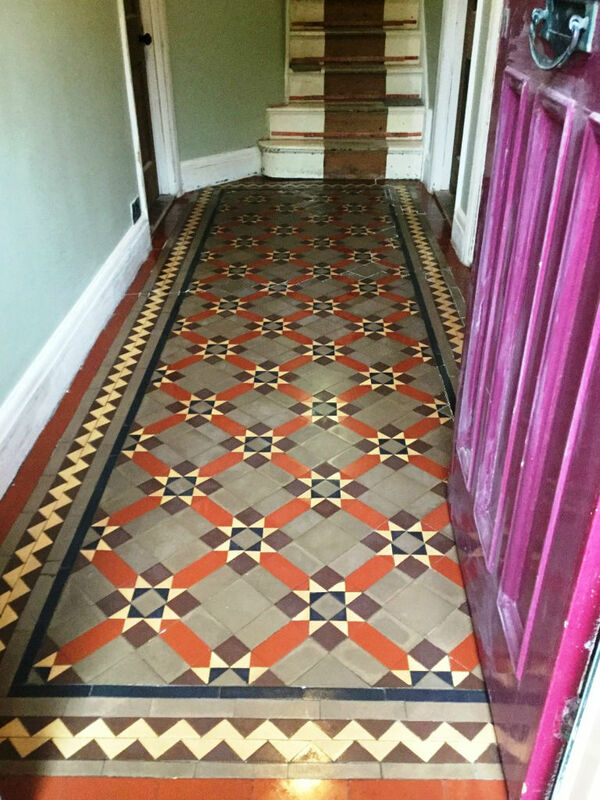 The customer was also keen that the dining room be restored as near as possible to the hallway tiles to try and achieve a uniform finish. I did inform the customer that due to the vast difference in condition this would be a challenge but I would do my best. A quote was given and work was booked in at the customer’s convenience. Before beginning the restoration, I carried out a patch test to see which products would achieve the best results on the tiles. After vacuuming and mopping the floor to remove the immediate layers of muck, I decided my best course of action would be to use the heavy duty stripper, Tile Doctor Remove & Go. Working in four separate sections, I applied the product then scrubbed it using a black stripping pad to a rotary machine. Remove & Go is designed to break down old sealers, paints and glues, making it an ideal product for use in this particular situation. This area was then rinsed off with a wet-vac machine and the process was repeated on the rest of the floor. I then inspected the floor and noticed a few shiny patches where the old sealer hadn’t been fully removed, so I tackled these stubborn areas by hand with a second application of Remove & Go. A final rinse was given to the whole floor to make sure no excess cleaning products remained. After completing the cleaning process and removing as much water as possible using a wet vacuum, I installed a dehumidifier and left the tiles to dry for an entire month. Upon my return to the property I took damp meter readings to ensure the tiles were fully dry prior to the application of the sealer. This is crucial as excess moisture can cloud the sealer, rendering it less effective at protecting the stone. 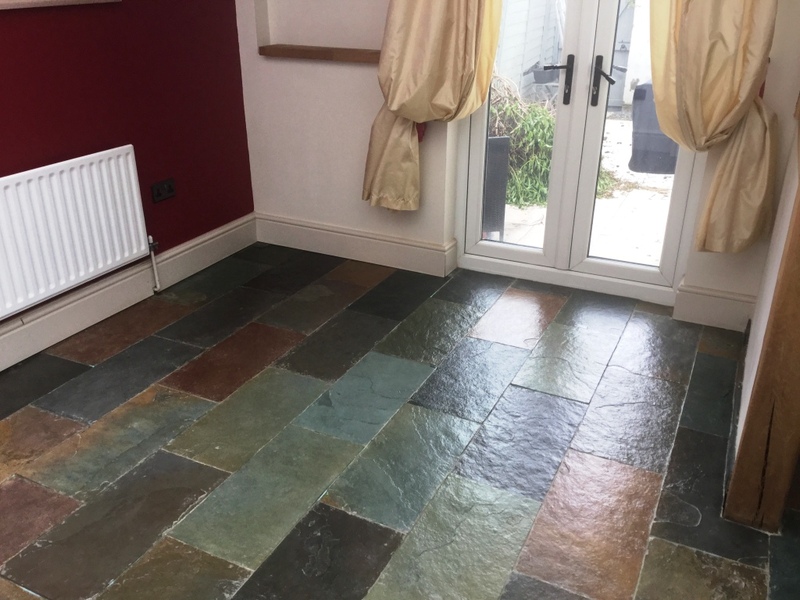 I opted to use Tile Doctor Colour Grow to seal the floor primarily because is fully breathable and therefore ideal for floors that are prone to damp problems. It has the added bonus of being a colour intensifying sealer that really enhanced the natural reddish shades in the Quarry. 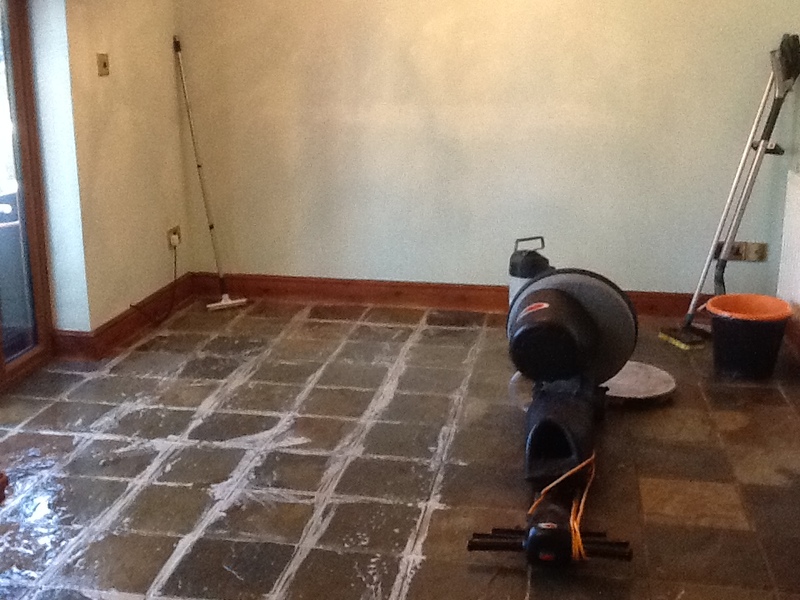 As the pictures show, there was a vast improvement in the floor and the customer was pleased with the results. It really goes to show that while a floor might look beyond salvation, wait can in fact be restored to an acceptable condition using the right methods and products. 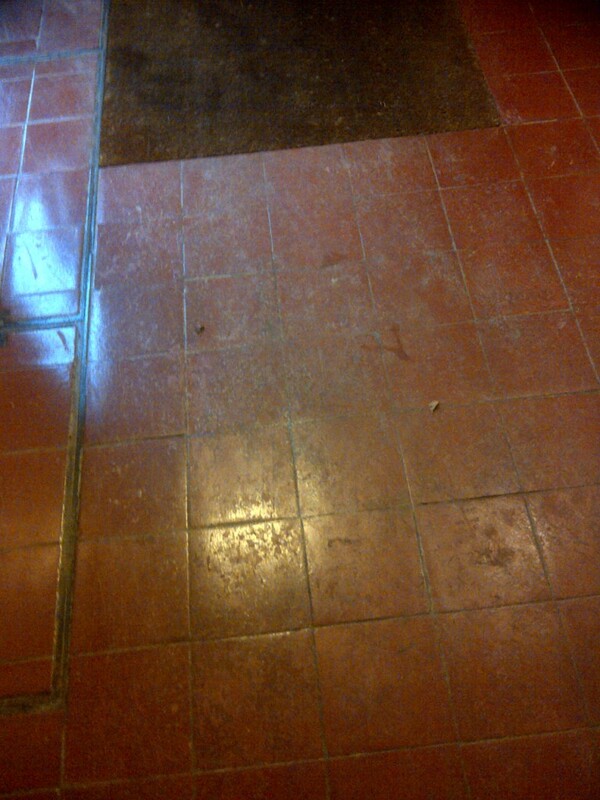 The customer was also given advice on maintenance of this type of floor to keep it looking its best for years to come.